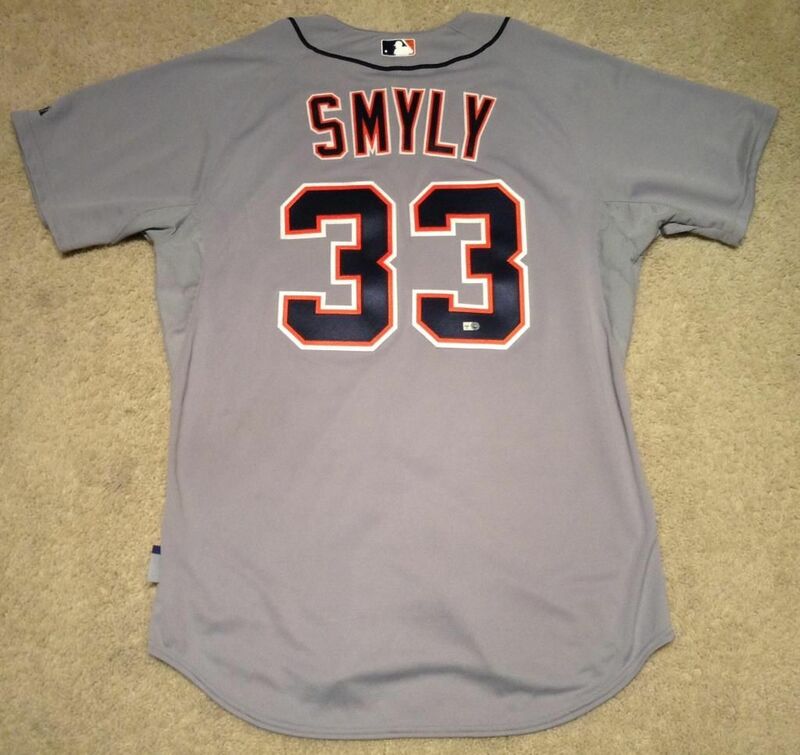 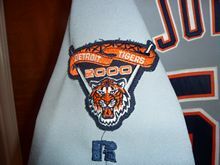 The Tigers adopt double knits. 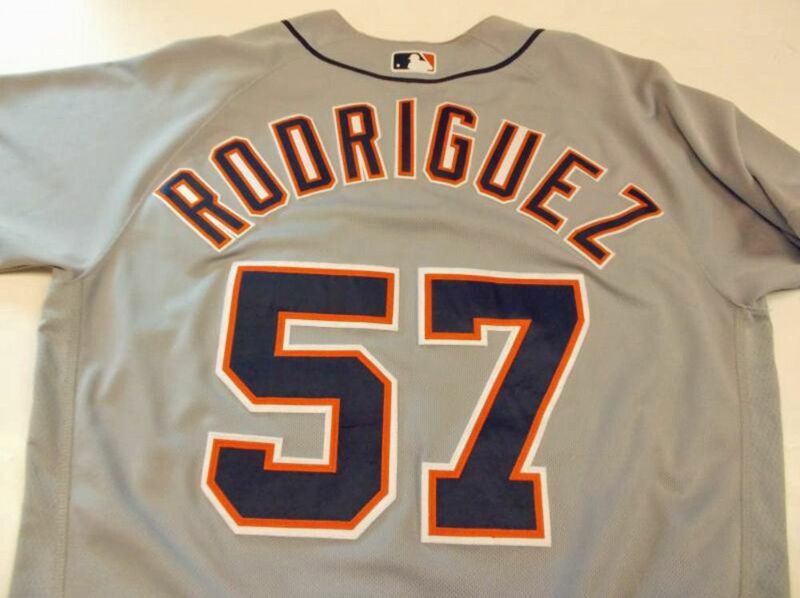 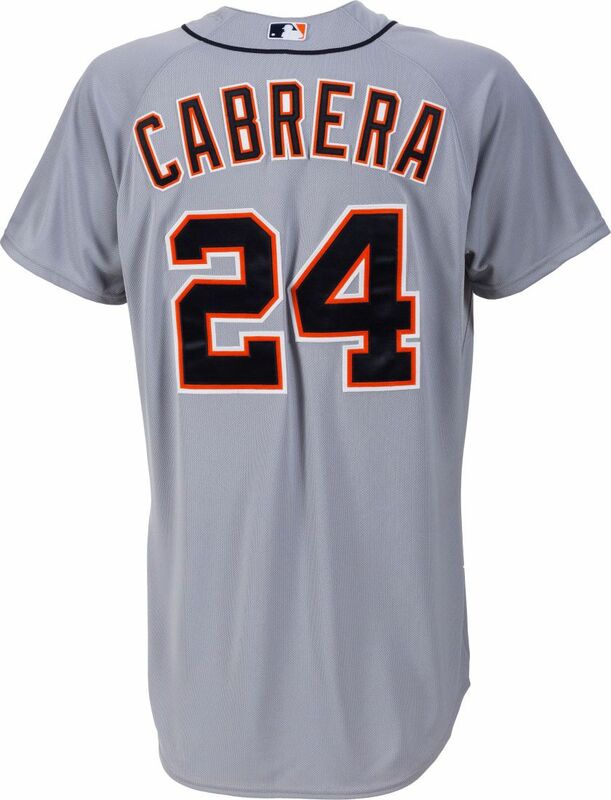 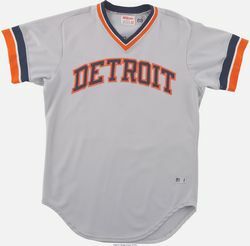 The home jersey stays as is, the road jersey becomes a pullover and orange returns. 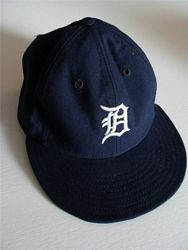 A new road cap debuts. 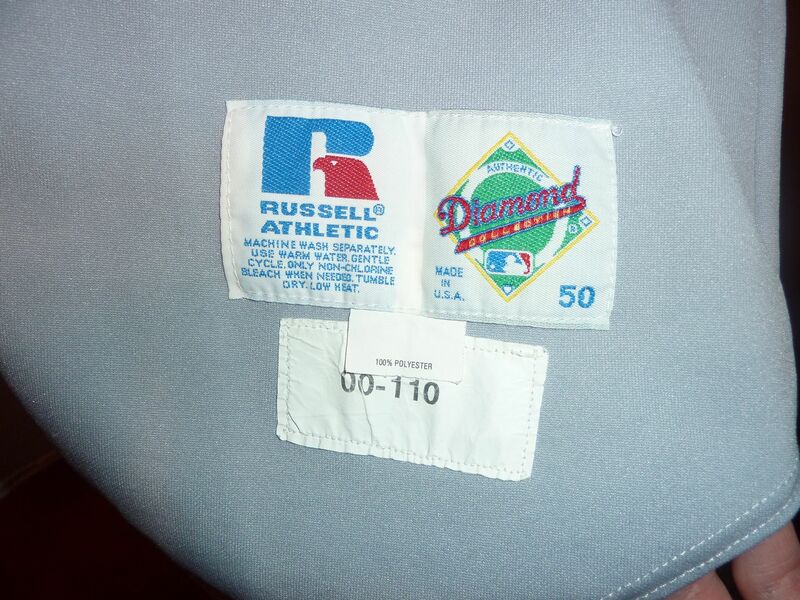 White trim around logo removed on road cap. 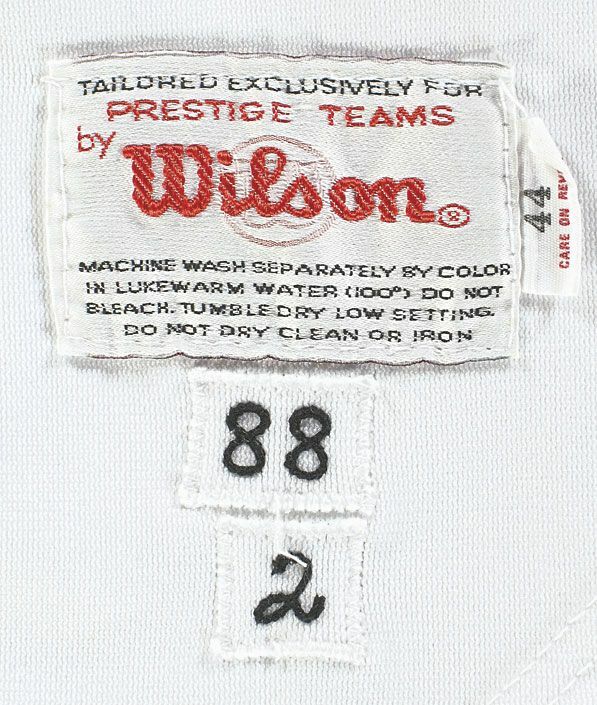 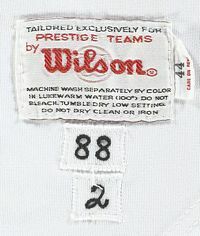 Road jersey changes from pullover to button-down. 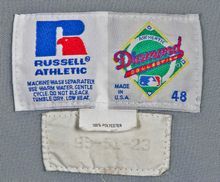 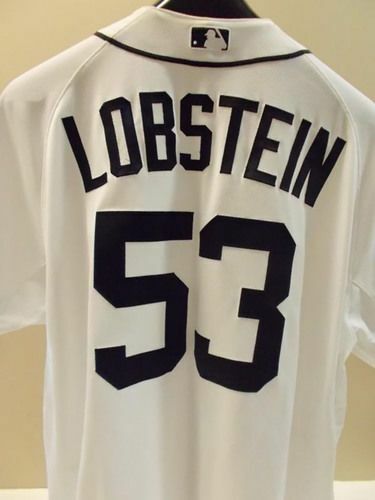 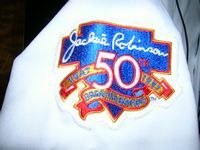 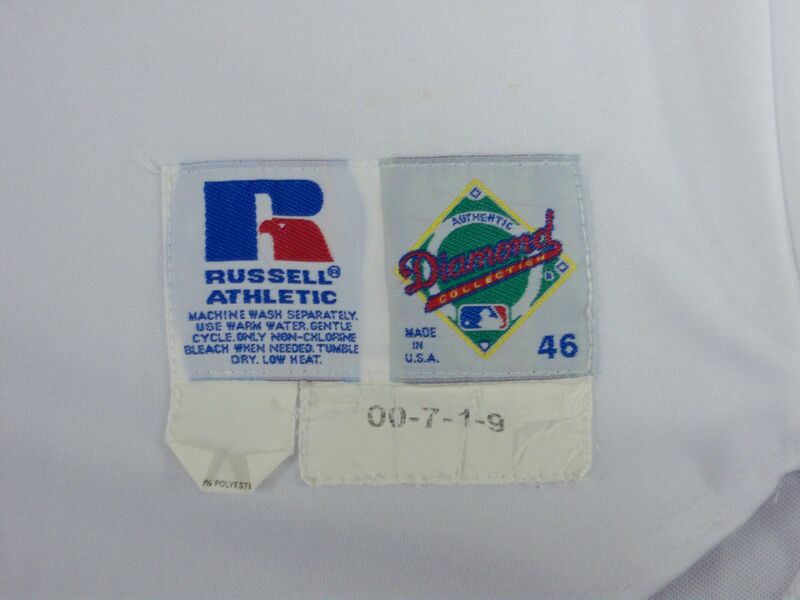 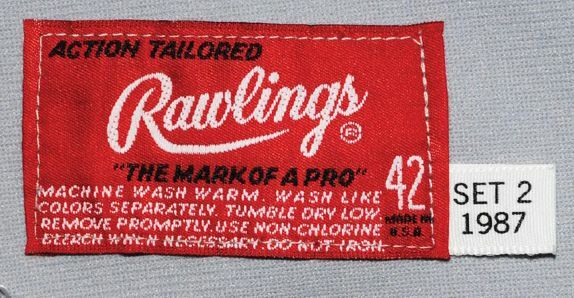 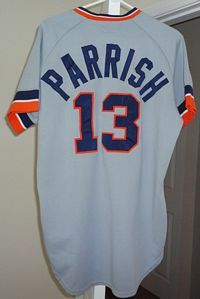 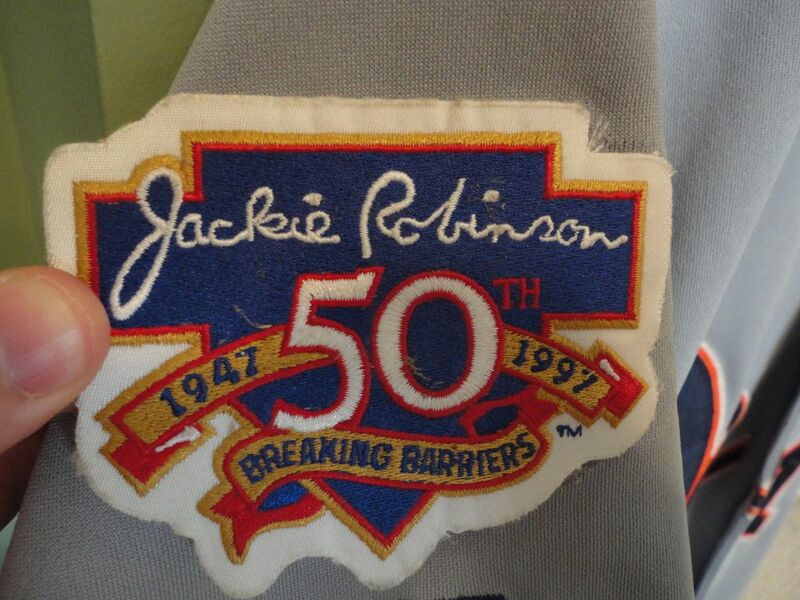 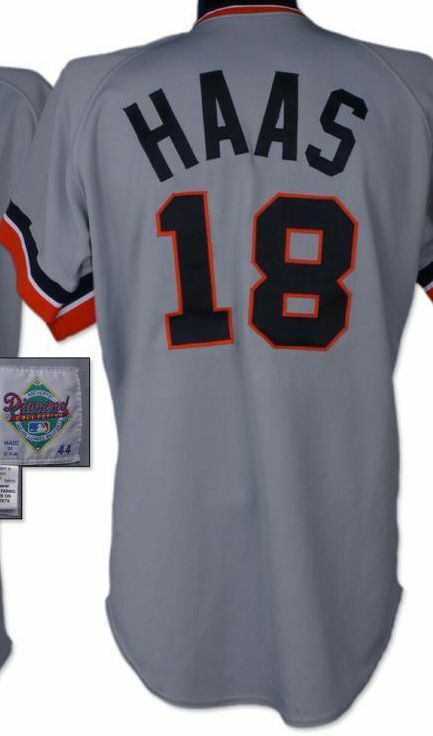 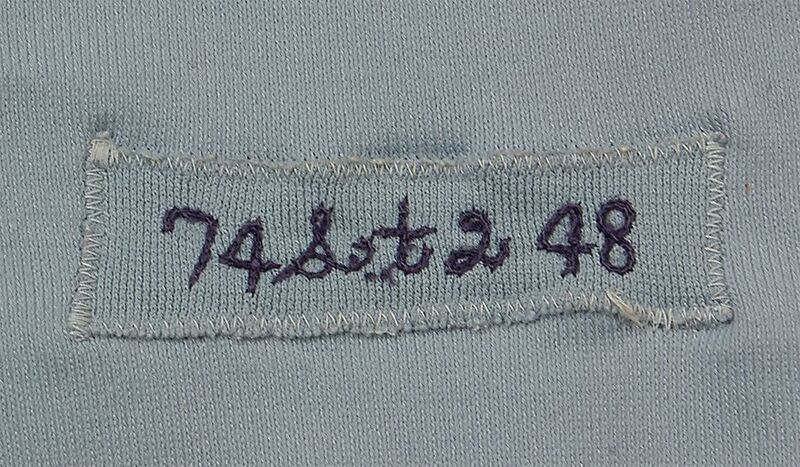 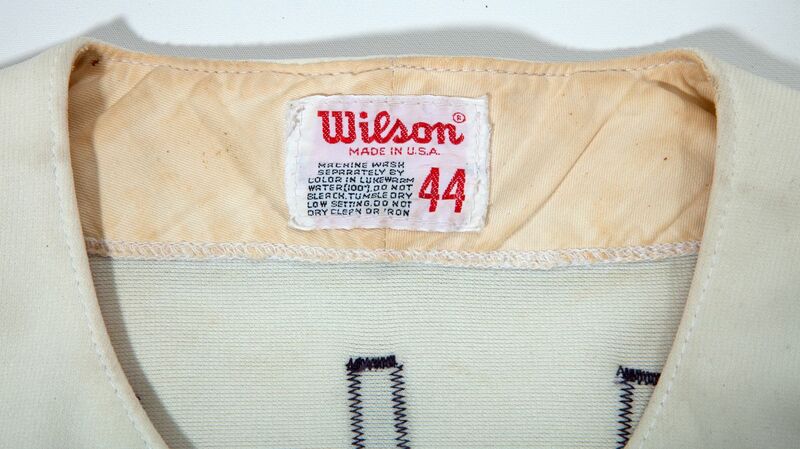 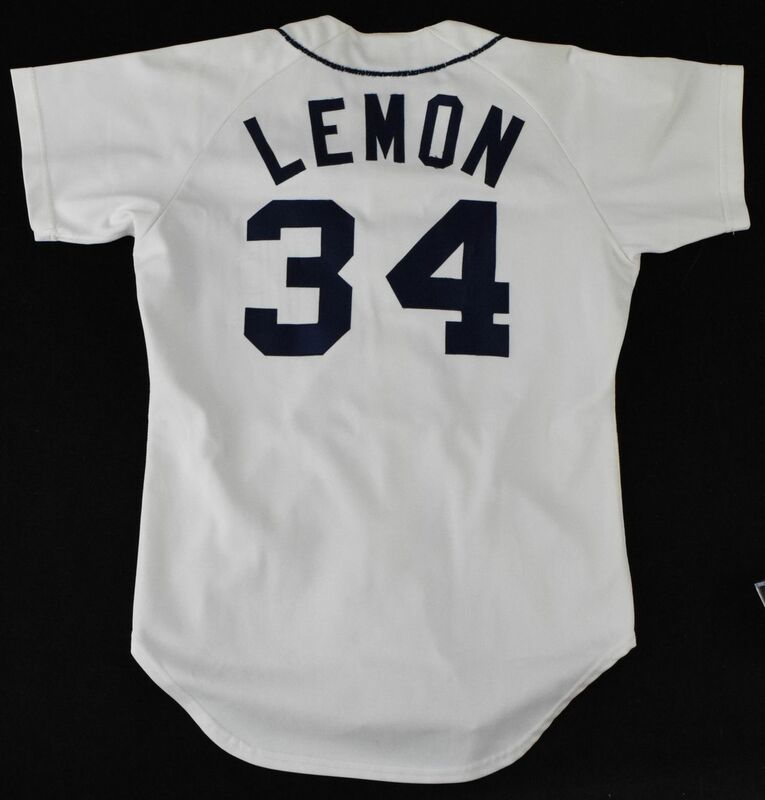 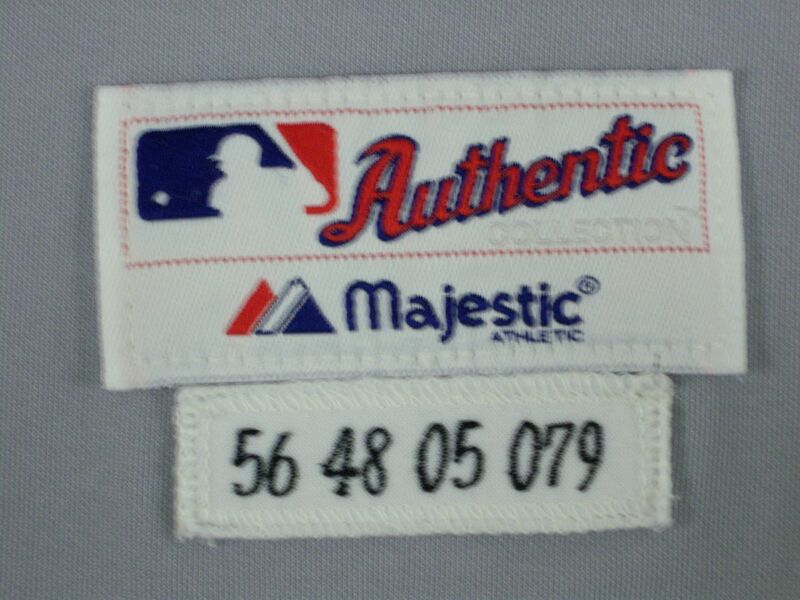 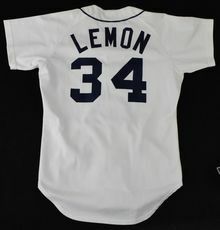 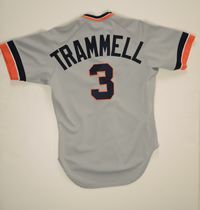 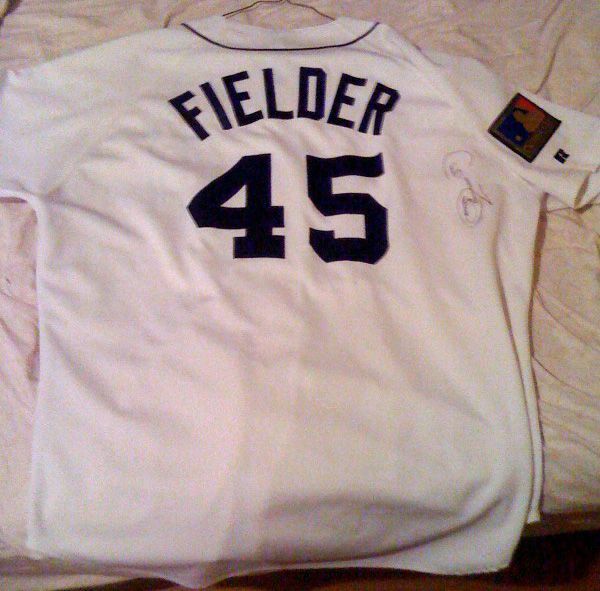 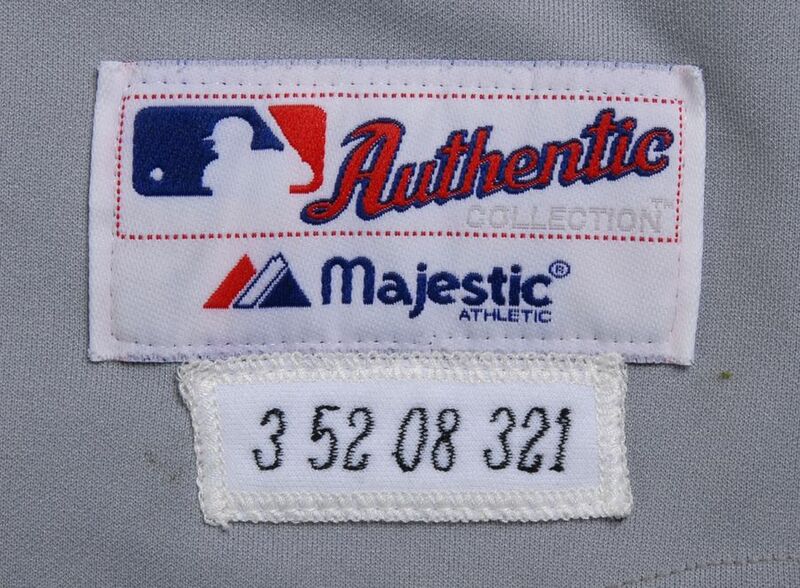 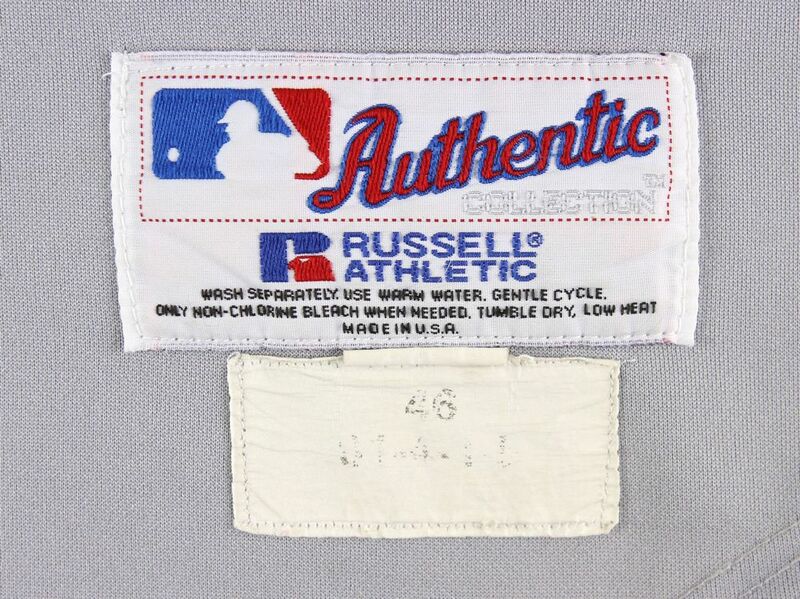 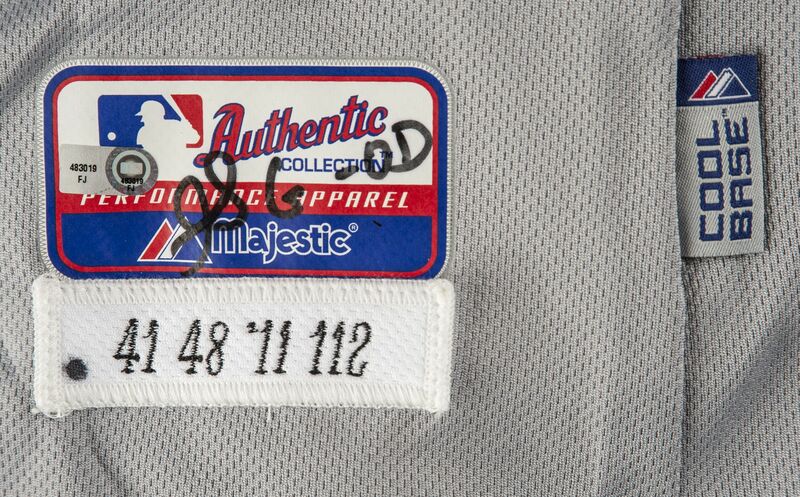 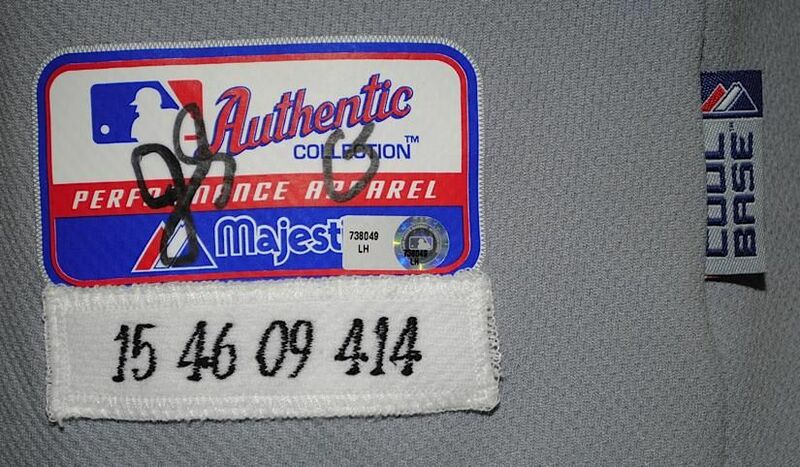 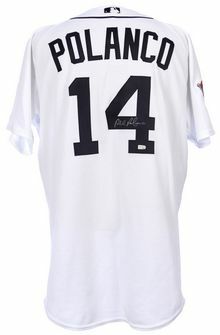 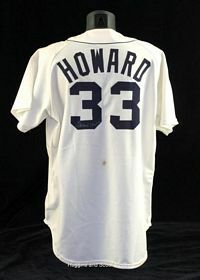 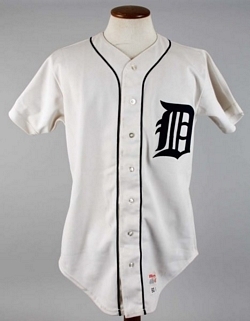 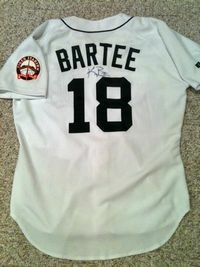 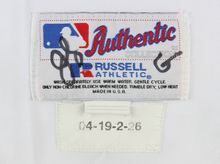 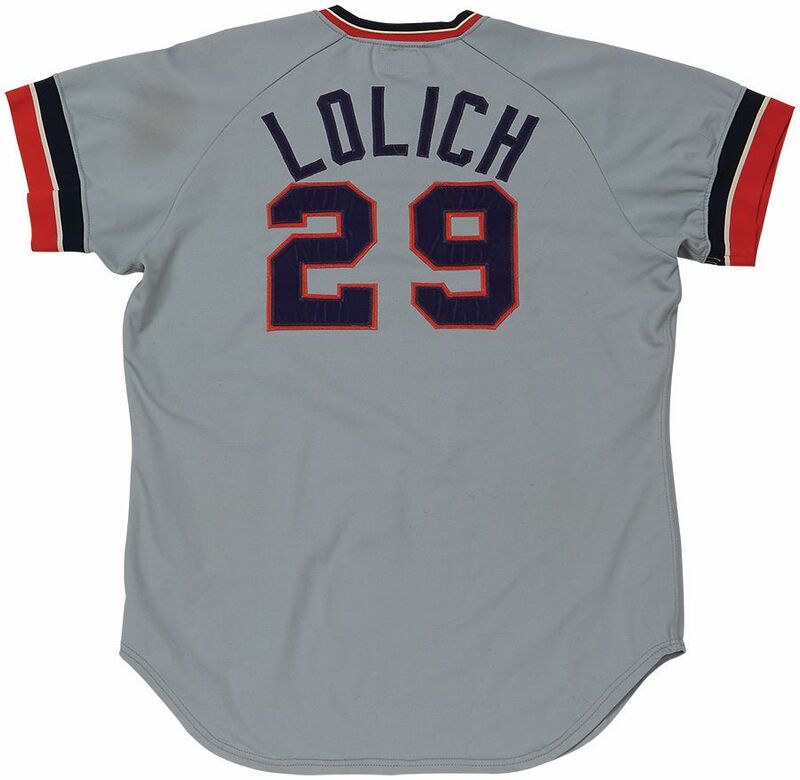 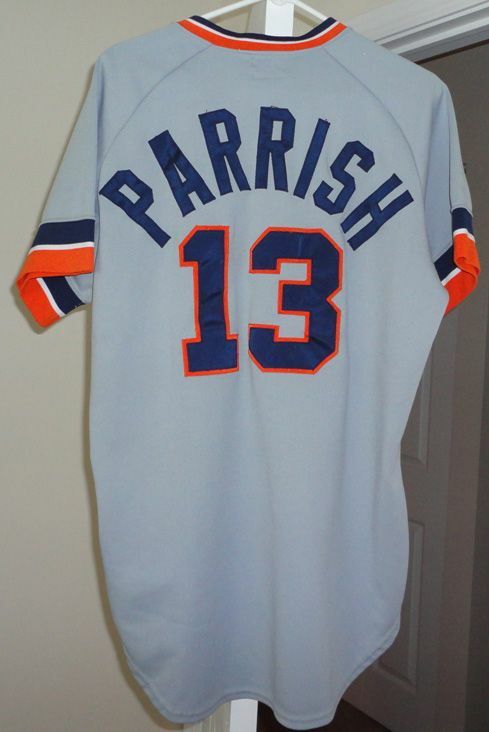 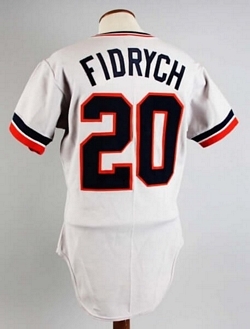 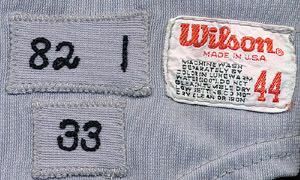 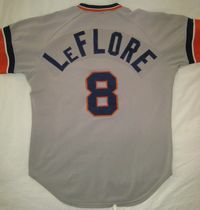 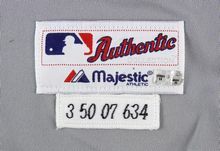 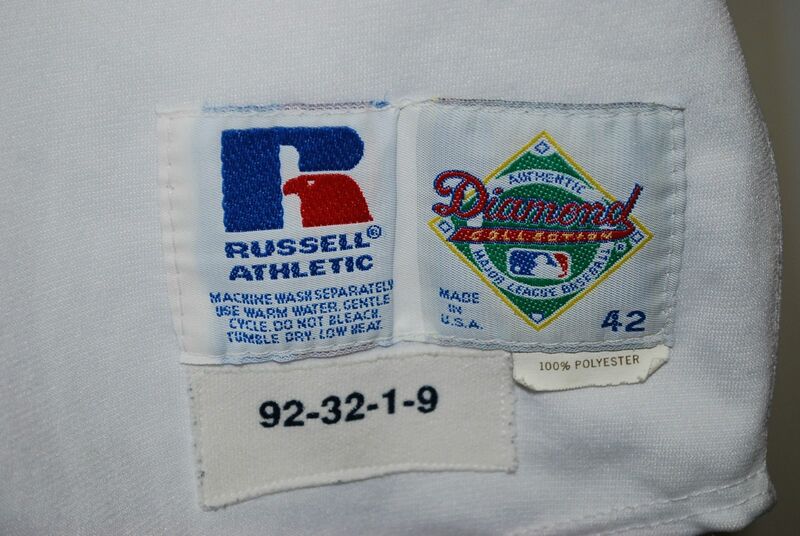 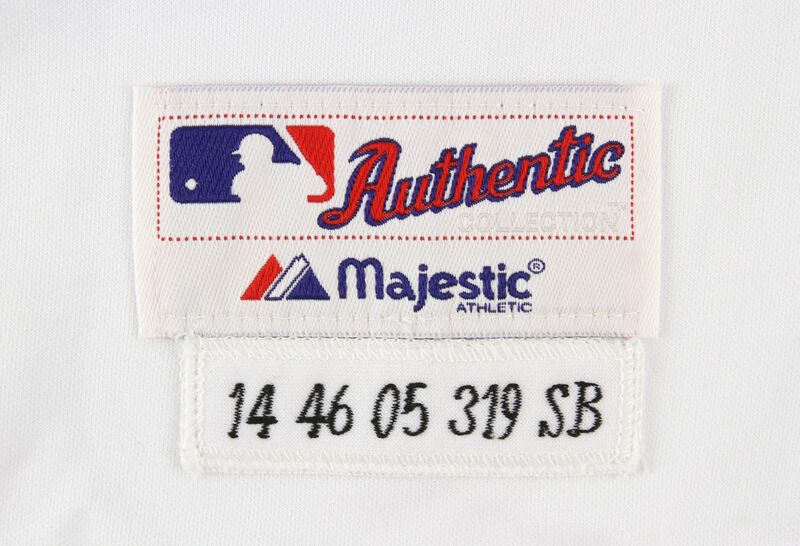 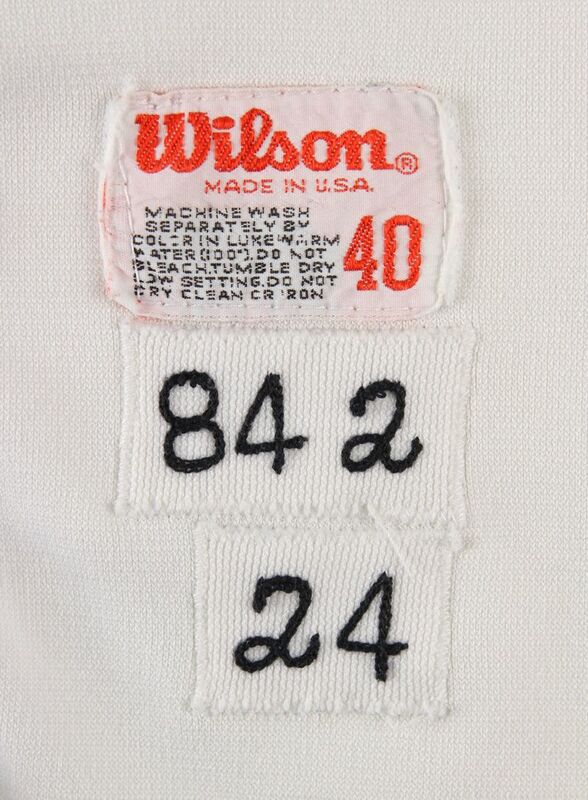 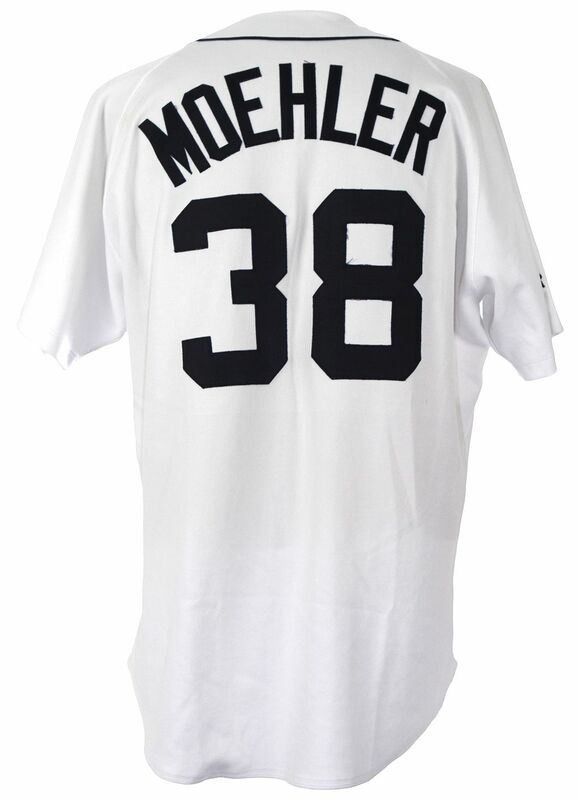 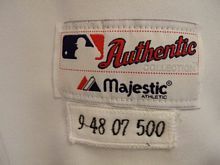 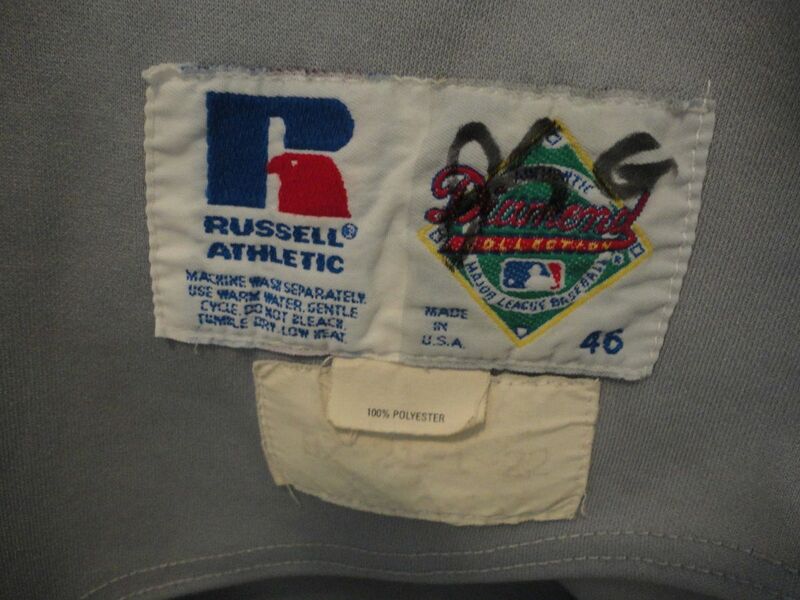 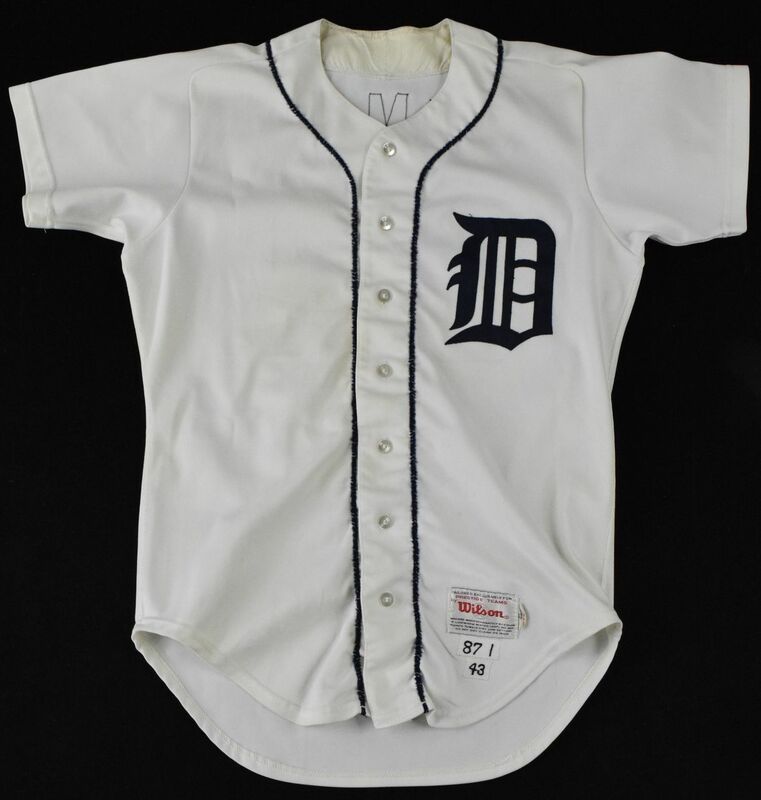 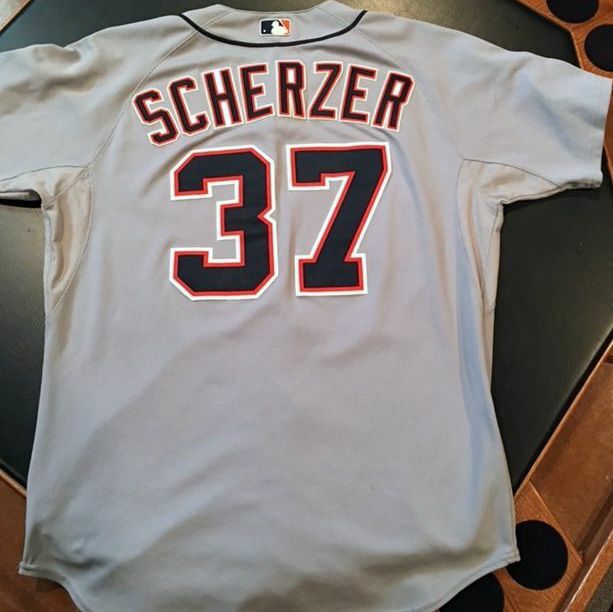 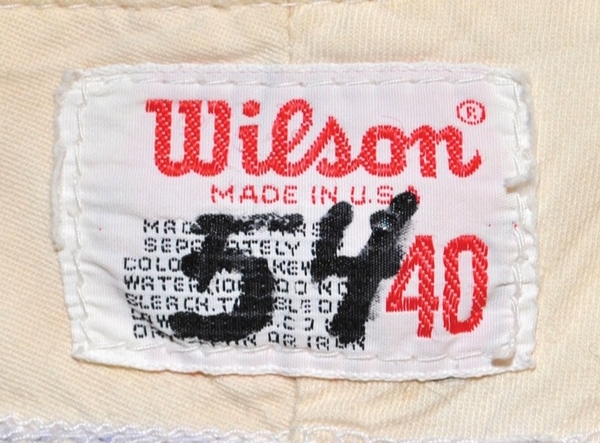 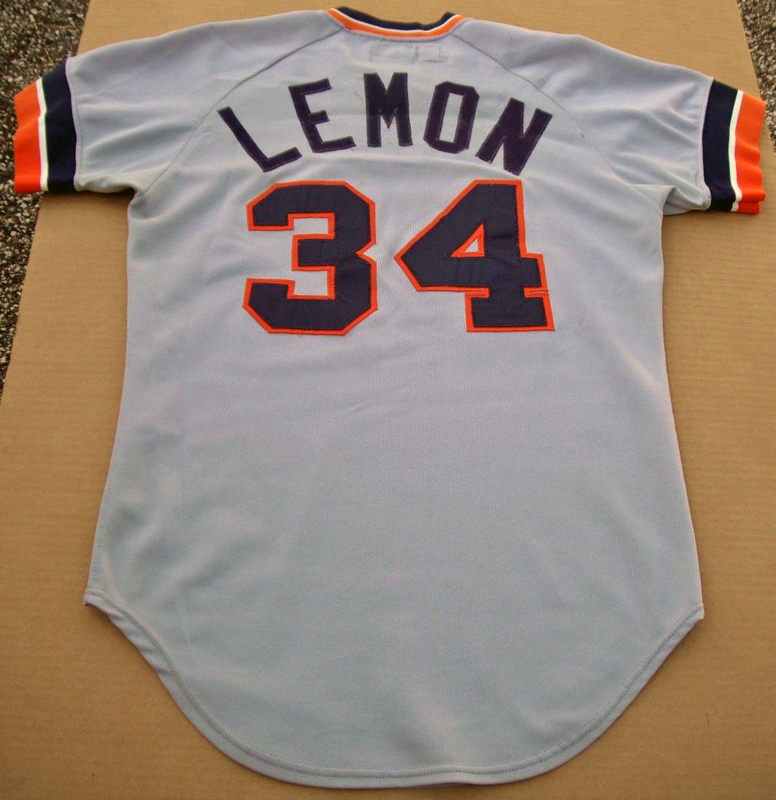 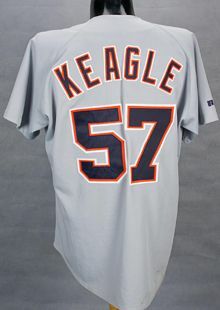 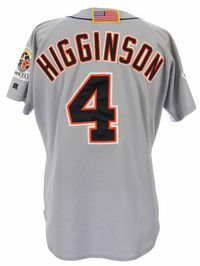 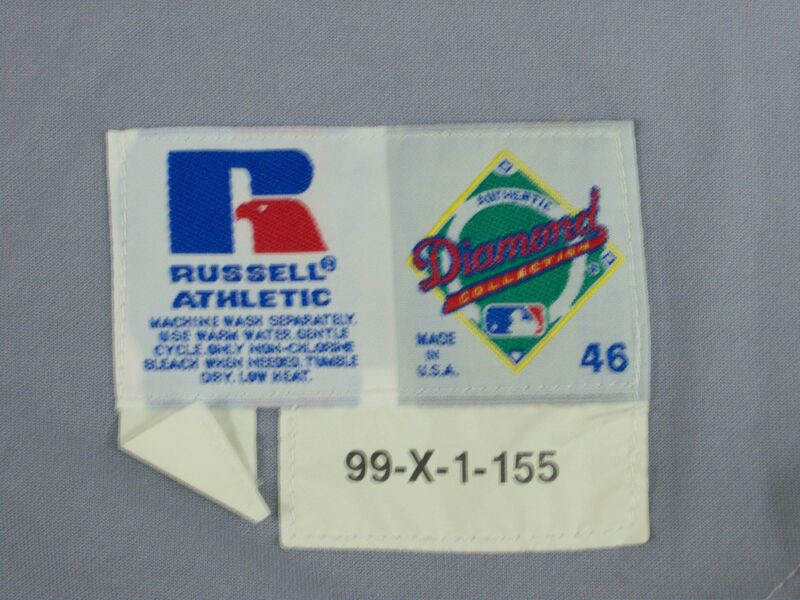 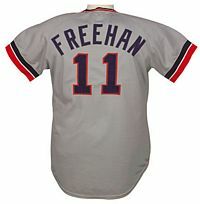 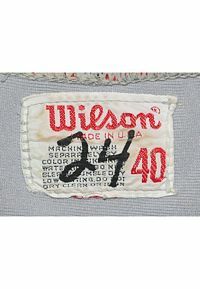 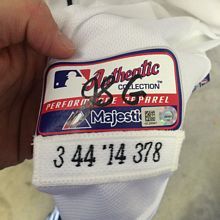 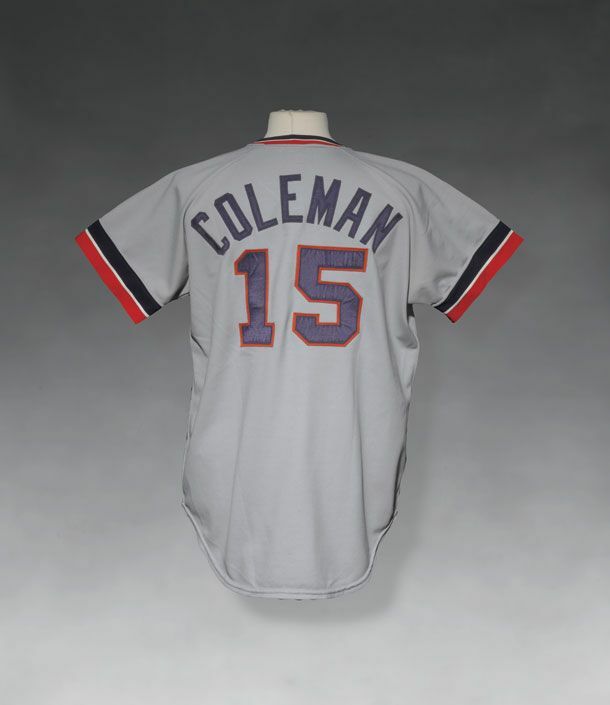 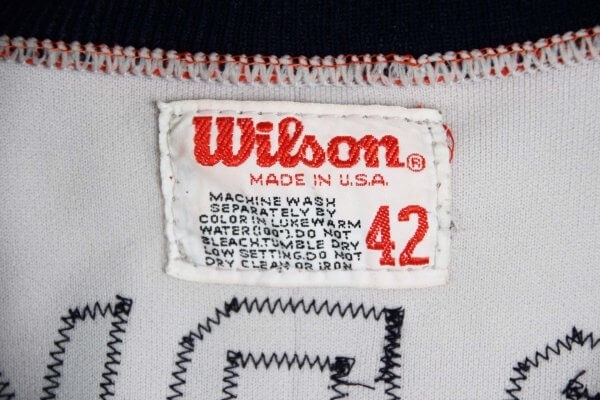 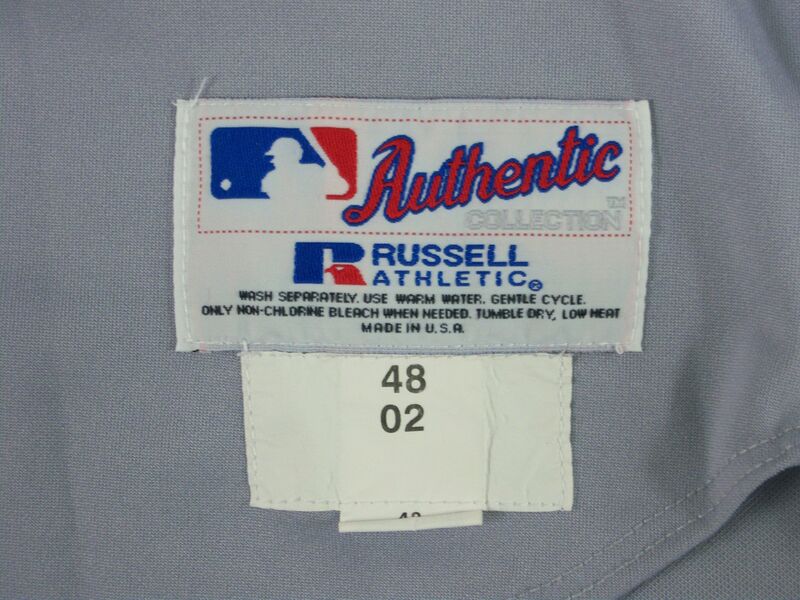 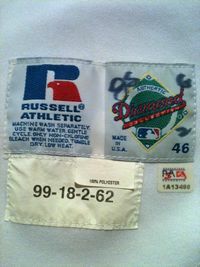 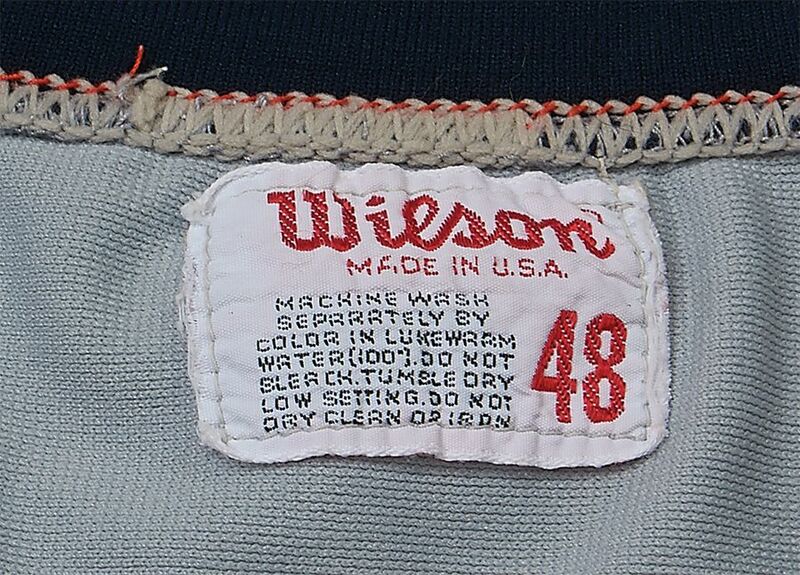 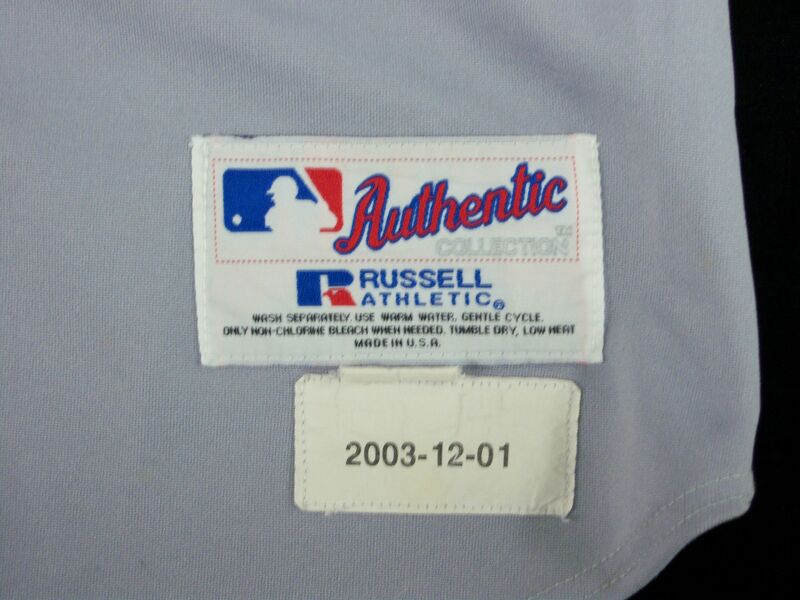 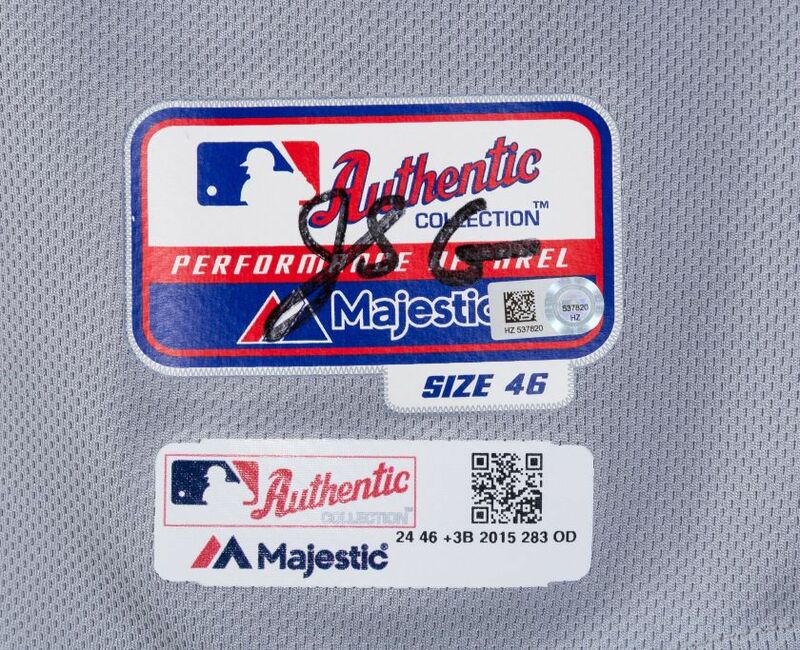 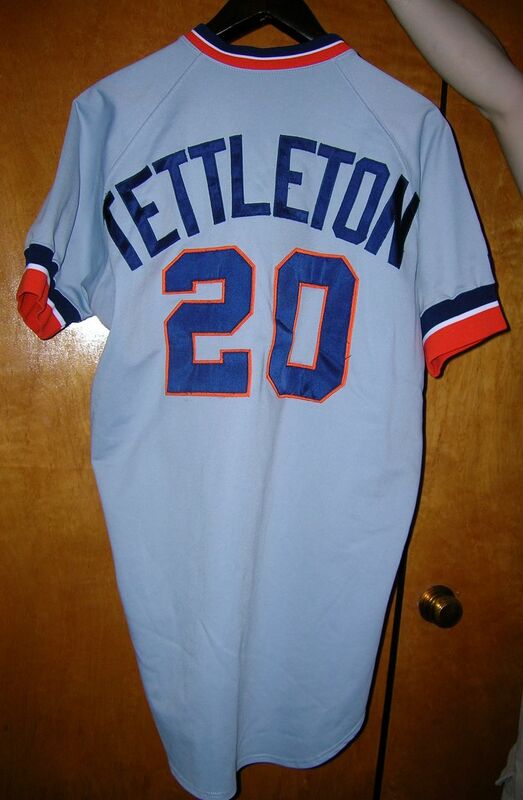 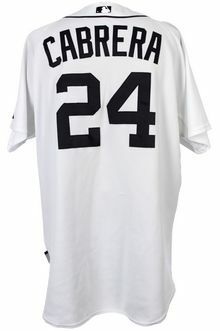 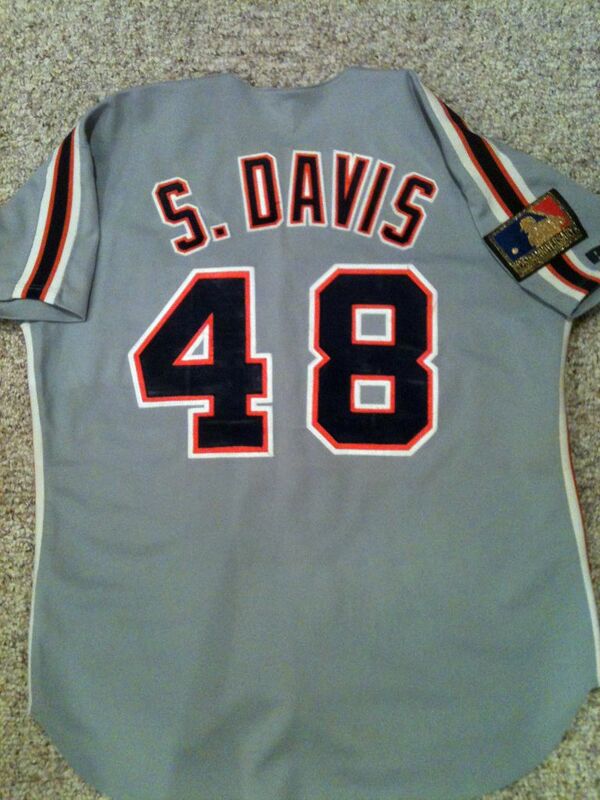 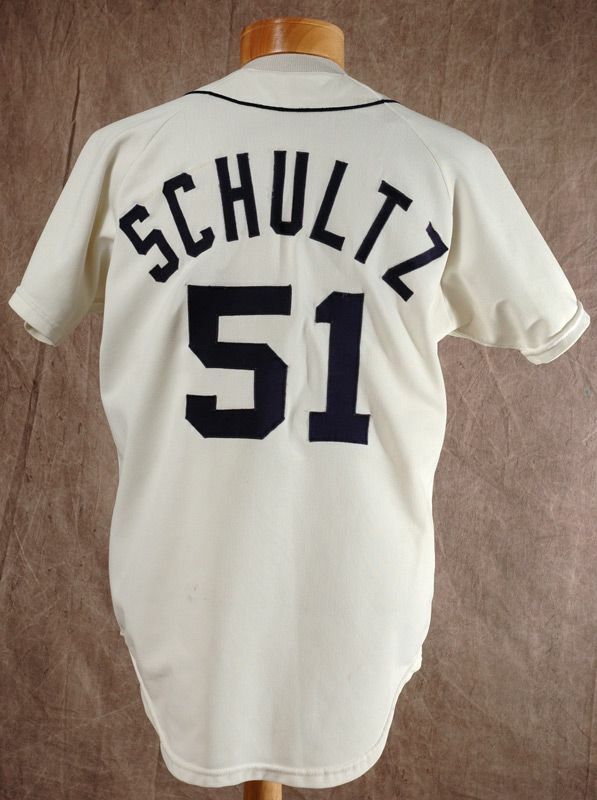 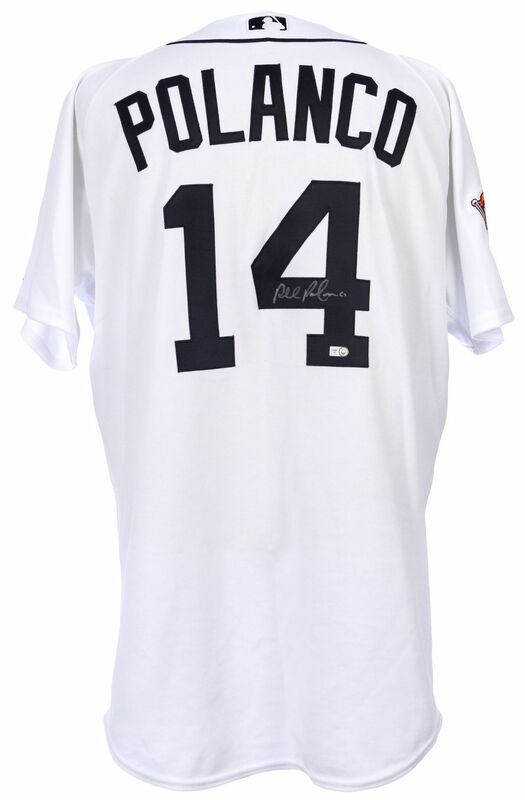 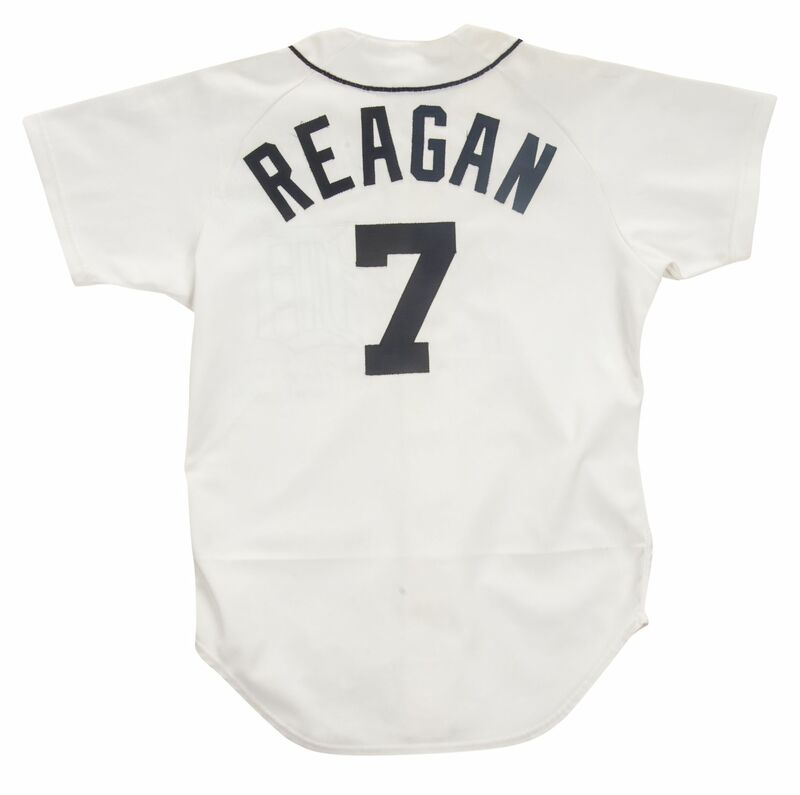 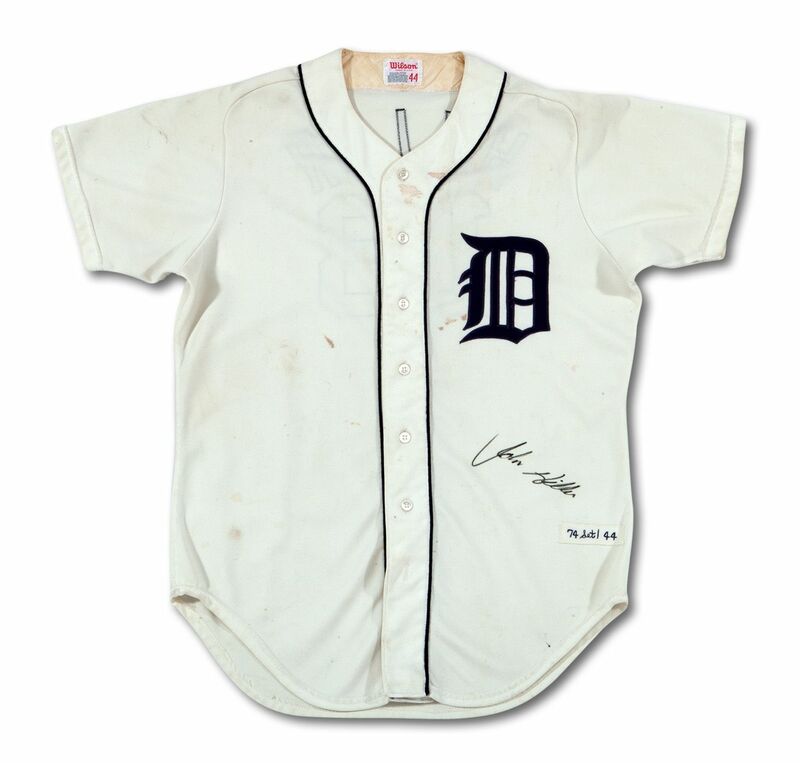 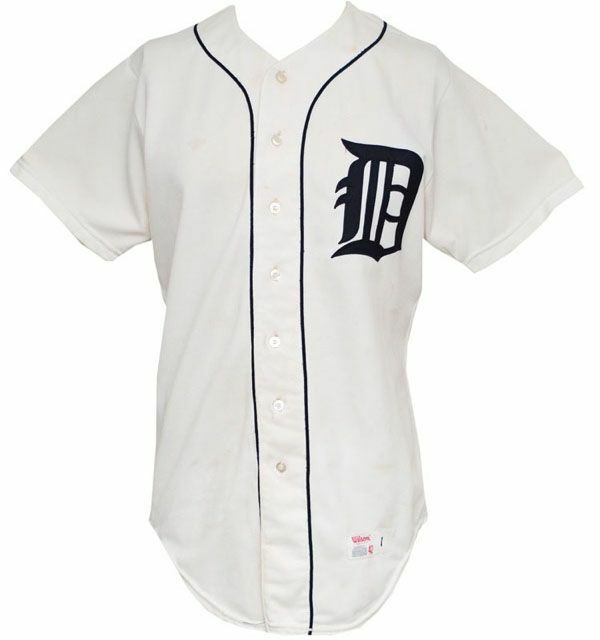 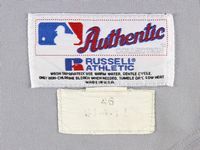 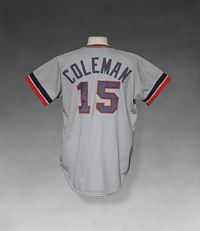 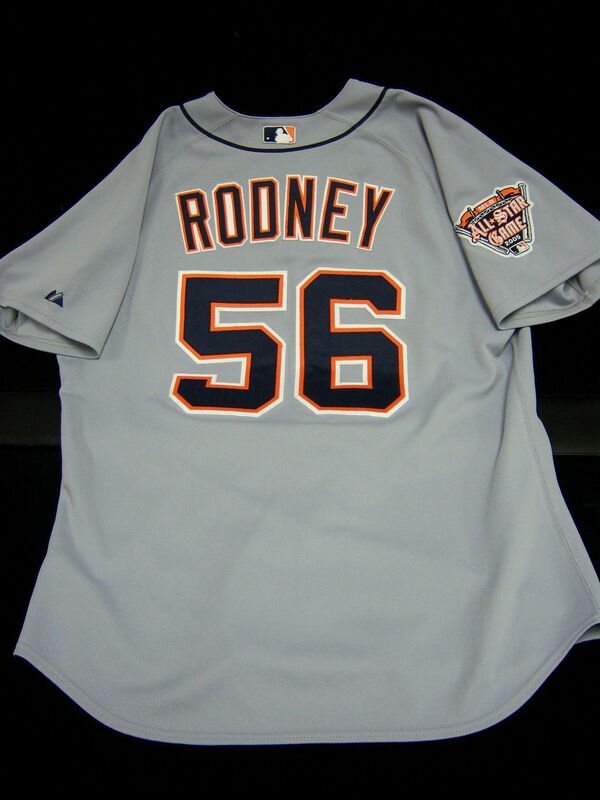 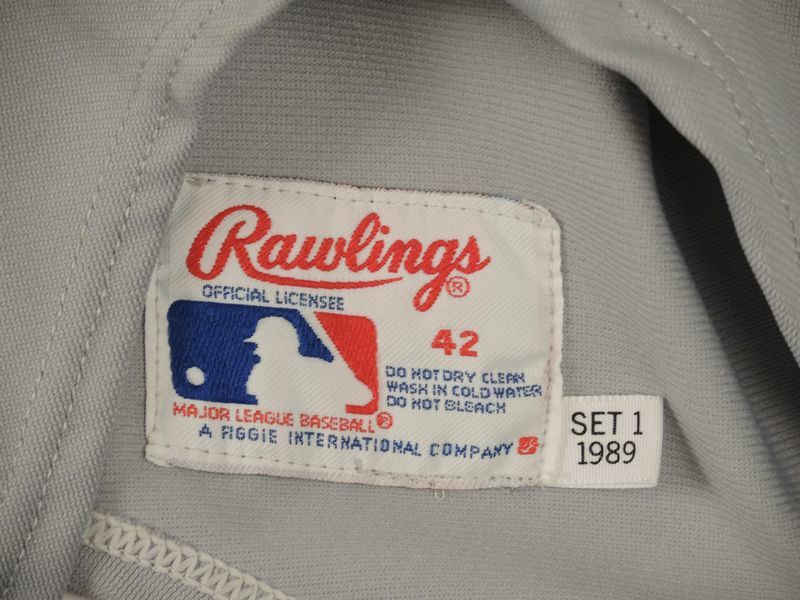 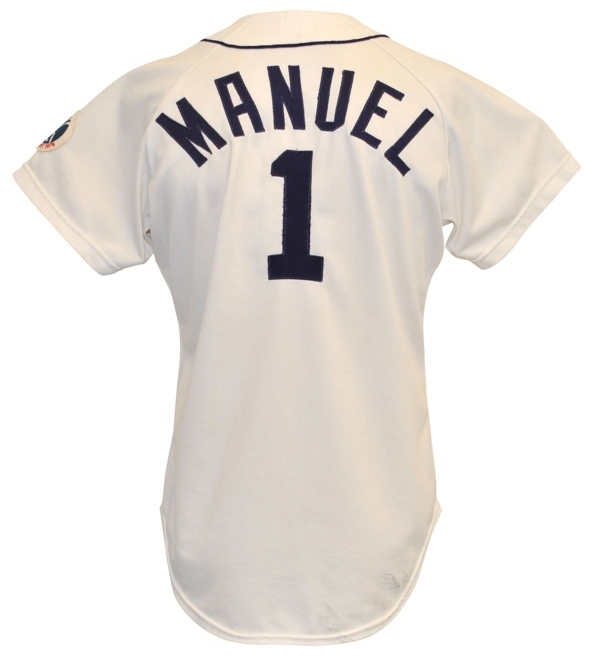 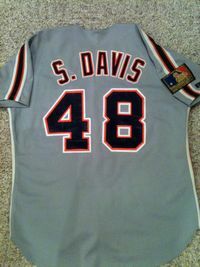 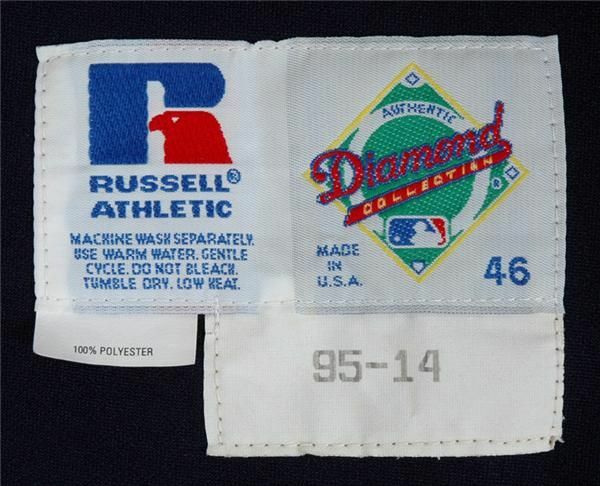 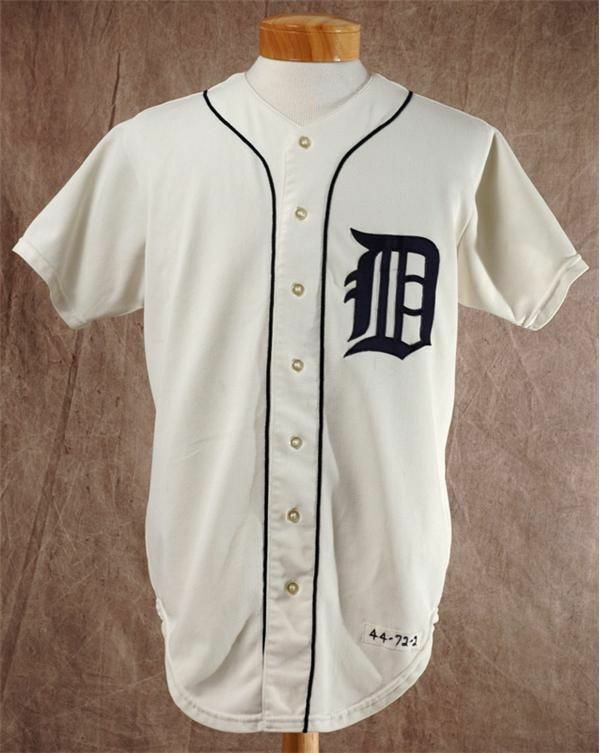 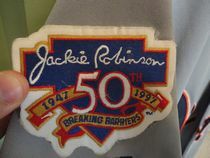 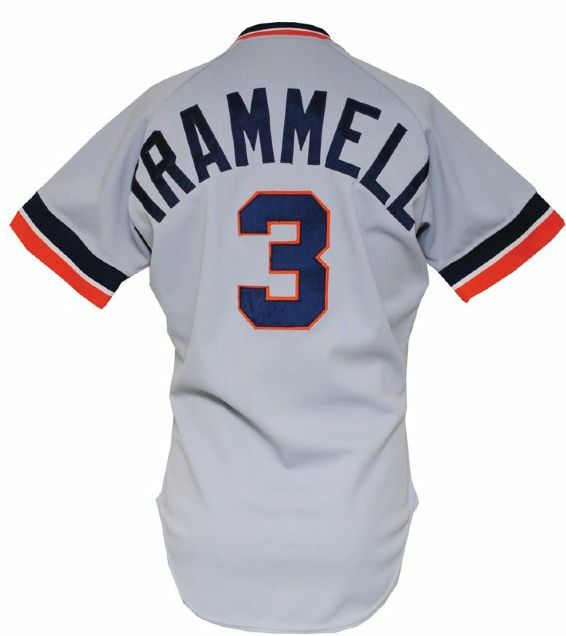 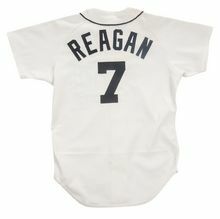 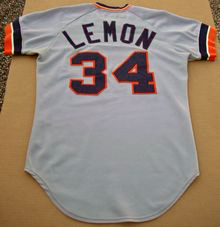 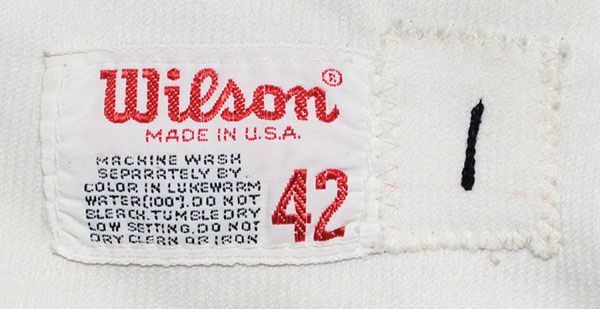 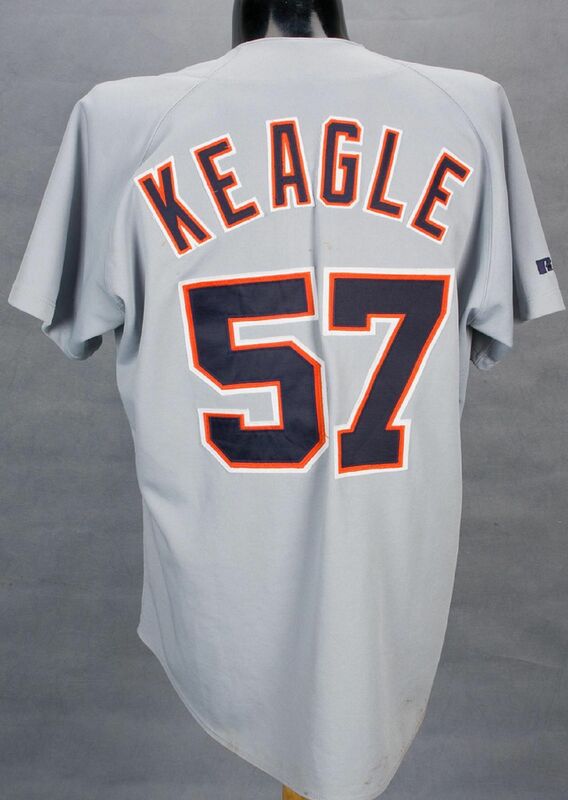 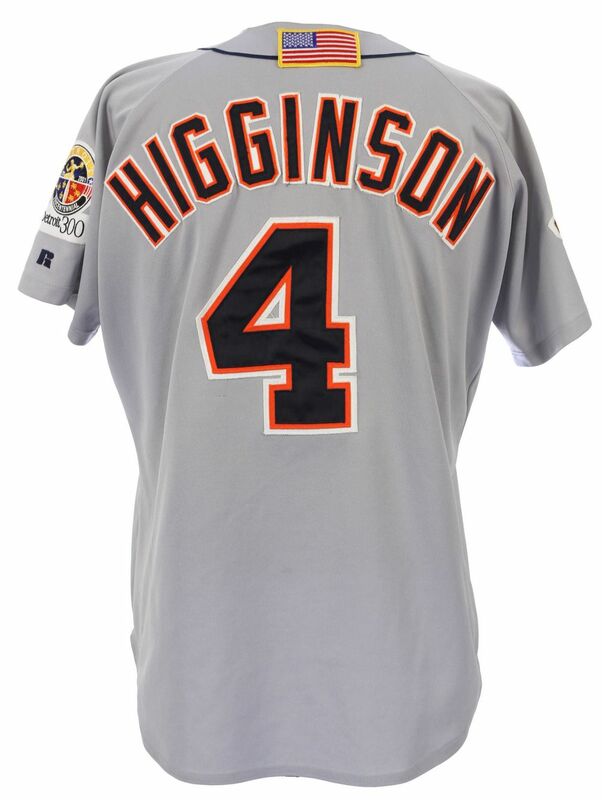 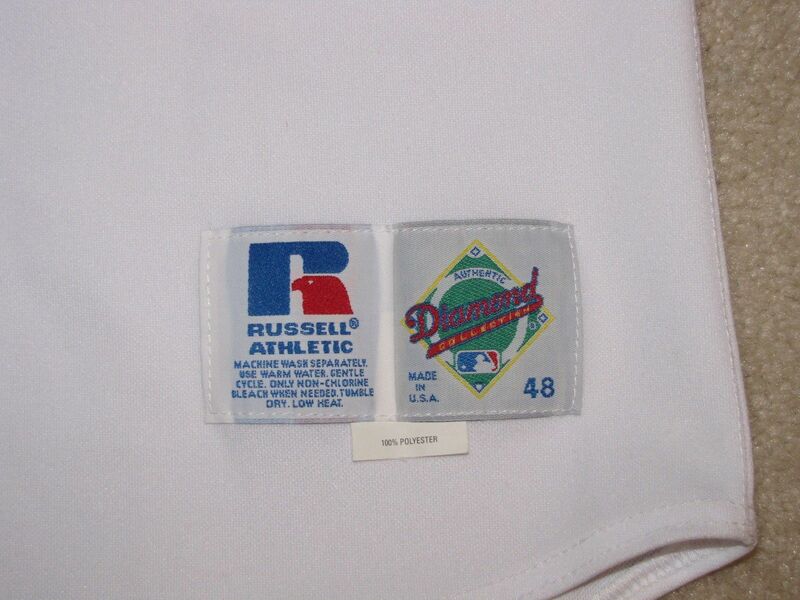 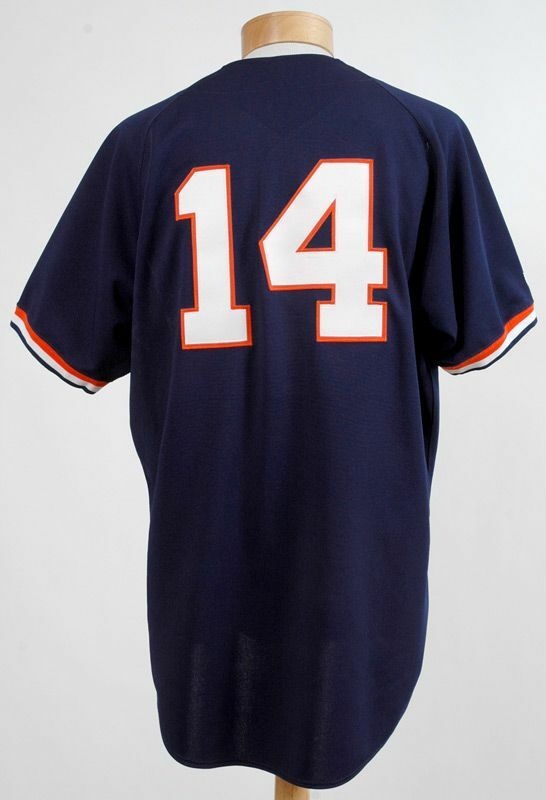 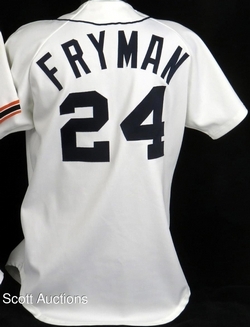 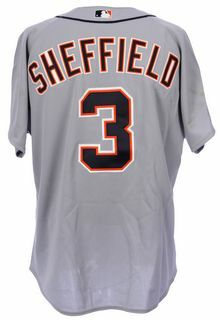 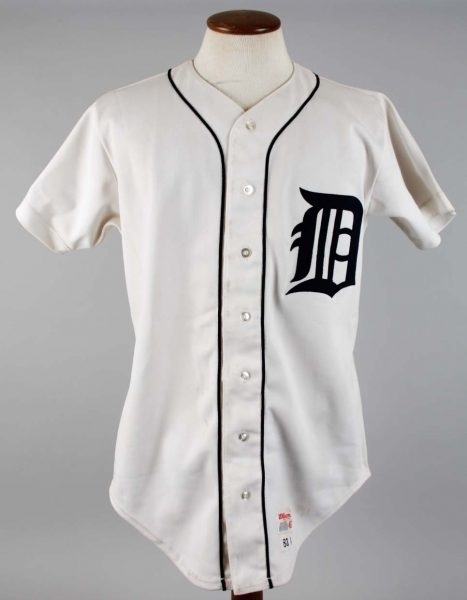 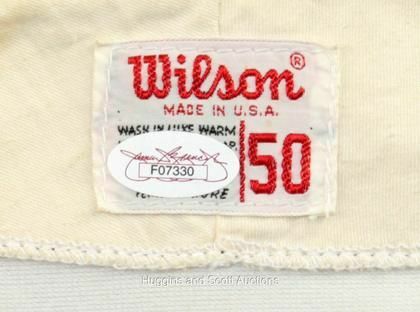 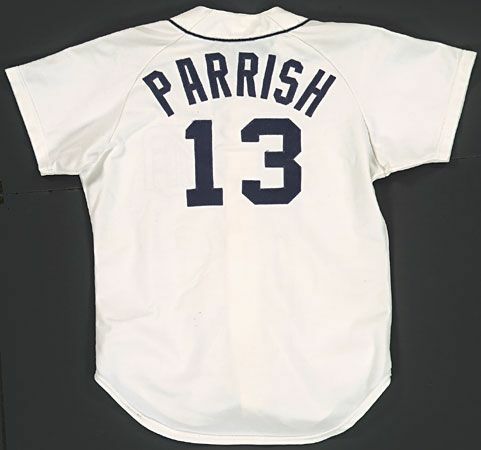 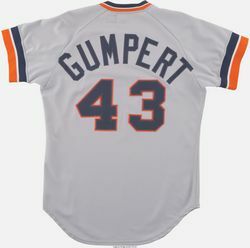 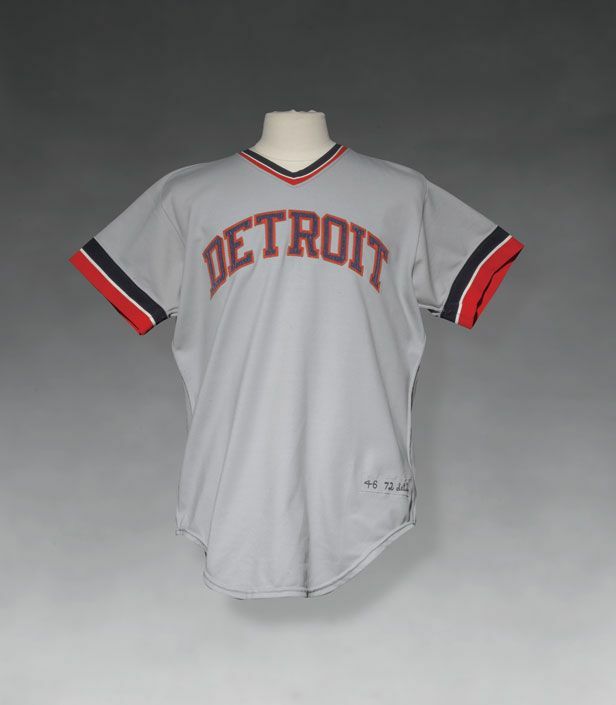 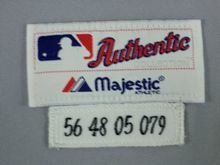 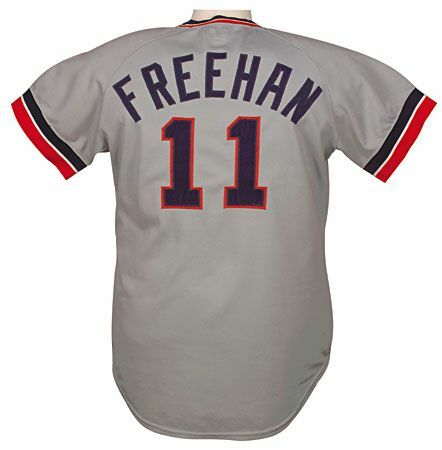 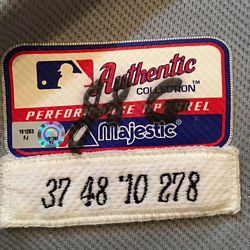 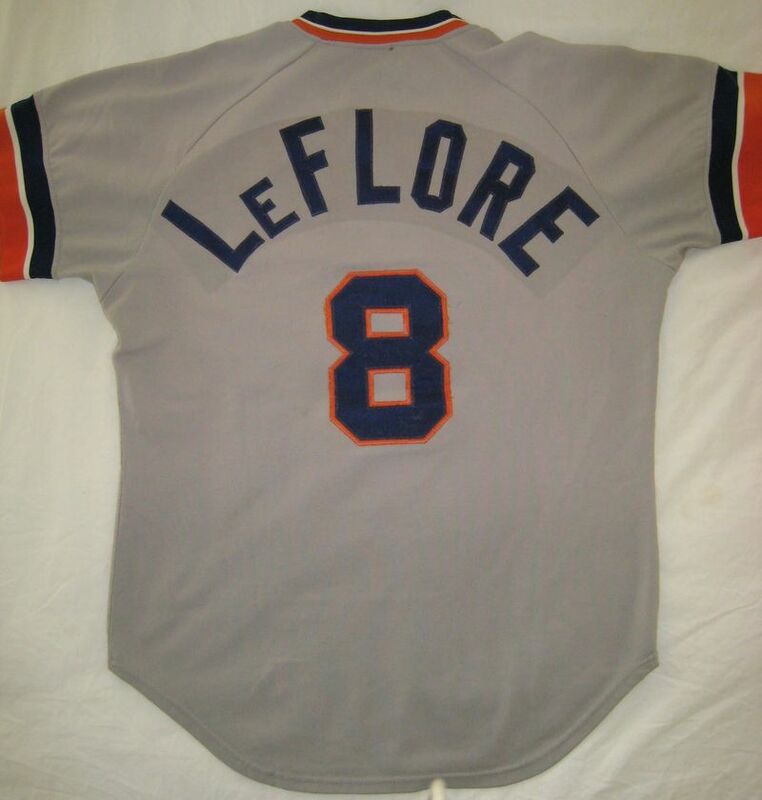 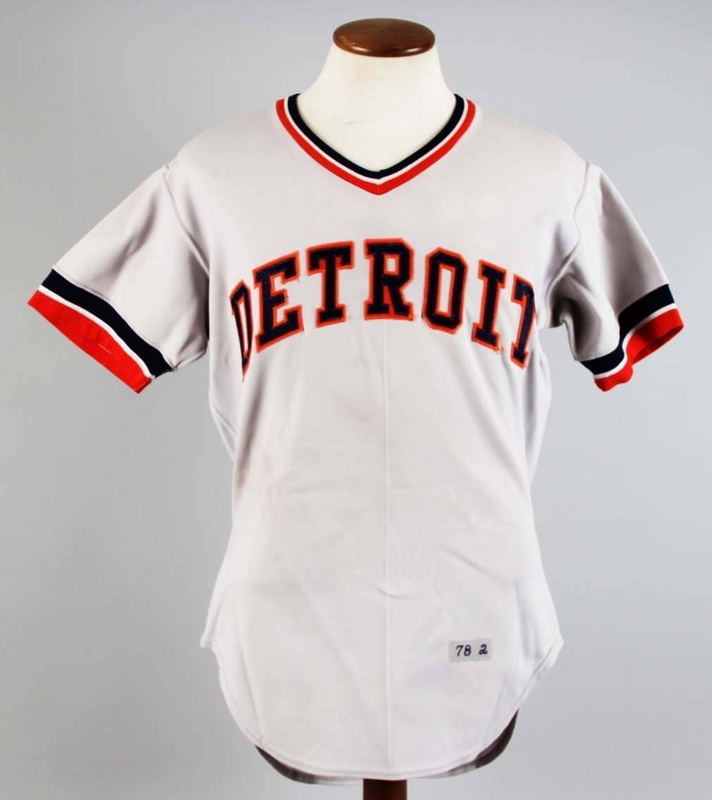 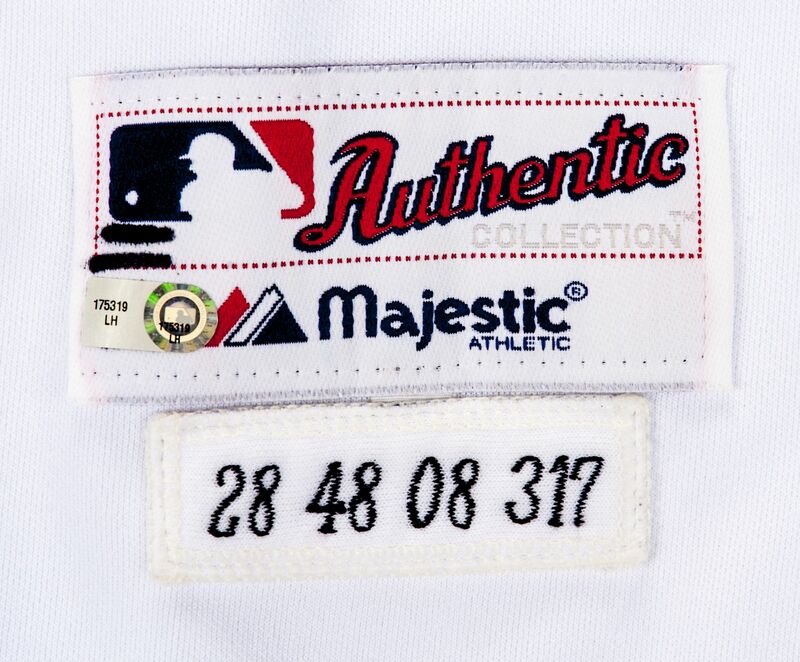 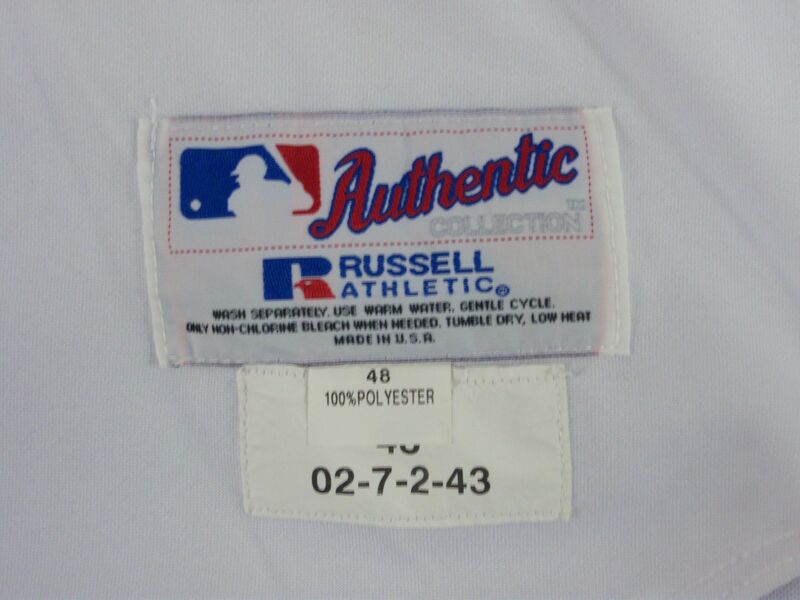 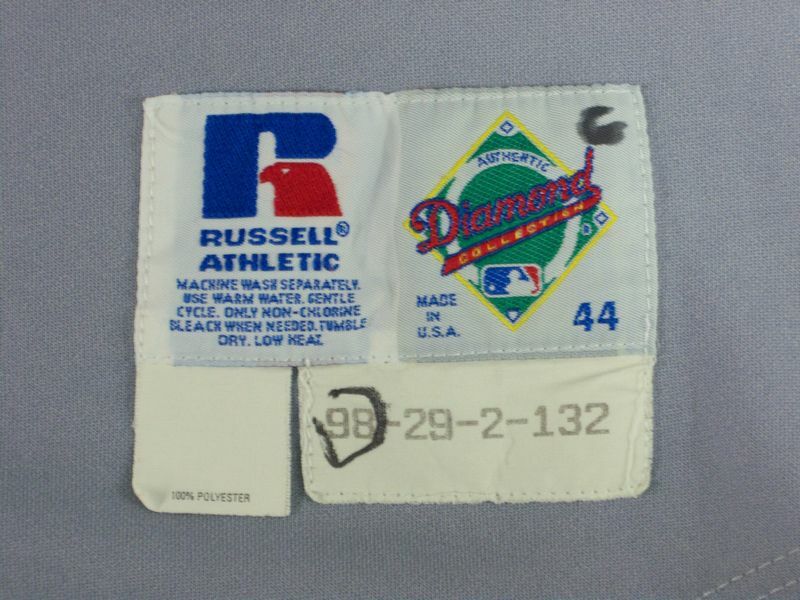 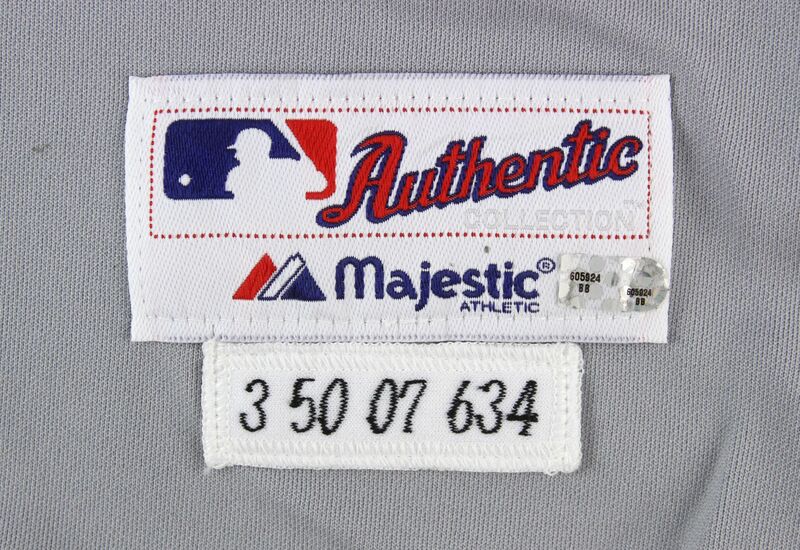 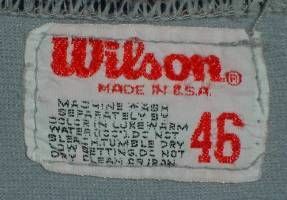 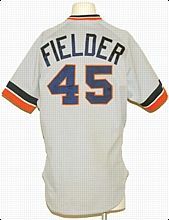 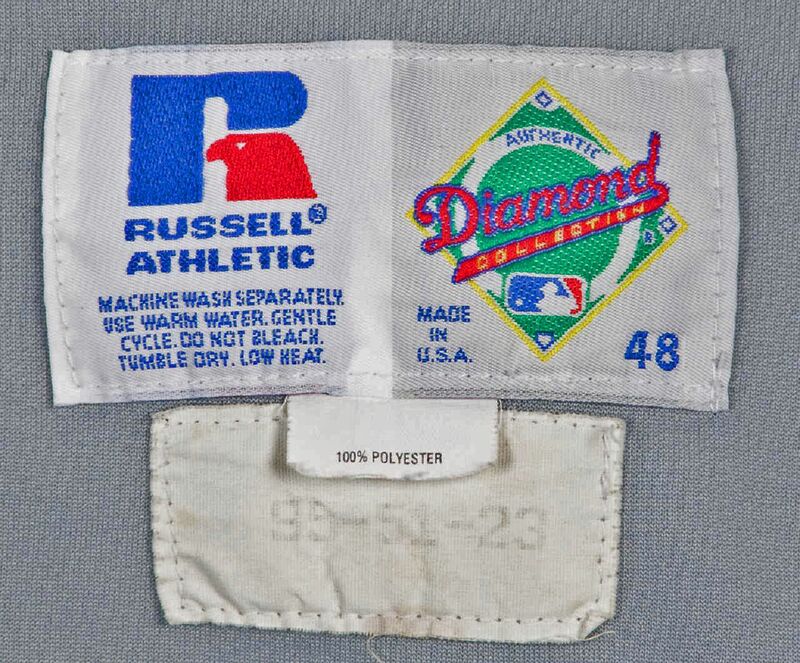 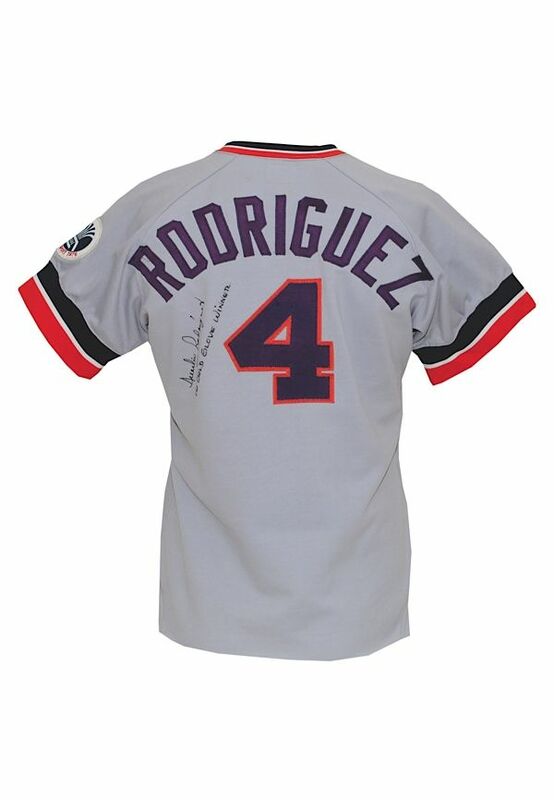 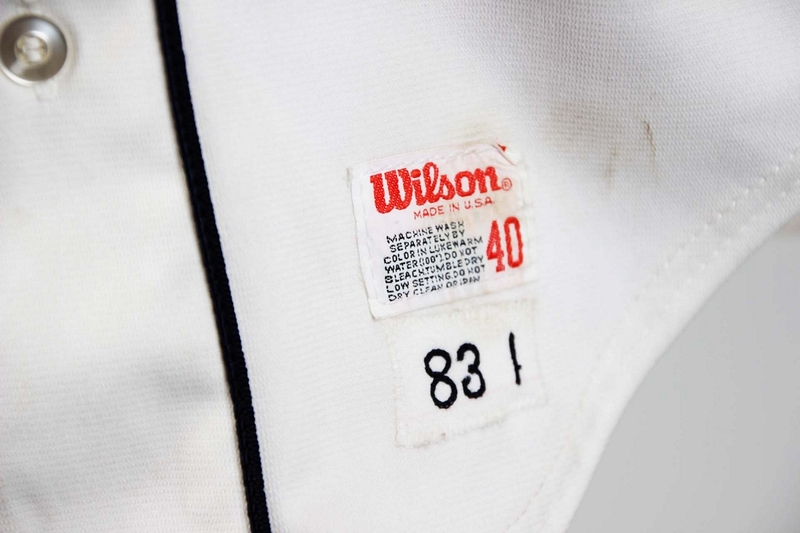 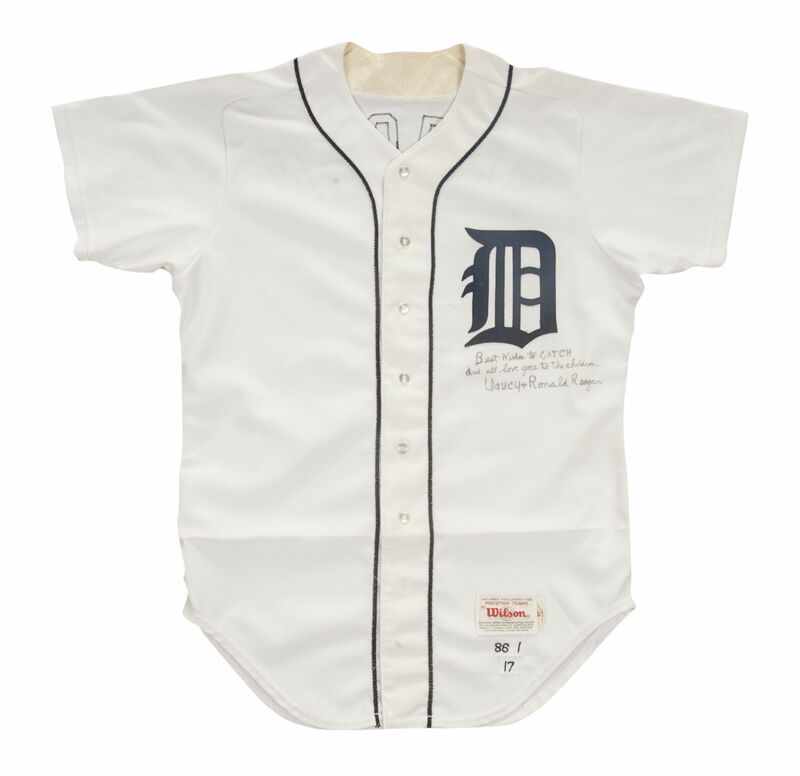 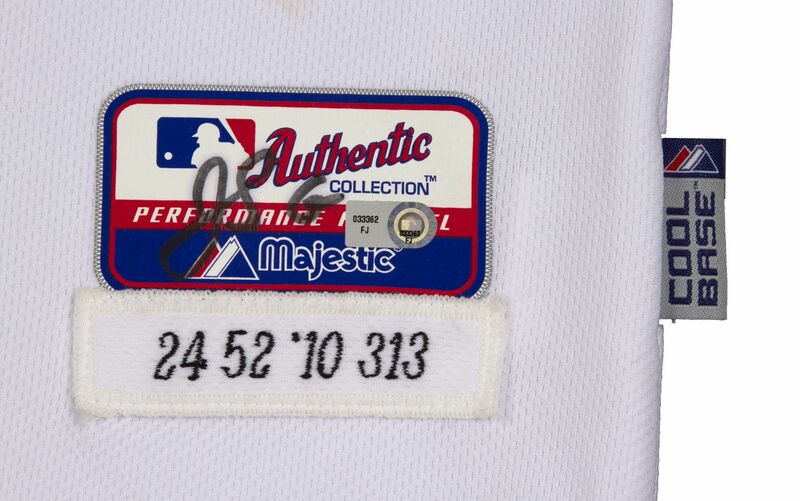 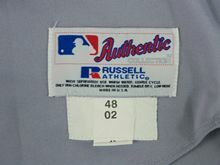 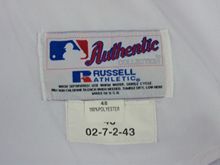 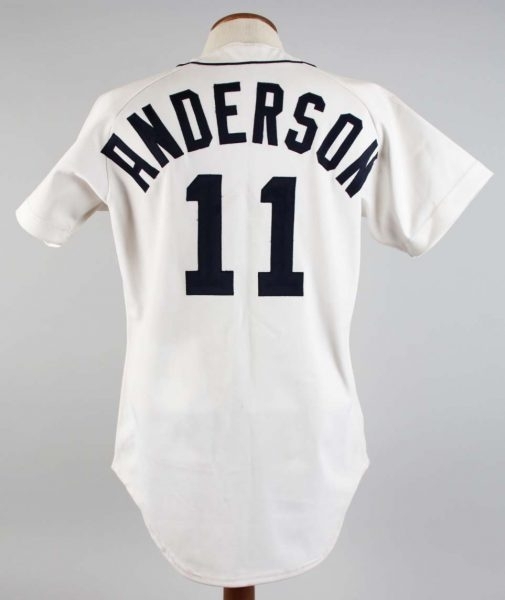 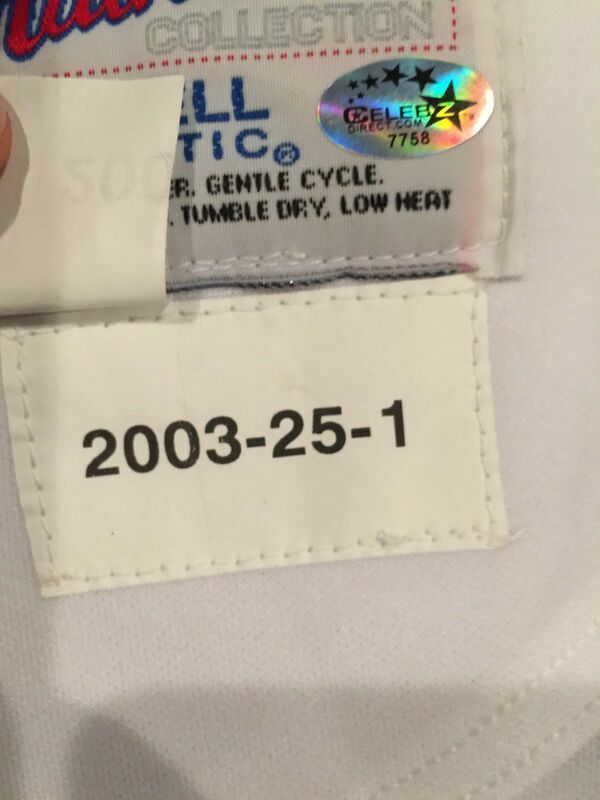 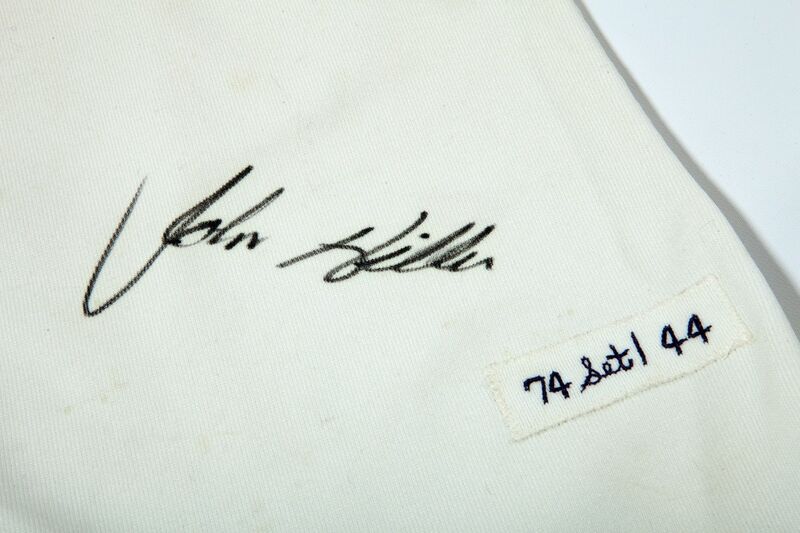 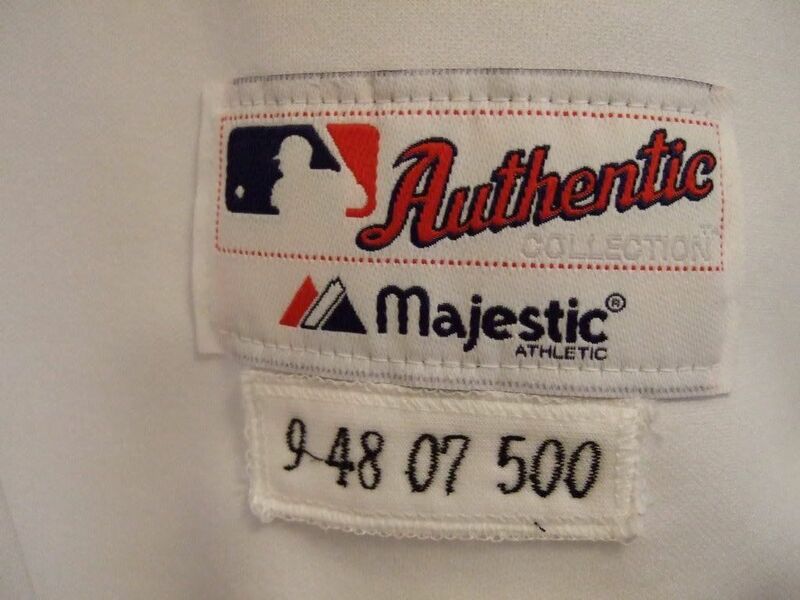 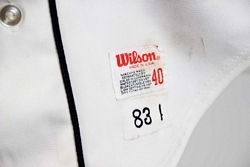 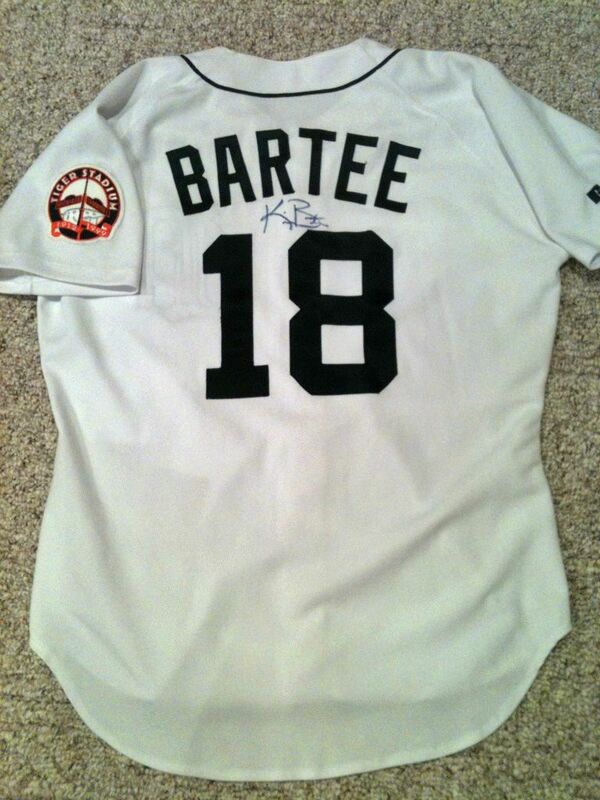 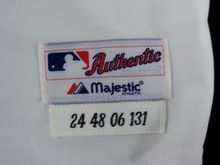 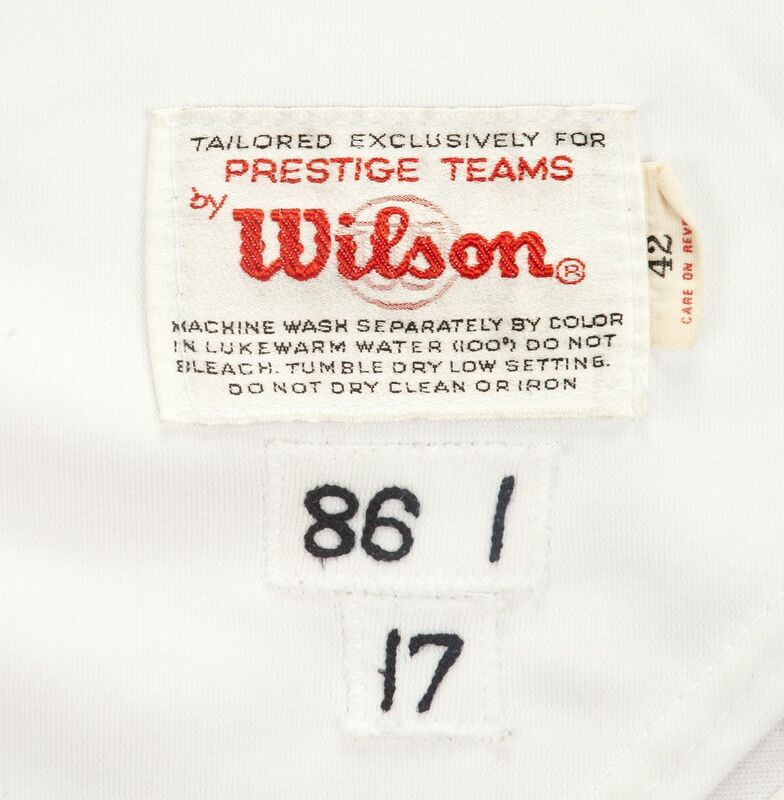 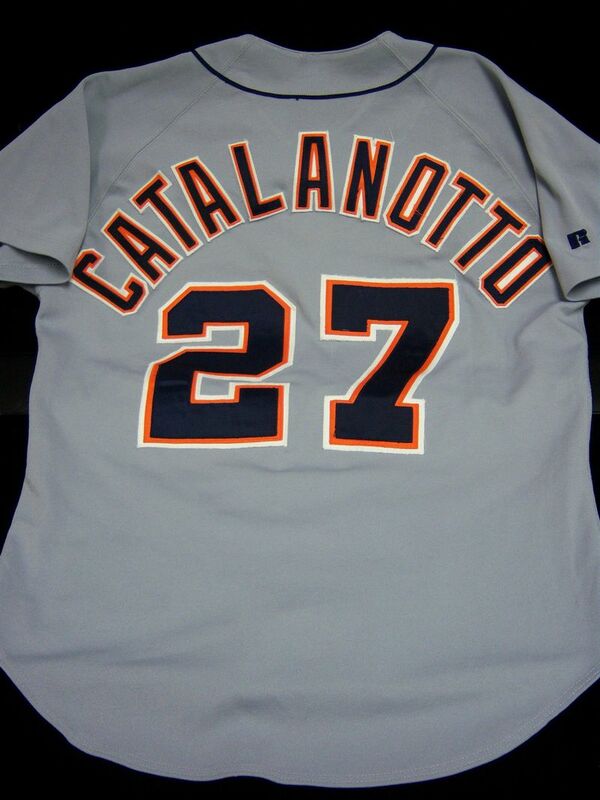 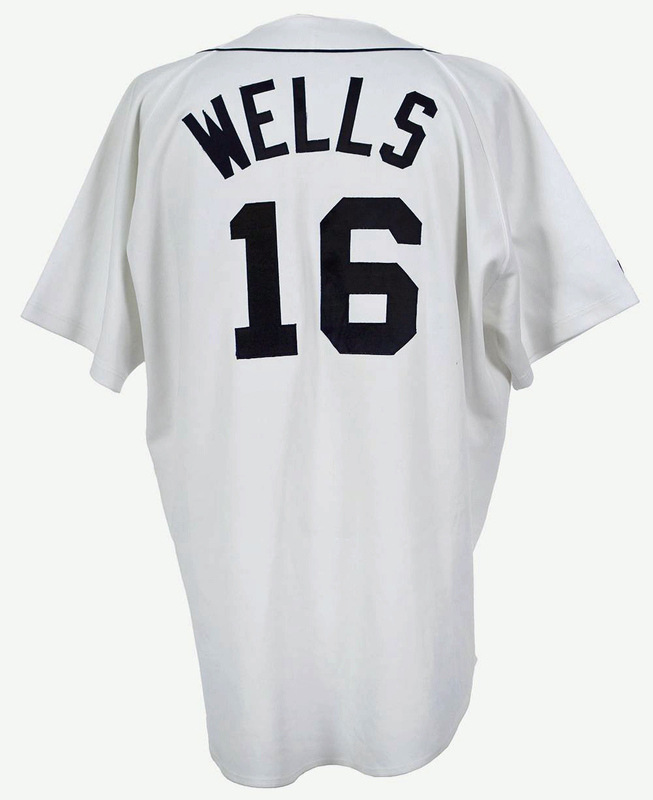 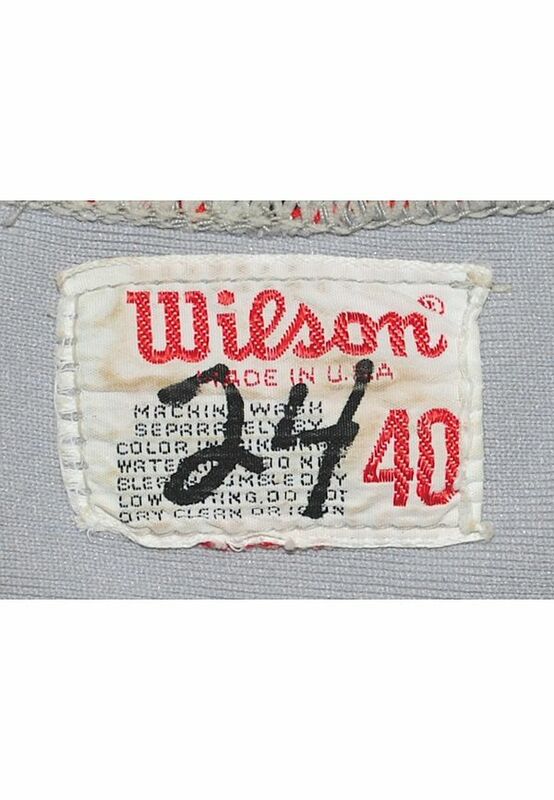 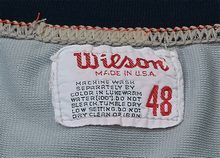 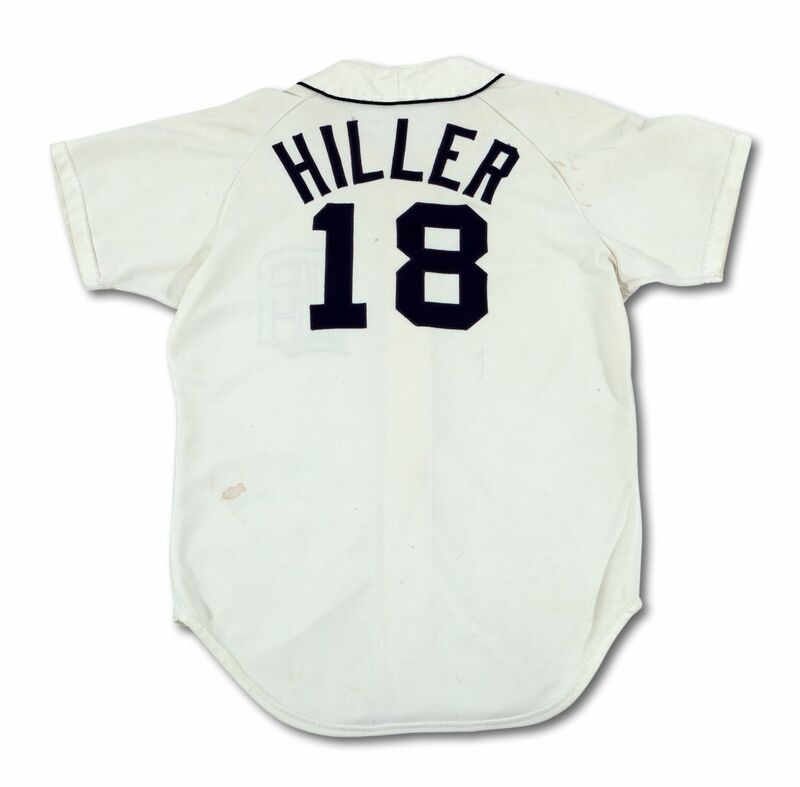 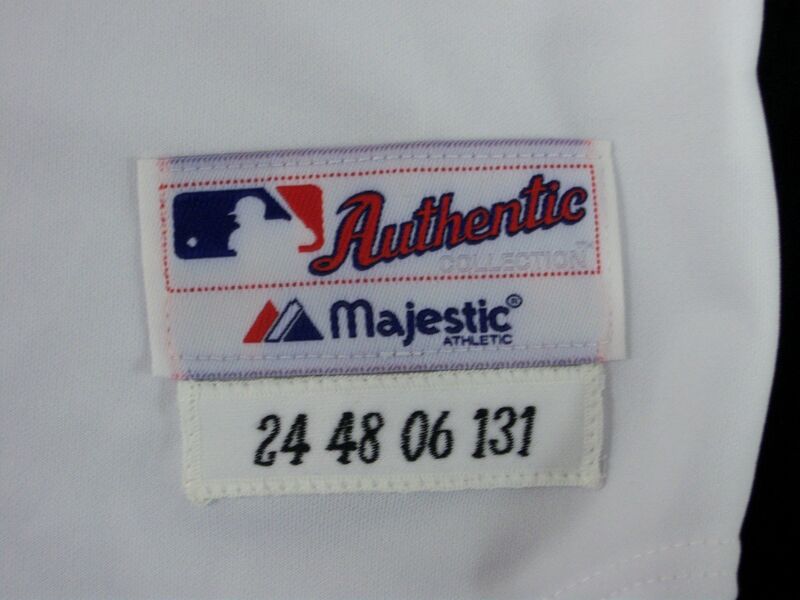 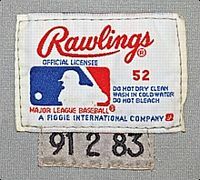 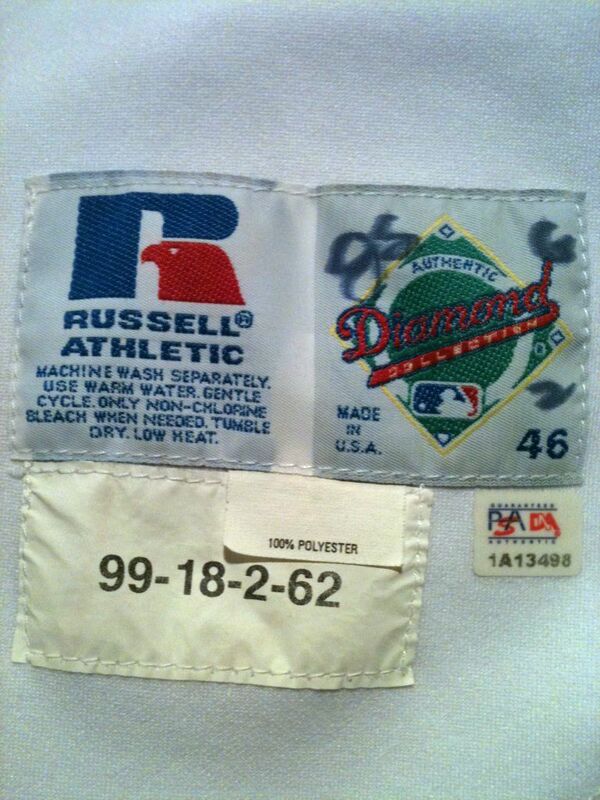 Given to President Reagan after the World Series win, this is actually a game used jersey with the name replaced. Road jersey gets racing stripes in place of sleeve cuffs, script wordmark in place of block, and white trim is added to all lettering. Road cap is replaced by two new versions. 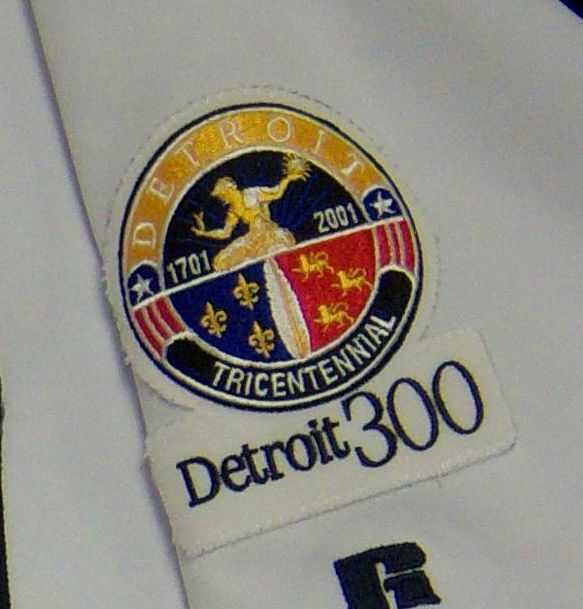 Racing stripes removed from road jersey. 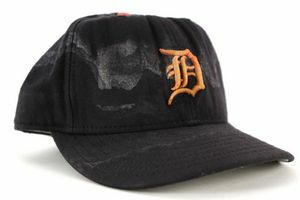 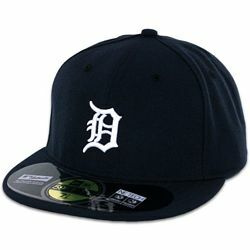 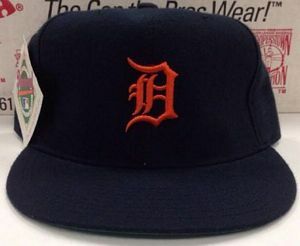 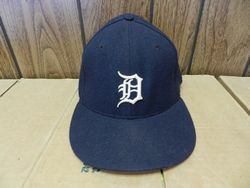 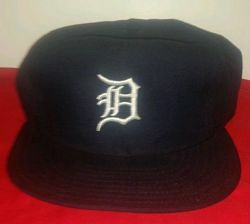 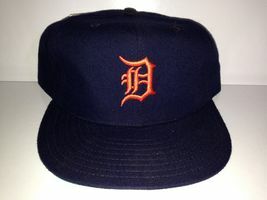 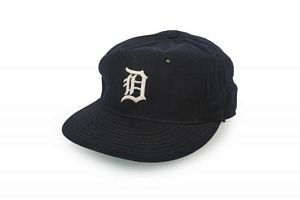 Road cap without the tiger is retired. 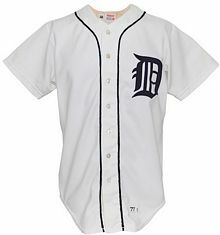 Alternate jersey for Sundays is planned but is worn for one game then dropped. 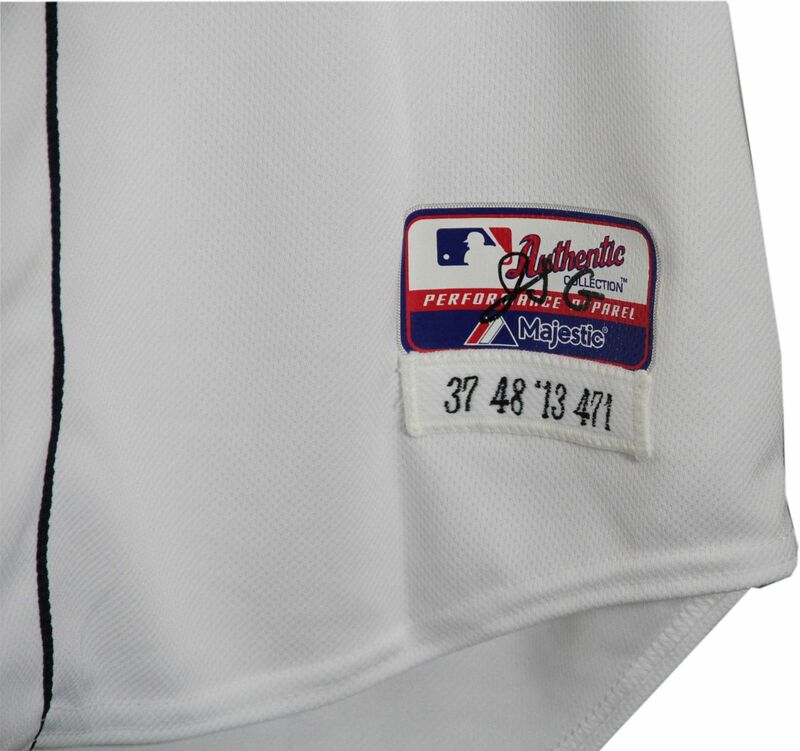 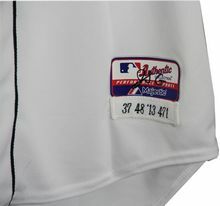 Piping added to road jersey as the team returns to its 1950s road jersey style (with white trim added). 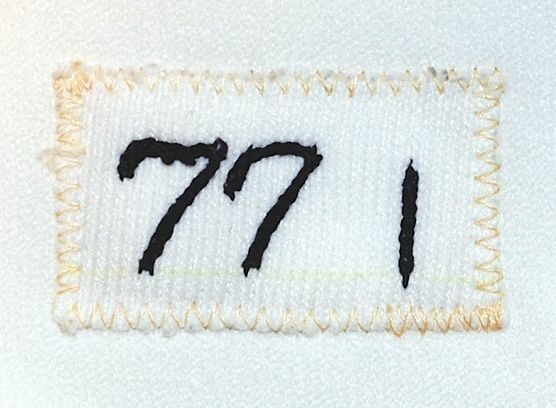 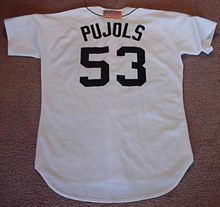 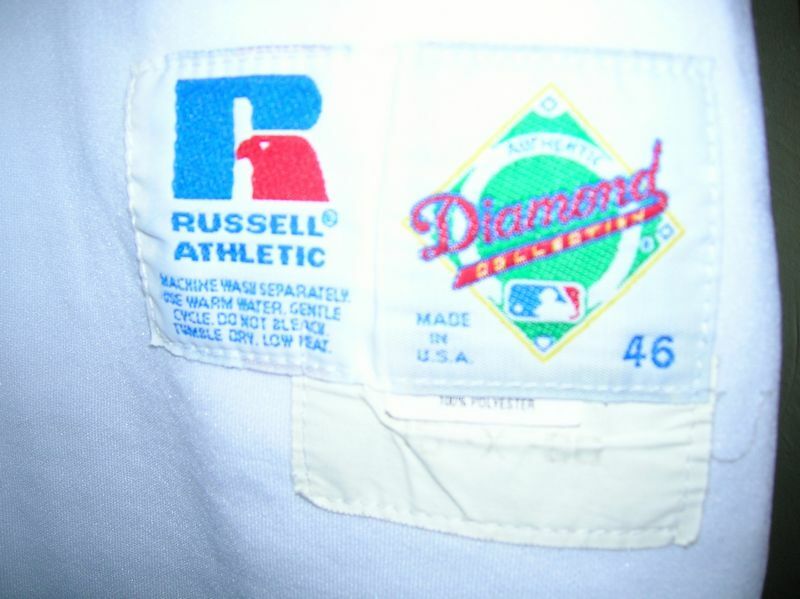 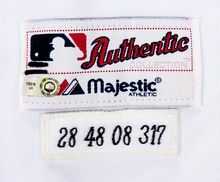 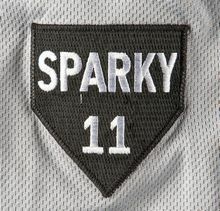 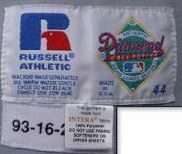 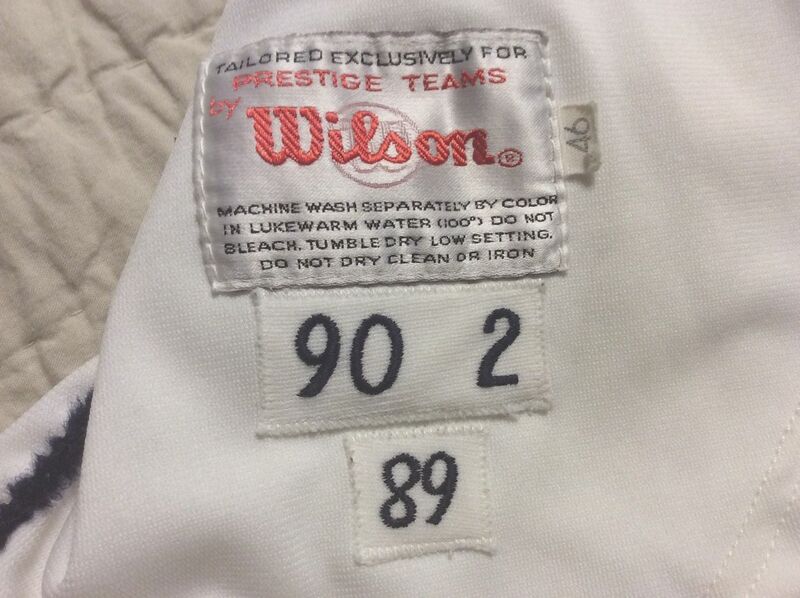 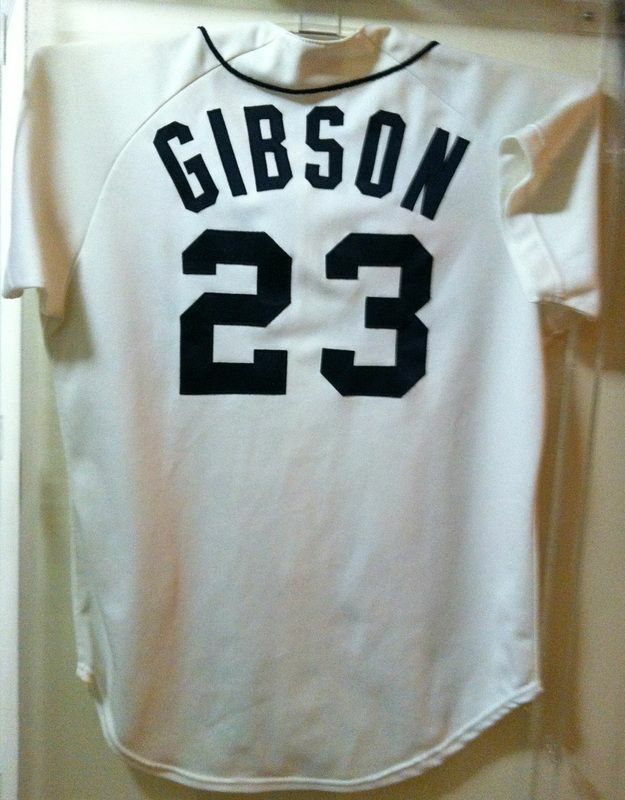 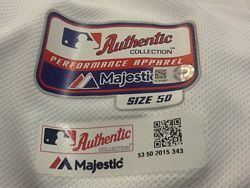 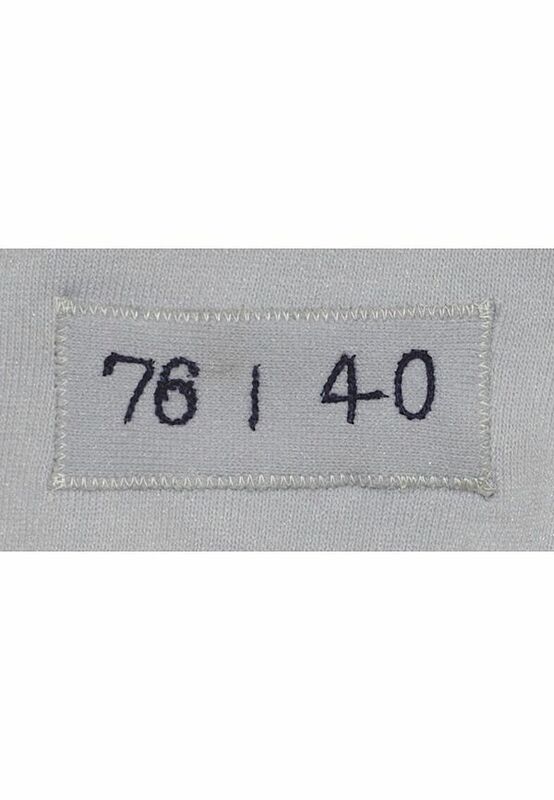 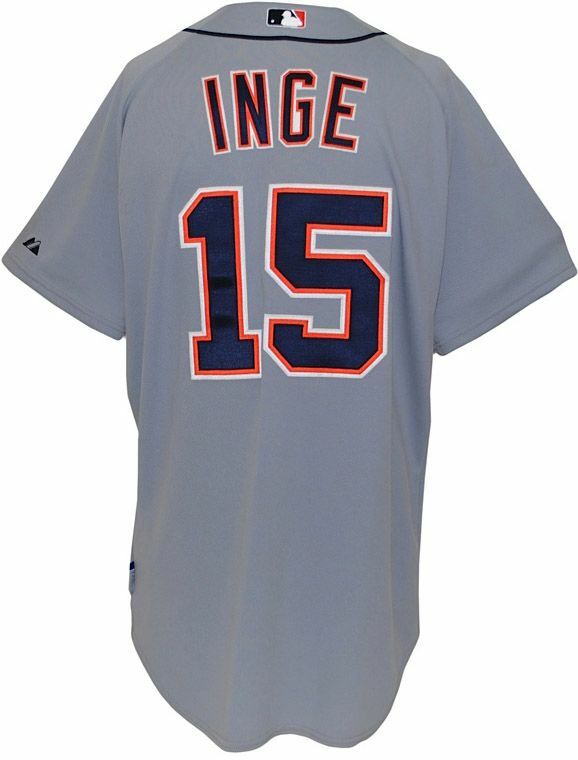 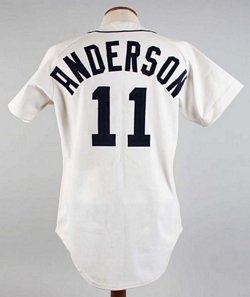 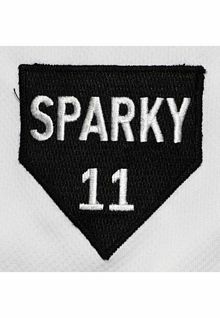 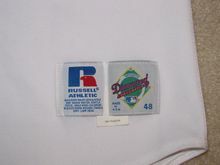 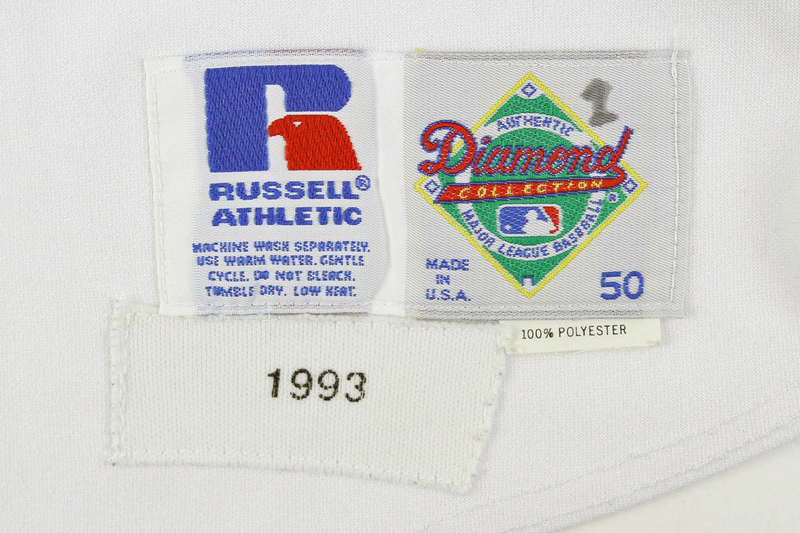 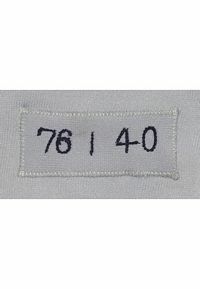 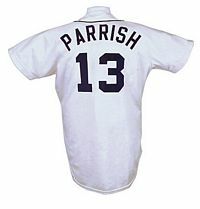 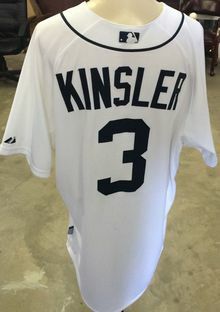 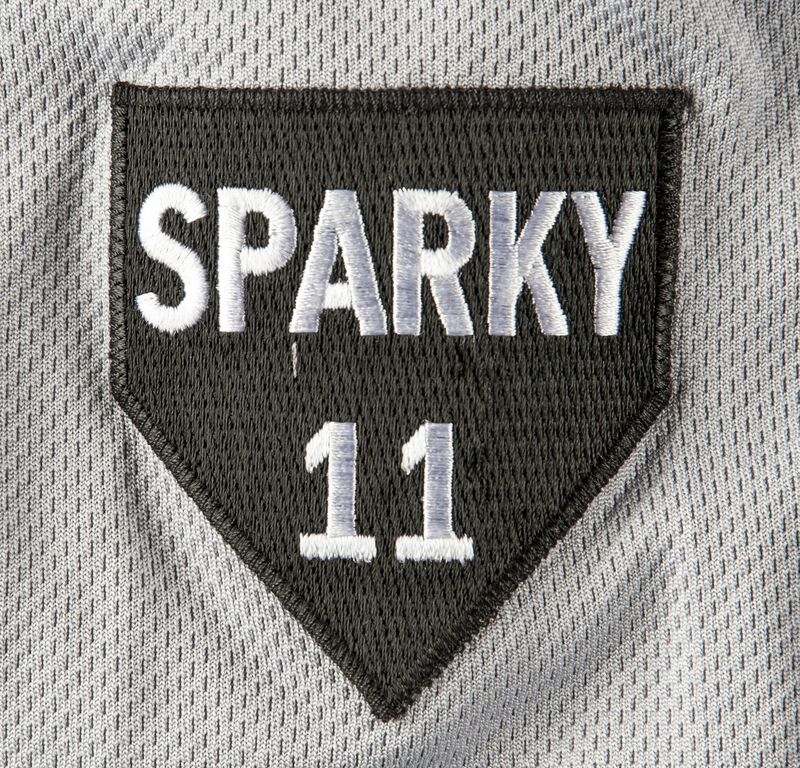 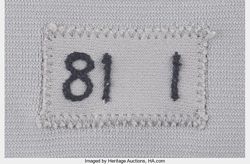 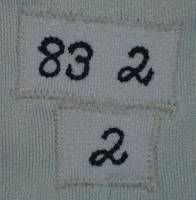 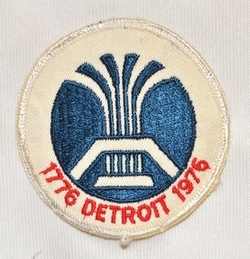 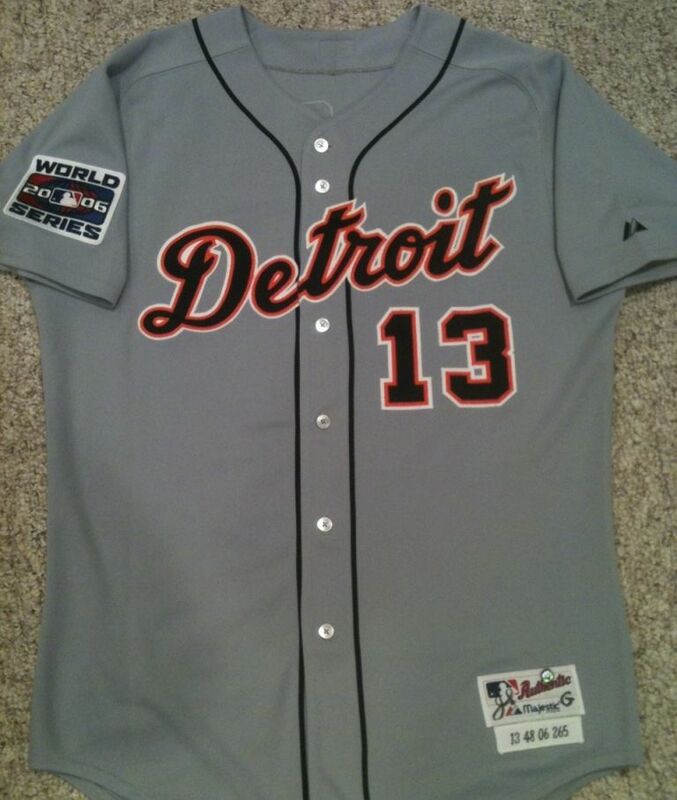 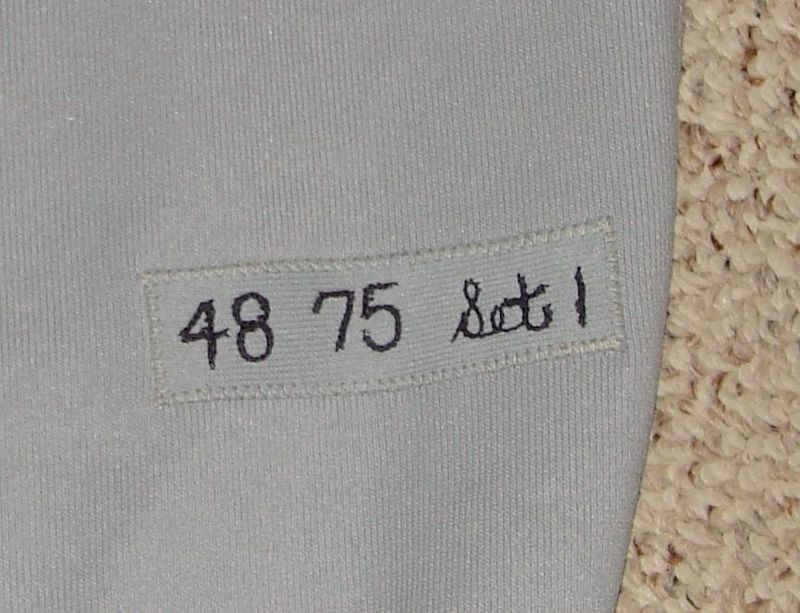 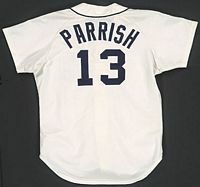 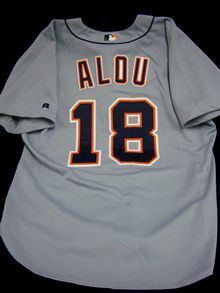 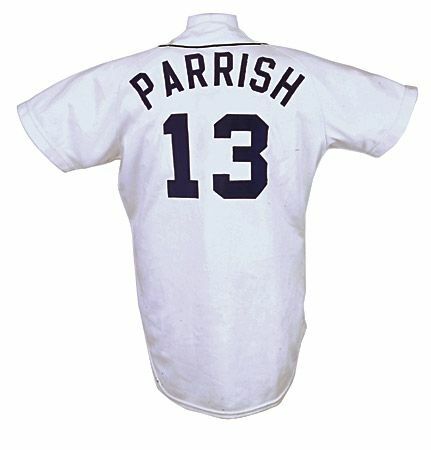 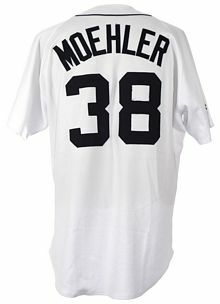 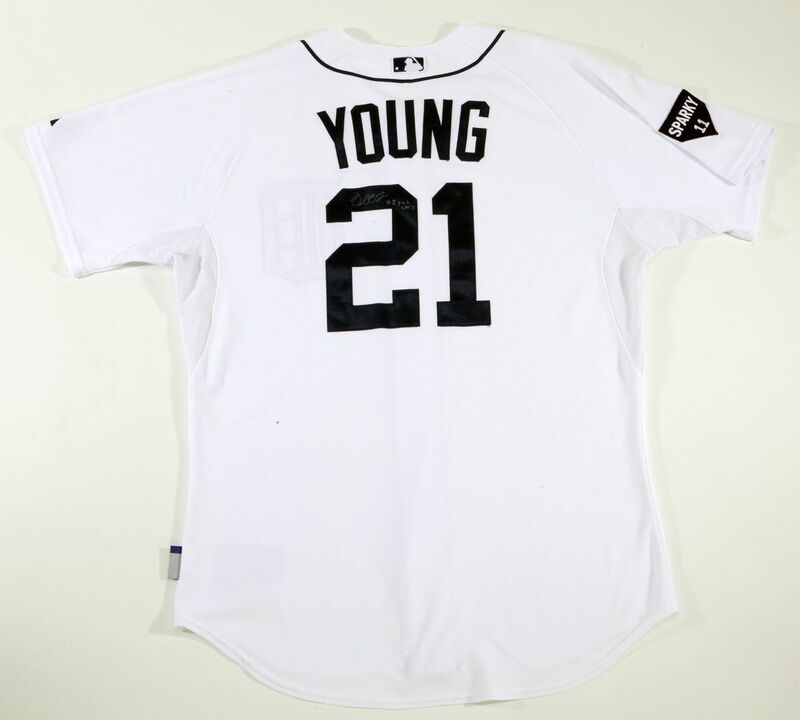 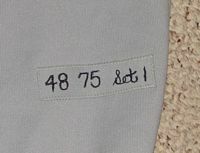 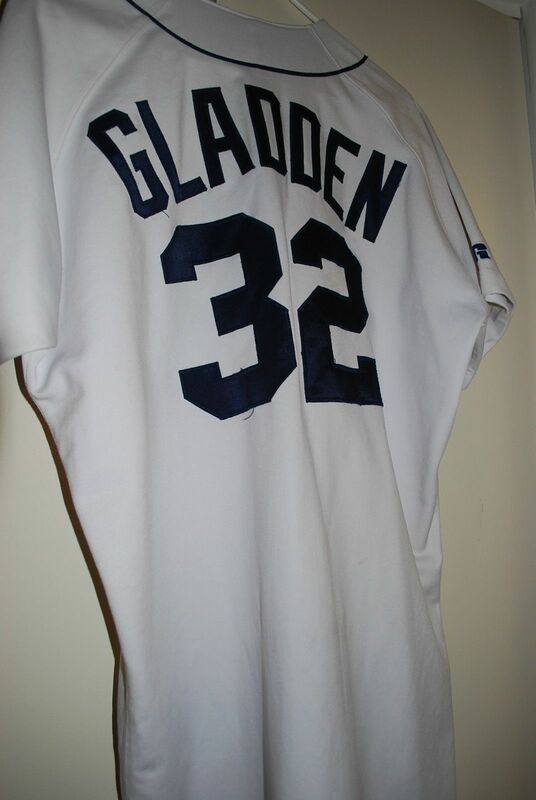 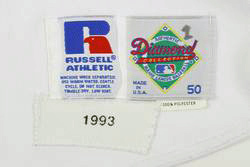 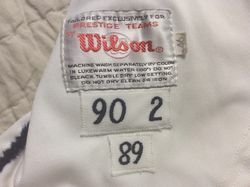 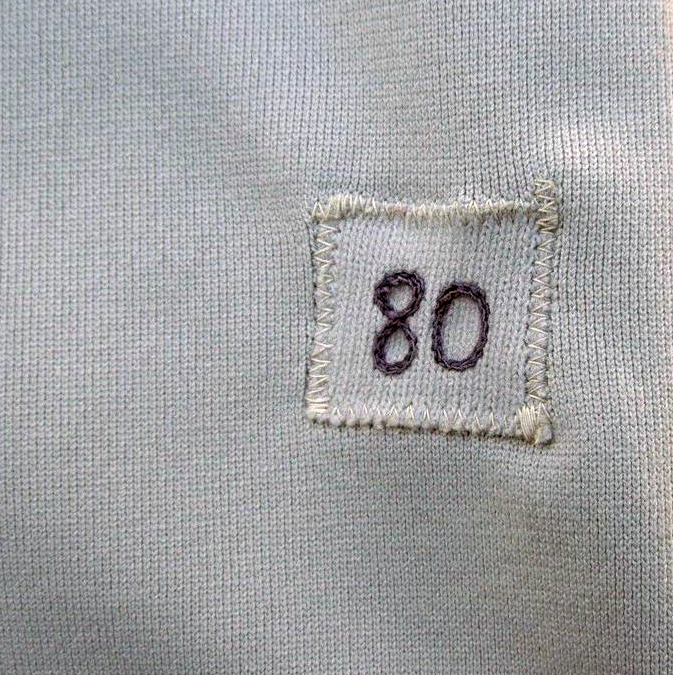 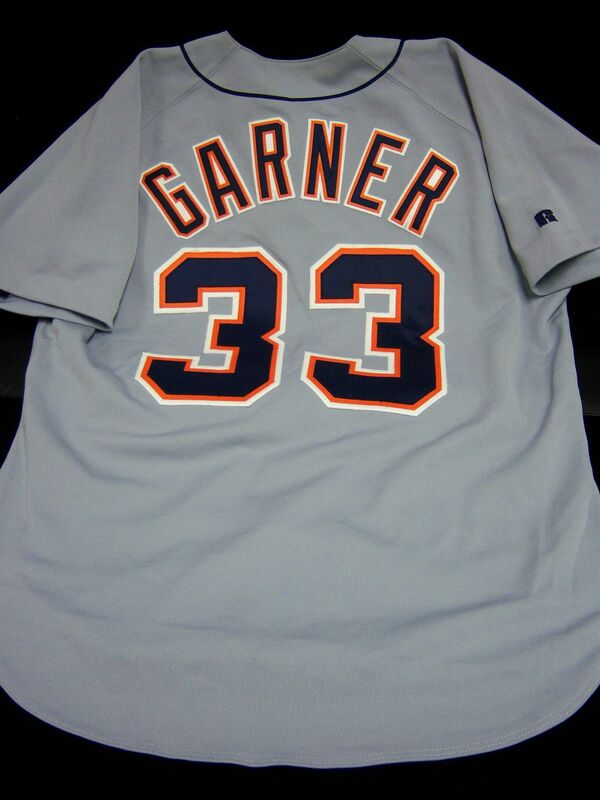 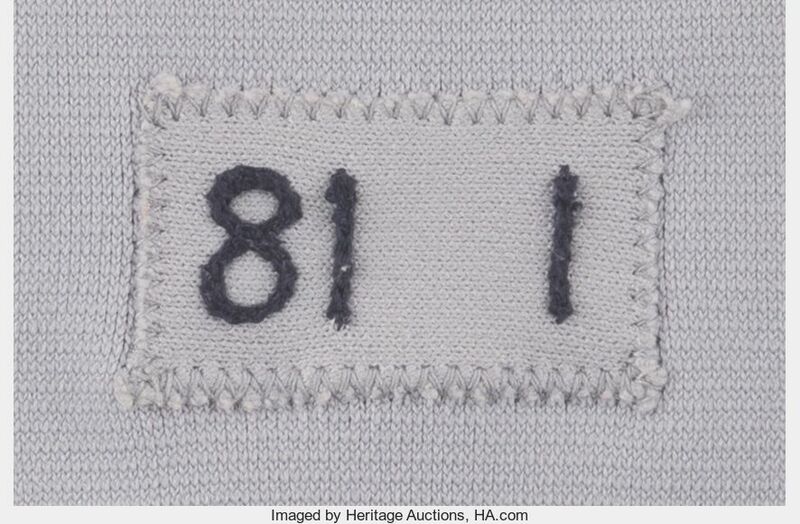 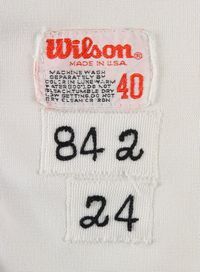 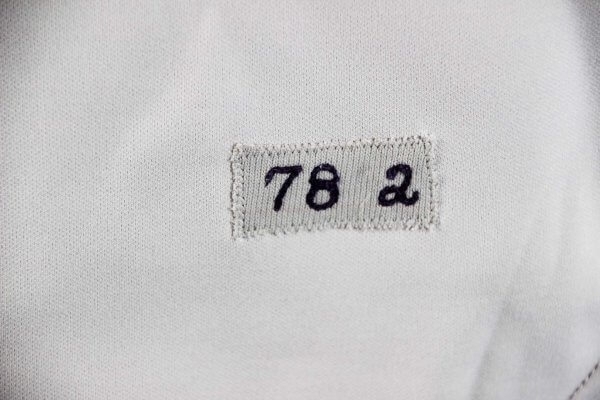 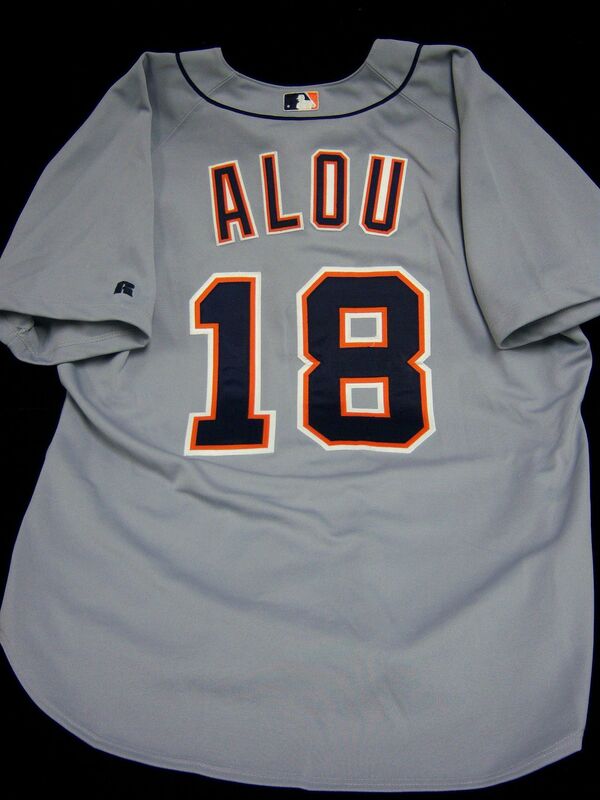 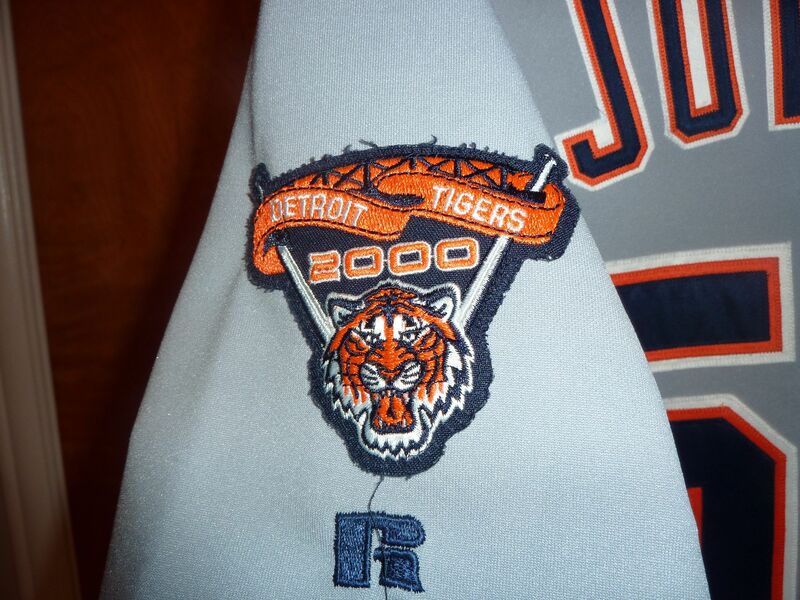 Tiger Stadium patch worn on 1999 home jerseys. 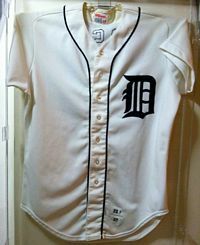 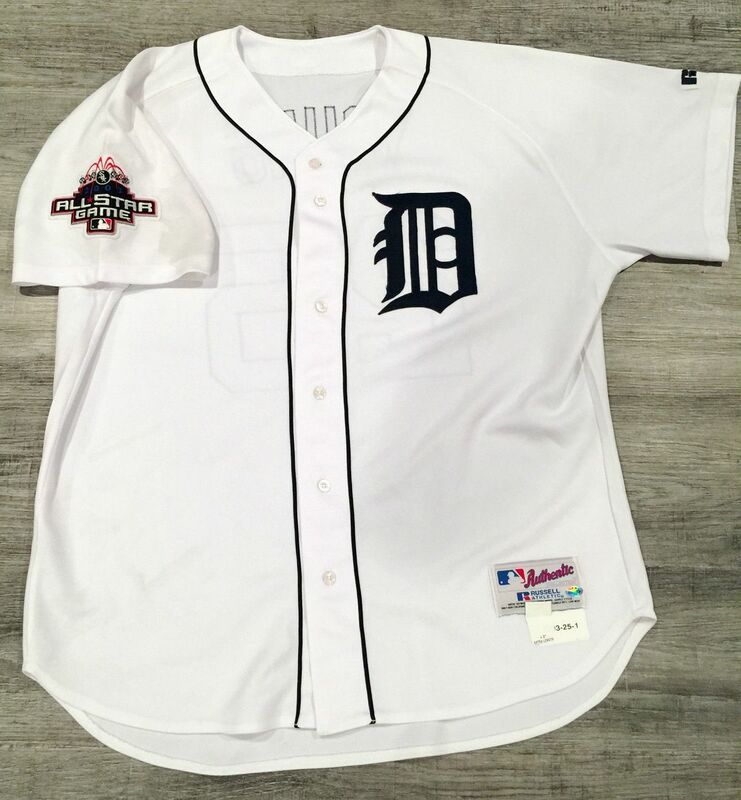 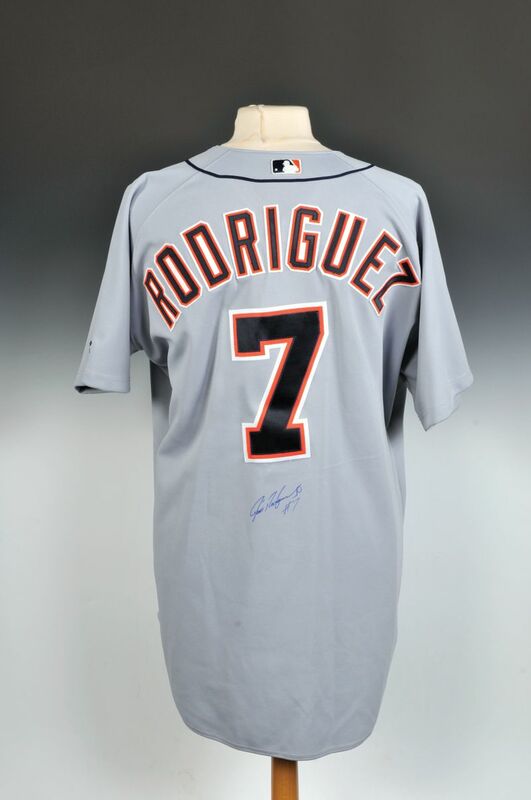 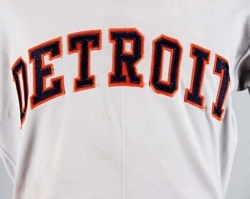 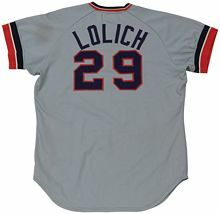 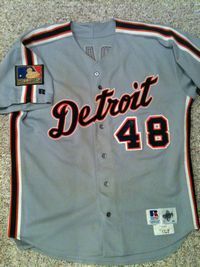 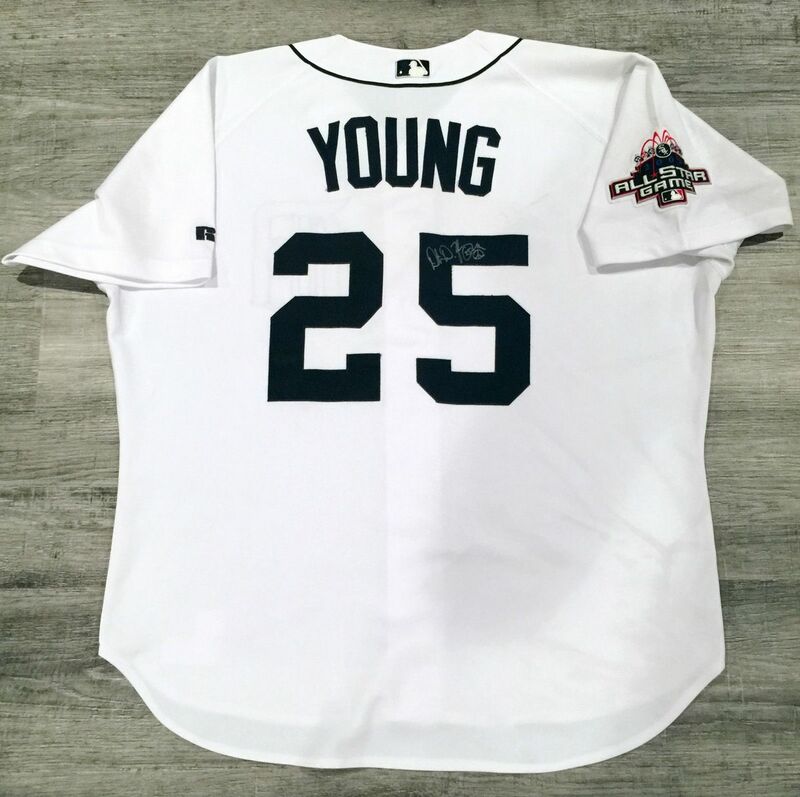 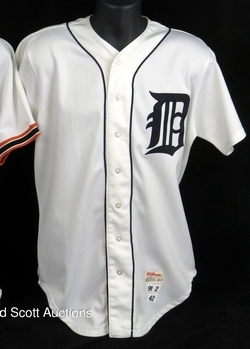 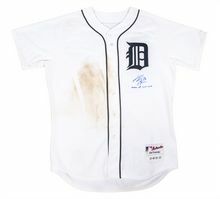 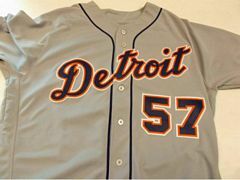 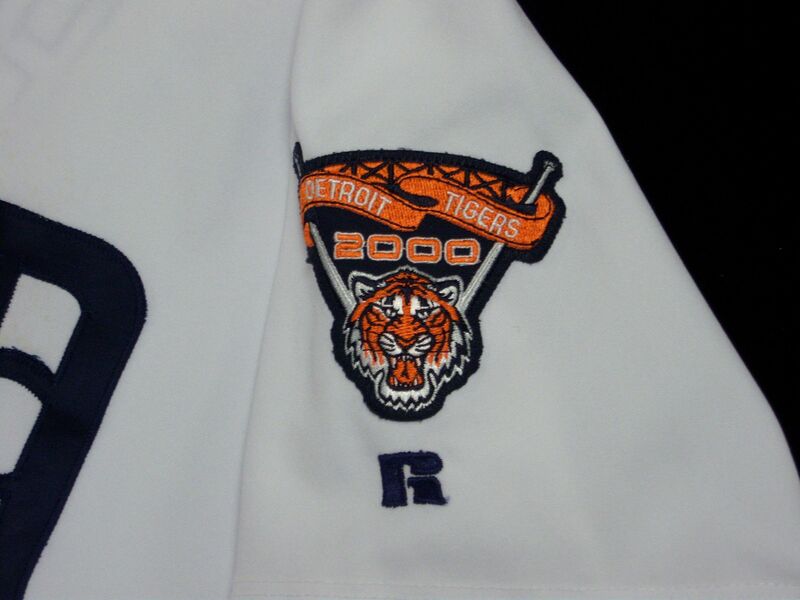 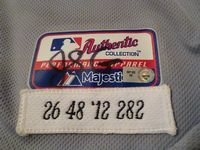 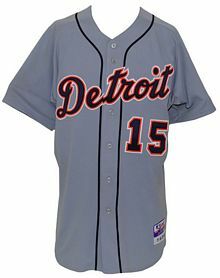 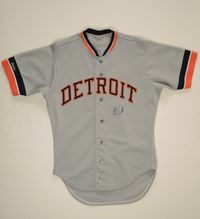 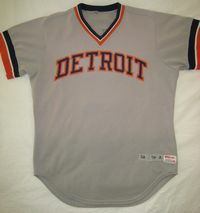 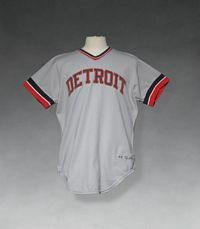 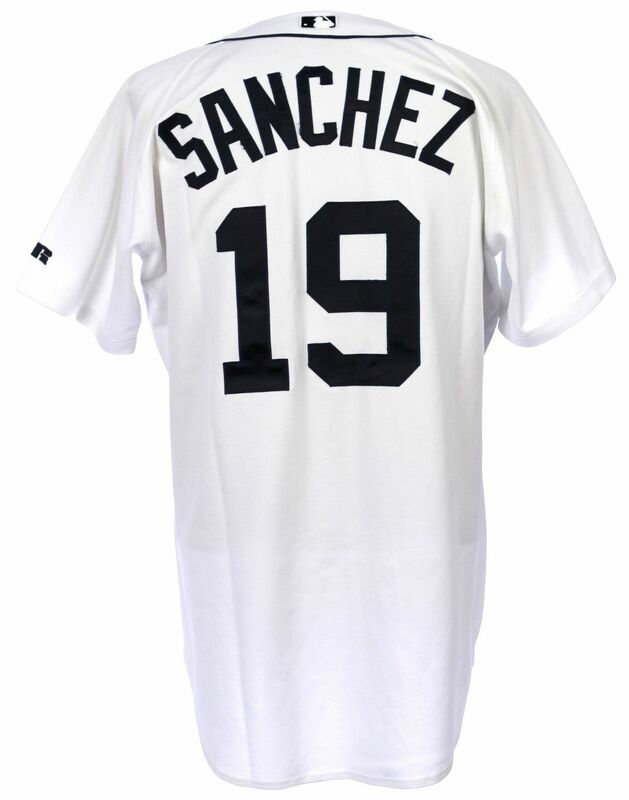 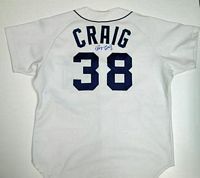 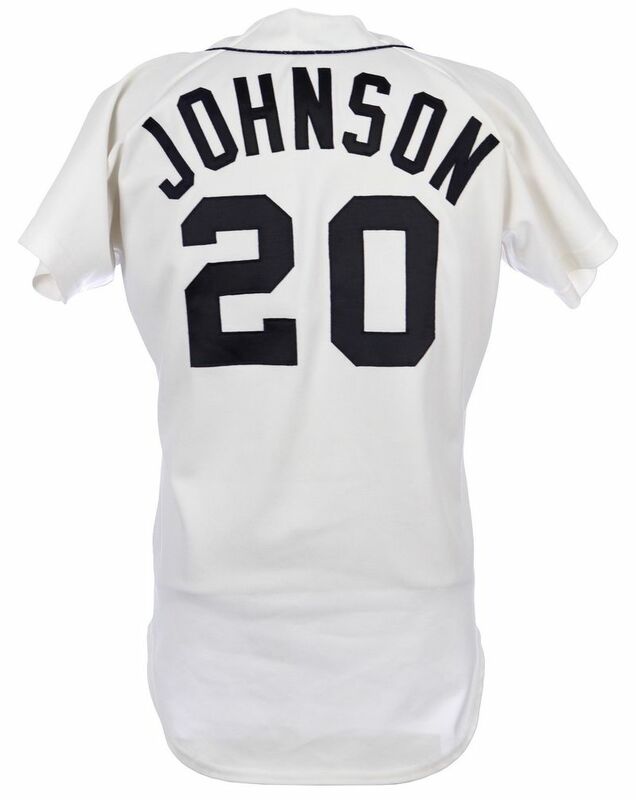 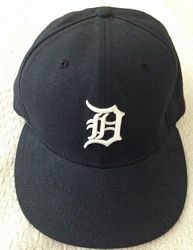 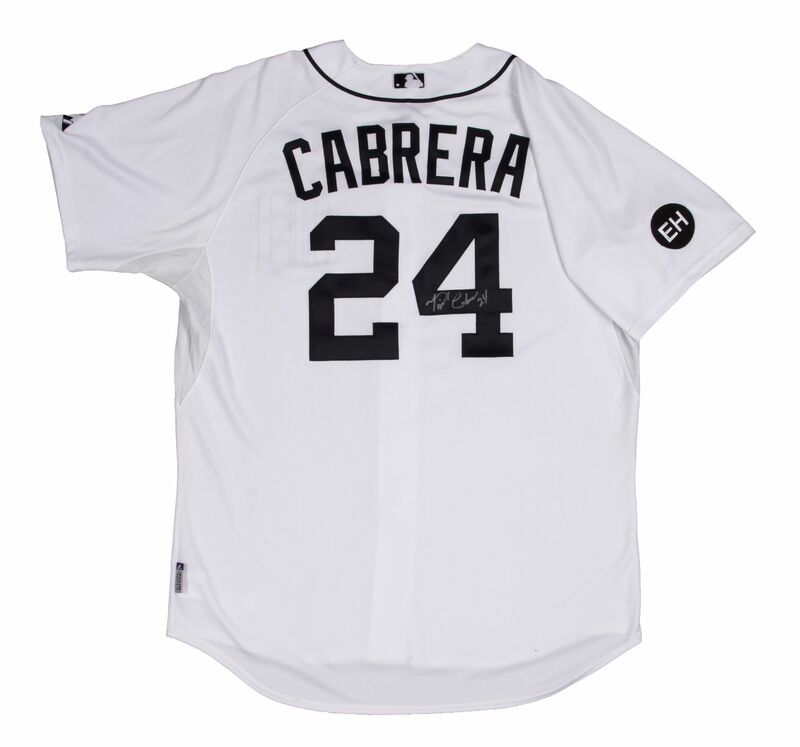 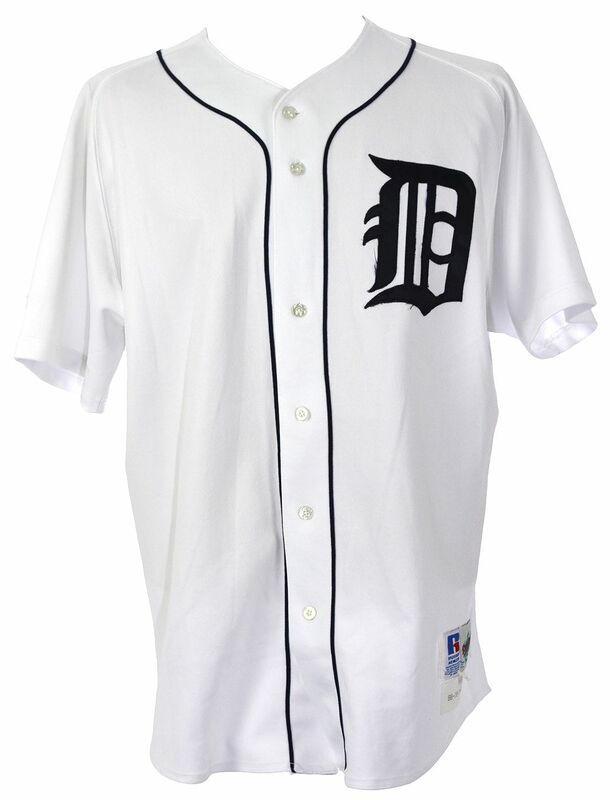 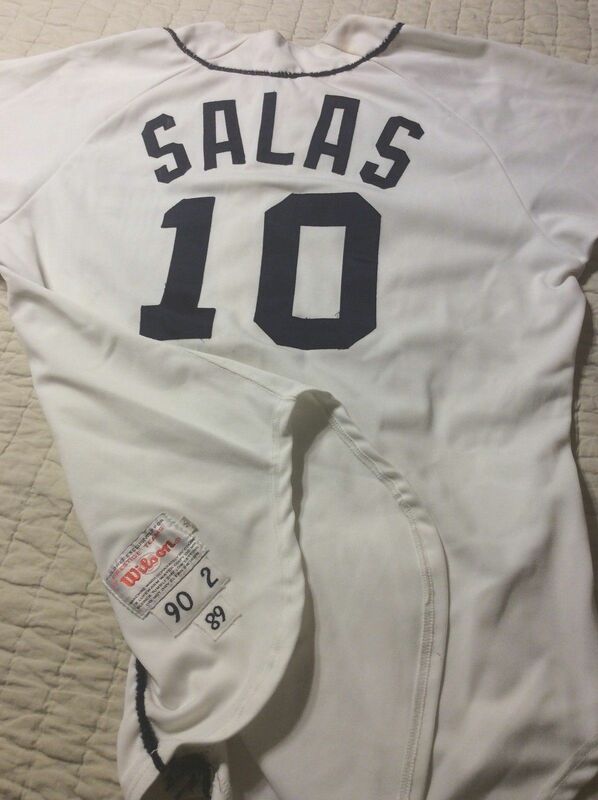 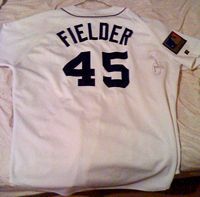 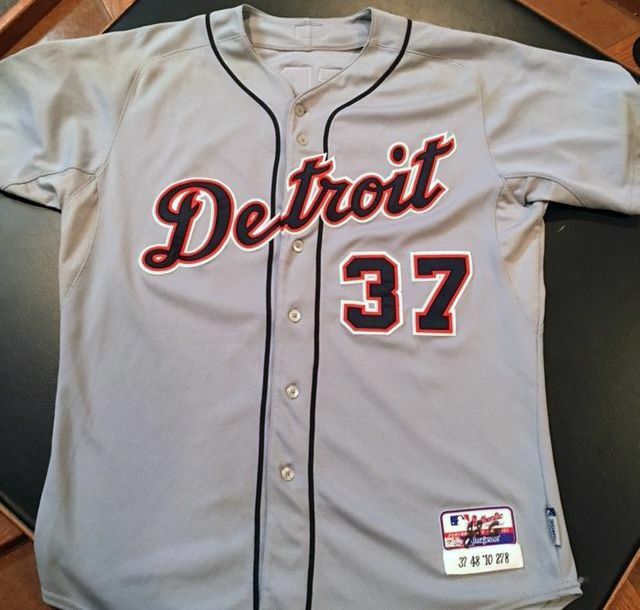 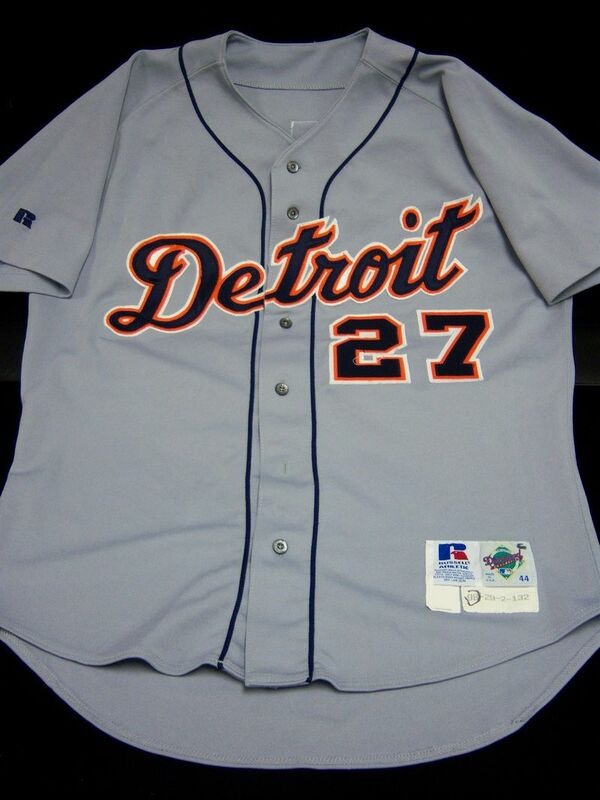 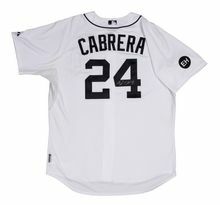 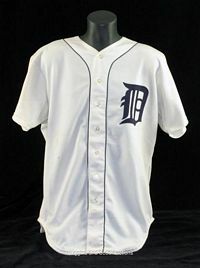 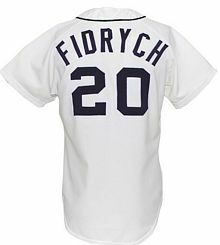 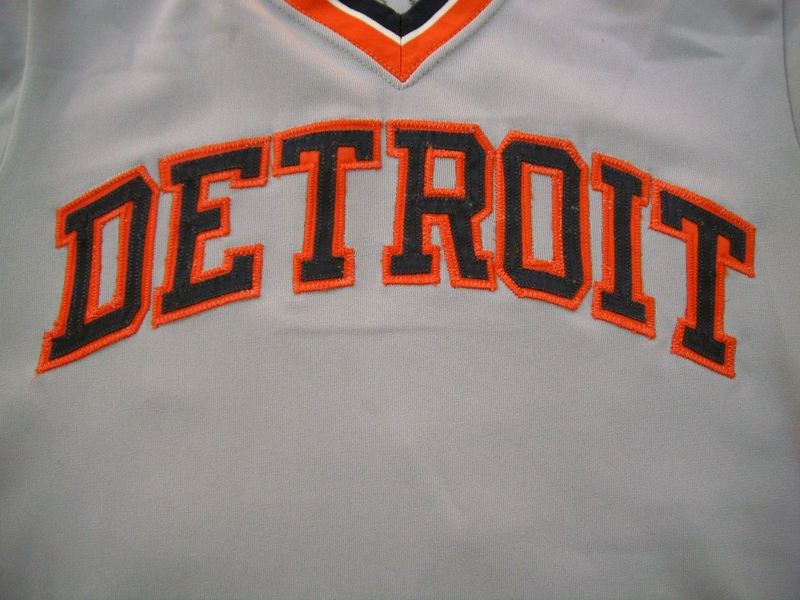 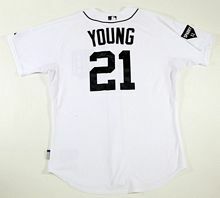 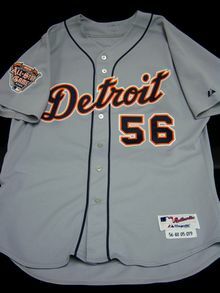 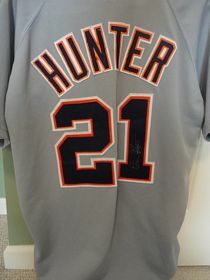 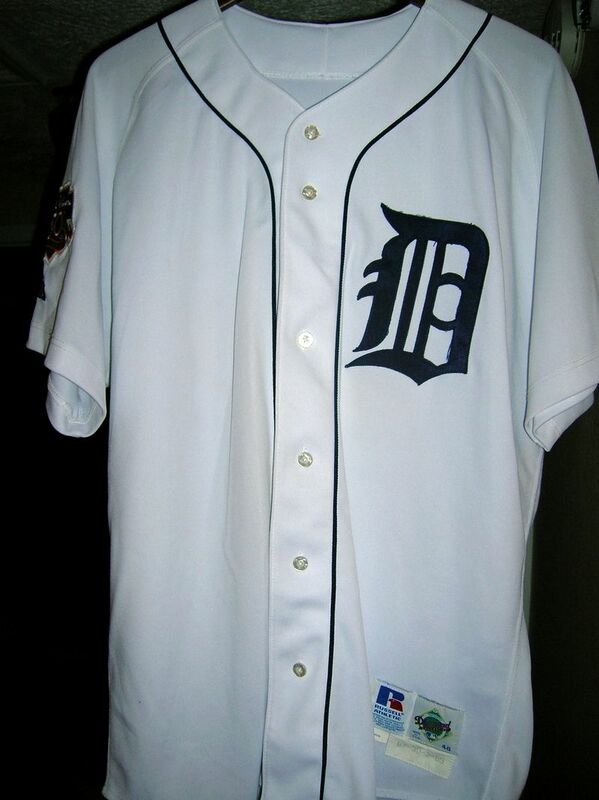 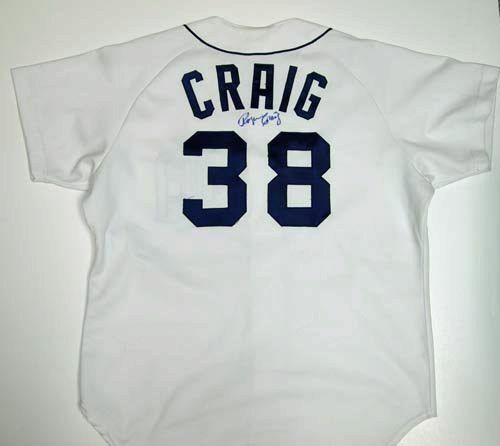 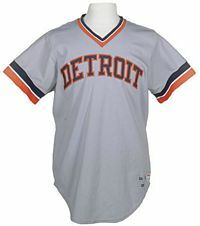 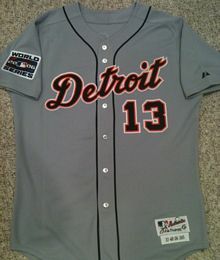 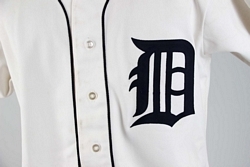 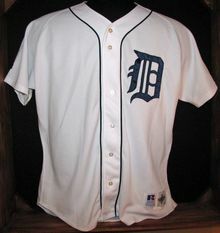 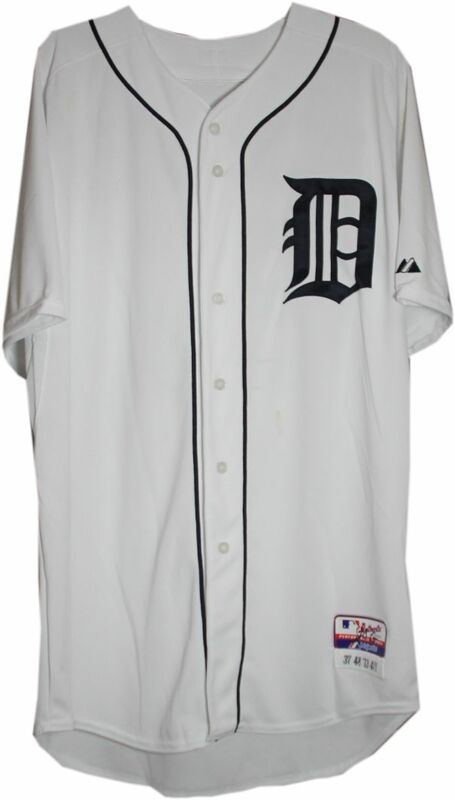 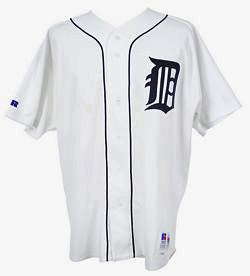 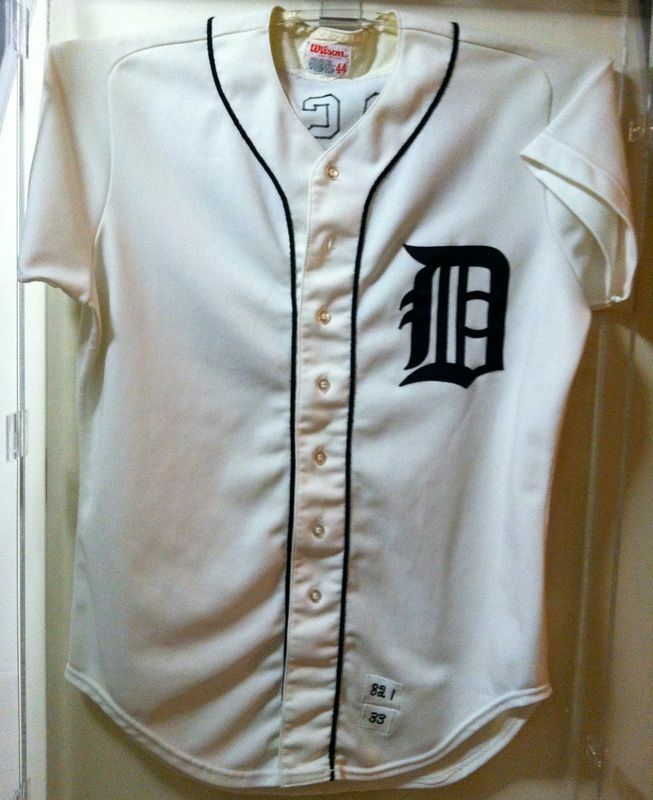 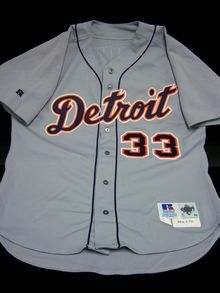 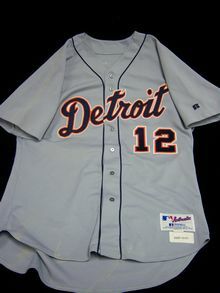 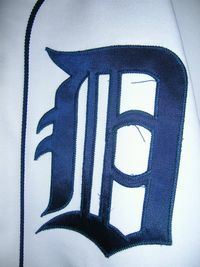 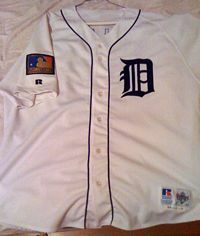 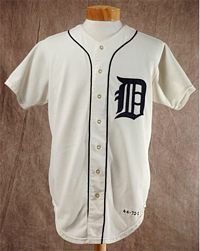 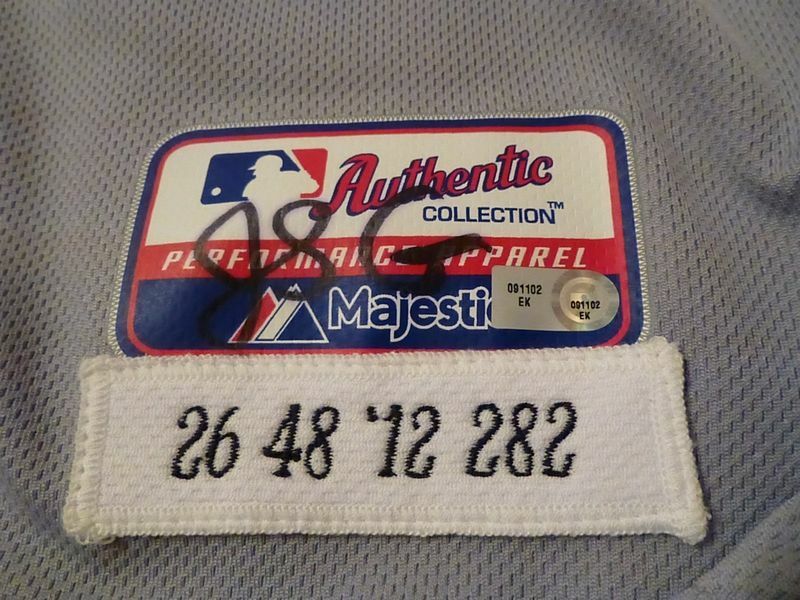 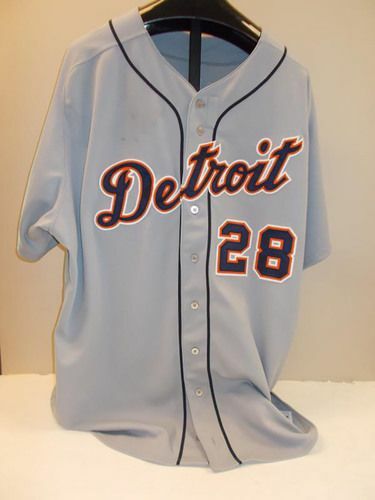 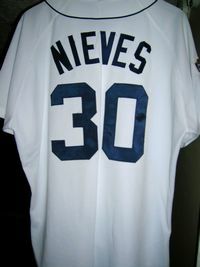 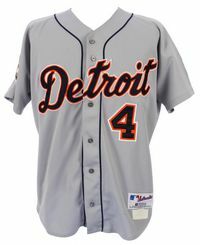 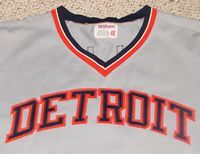 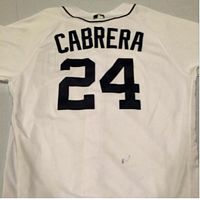 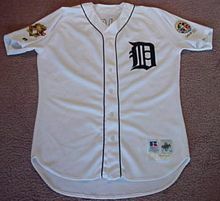 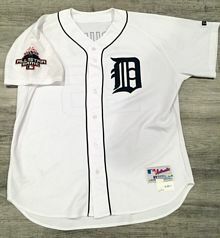 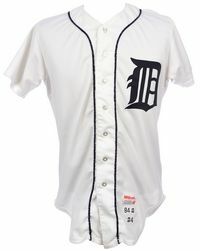 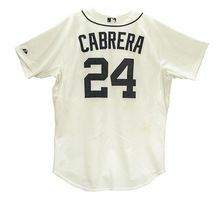 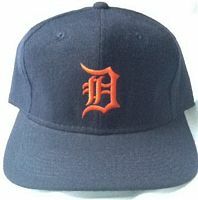 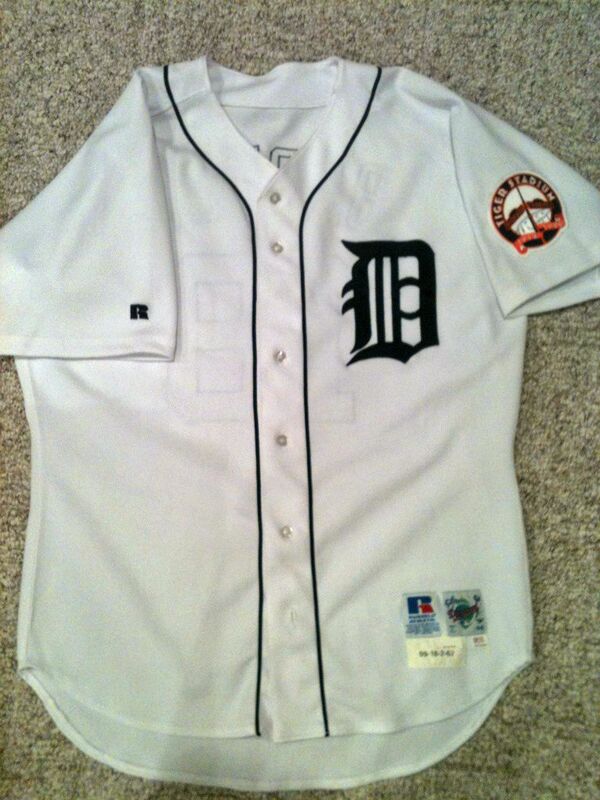 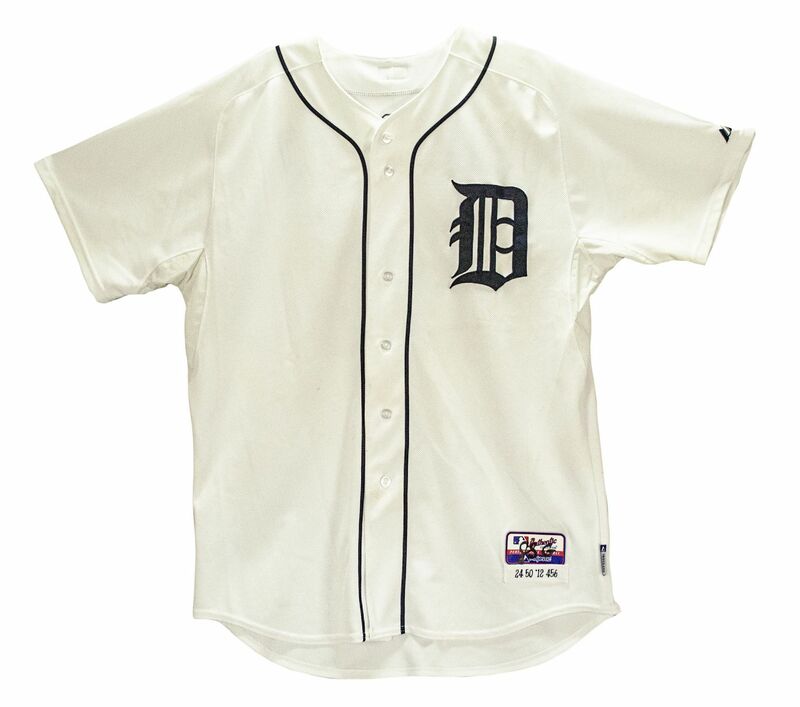 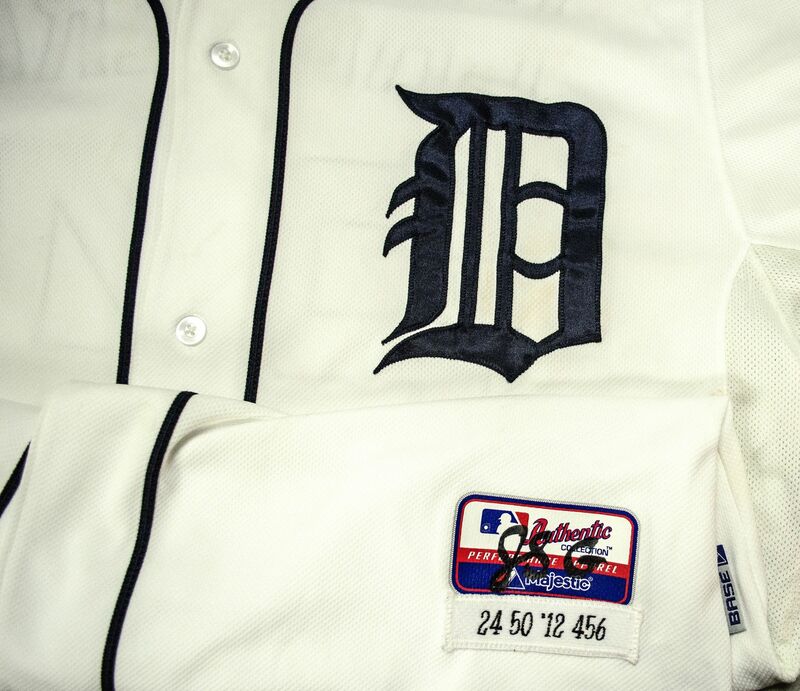 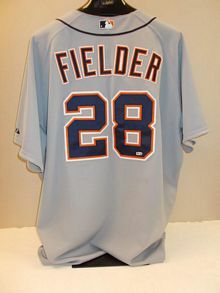 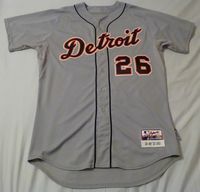 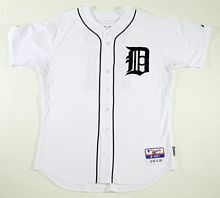 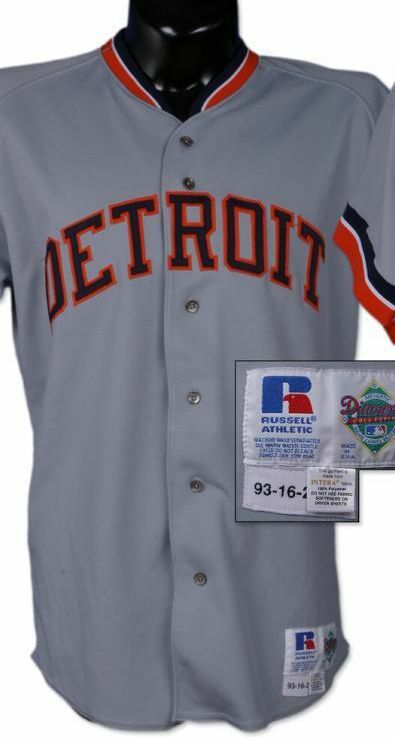 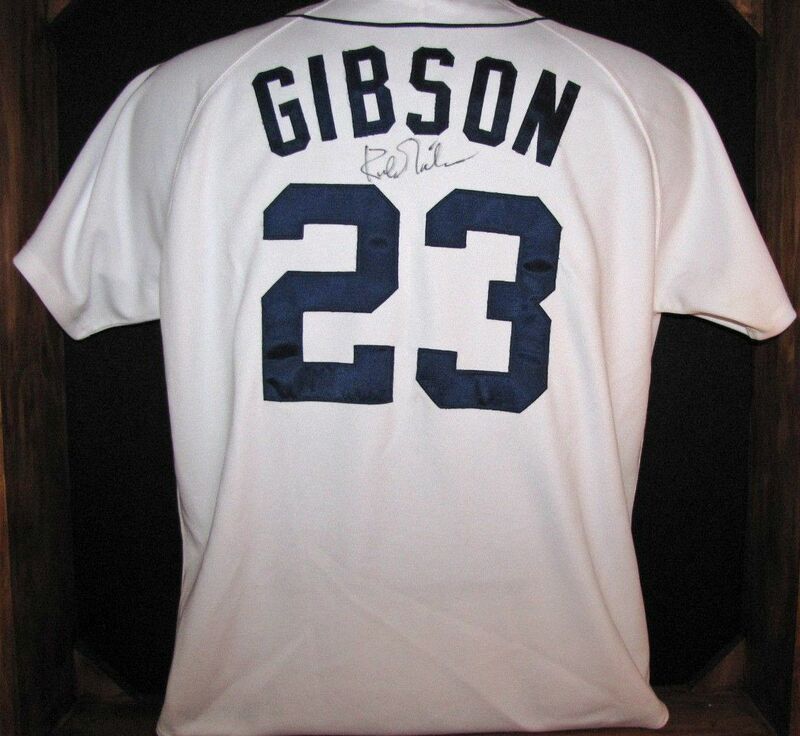 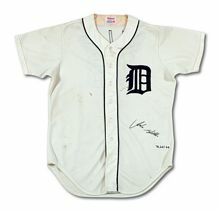 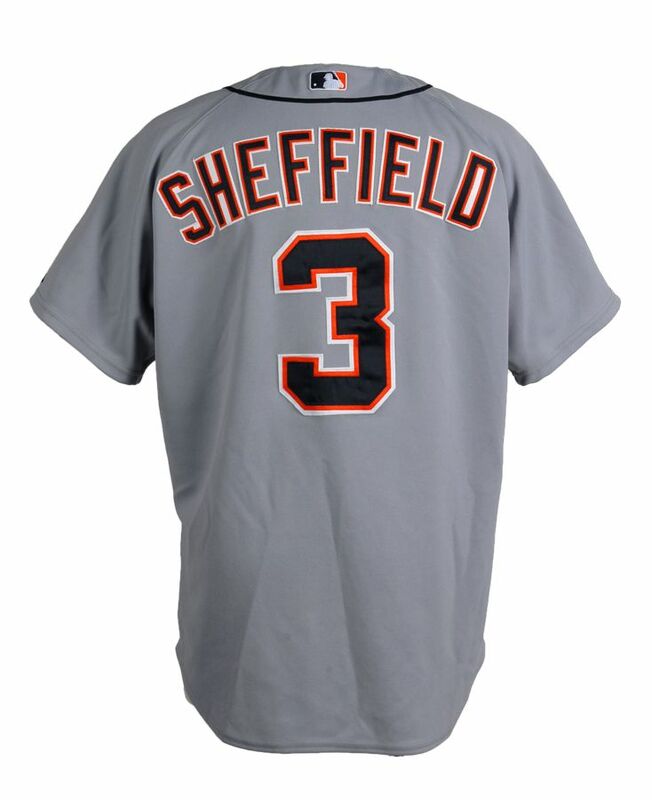 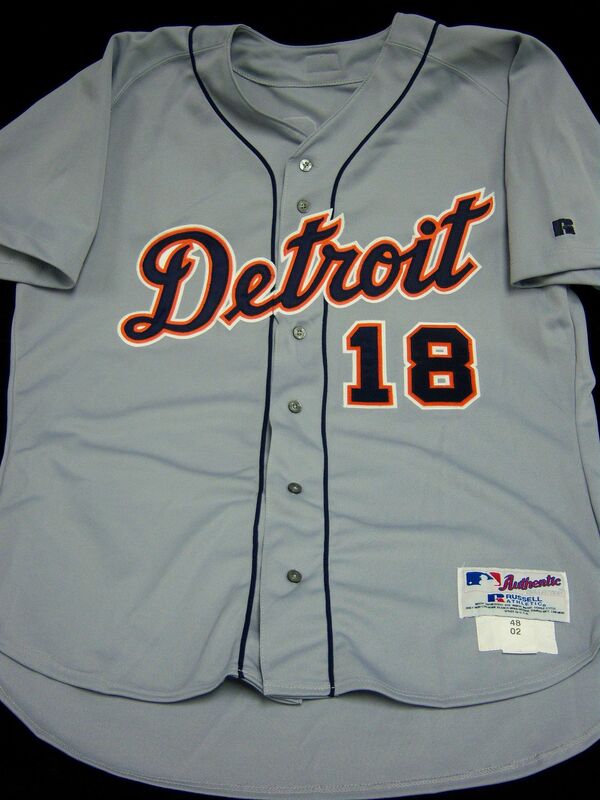 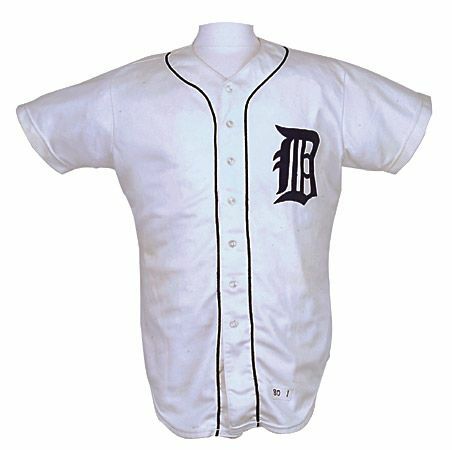 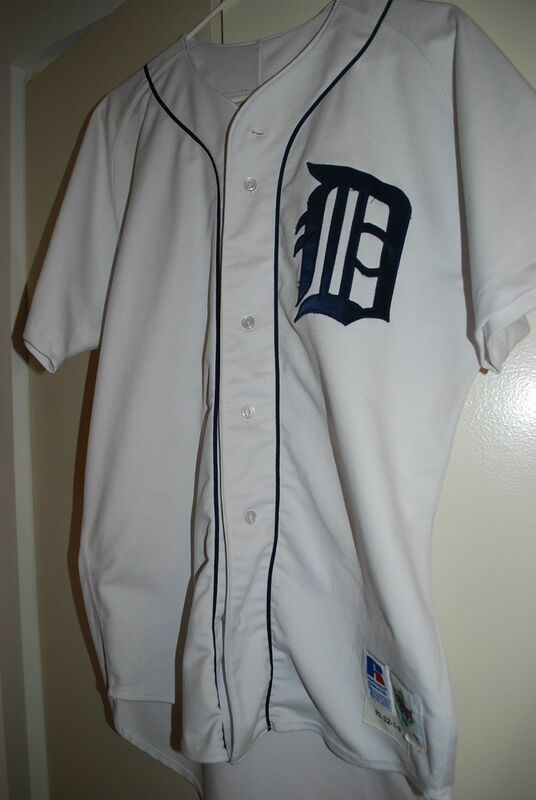 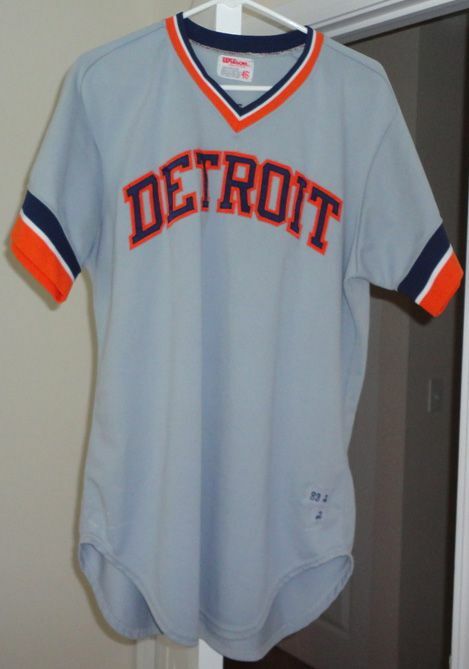 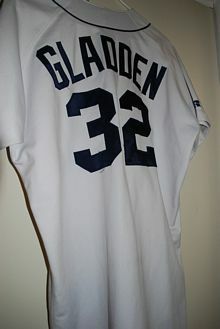 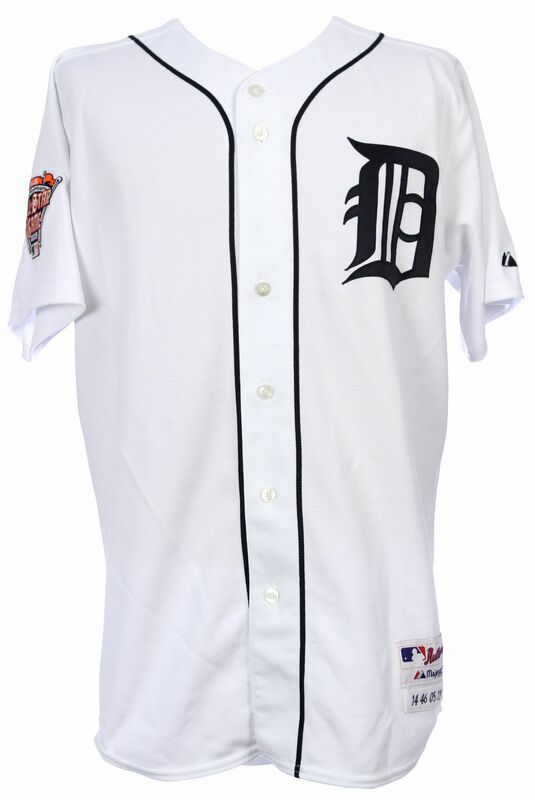 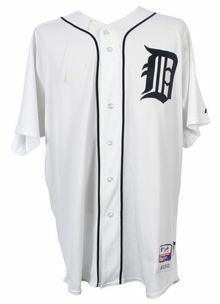 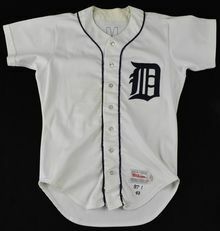 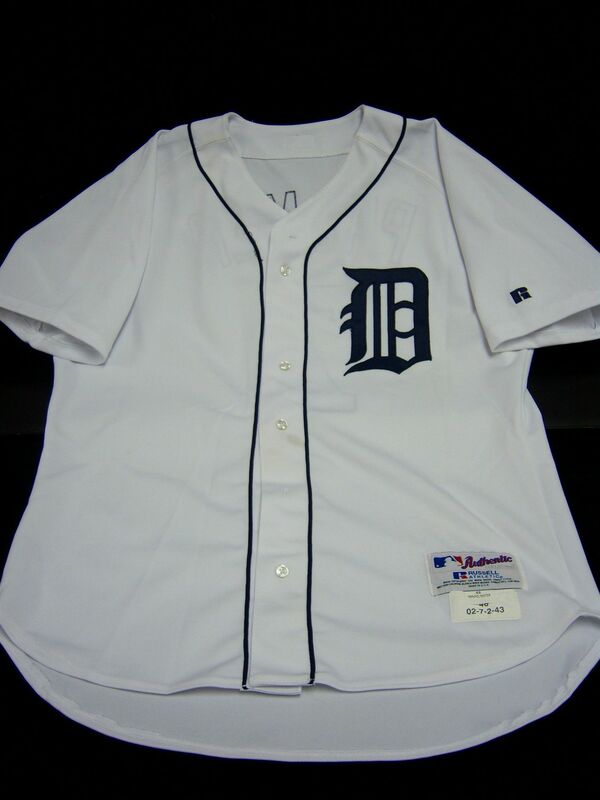 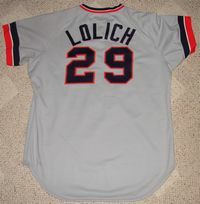 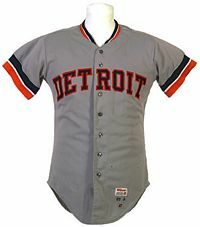 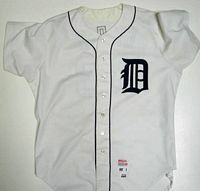 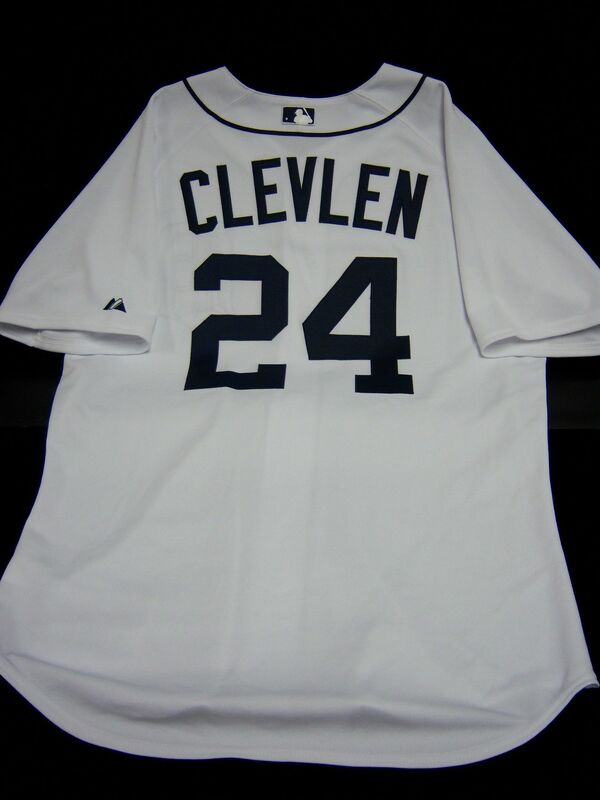 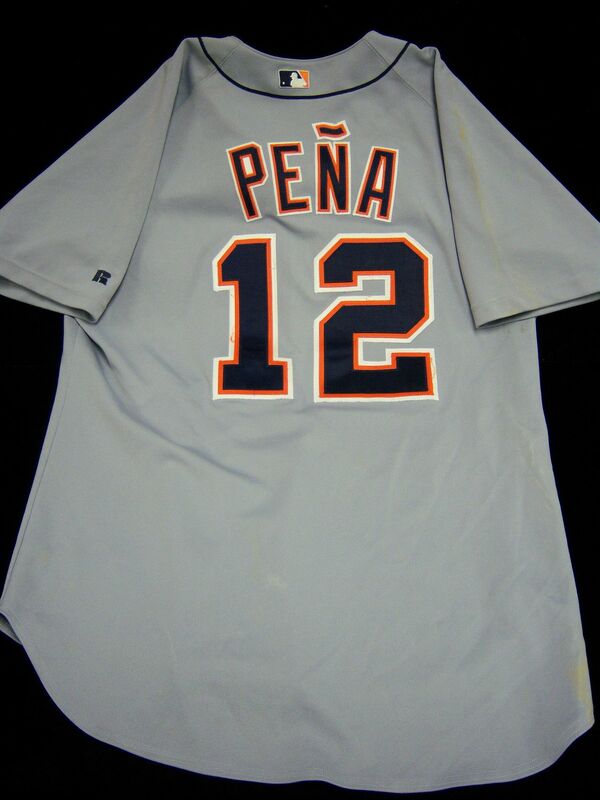 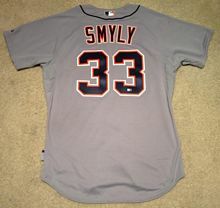 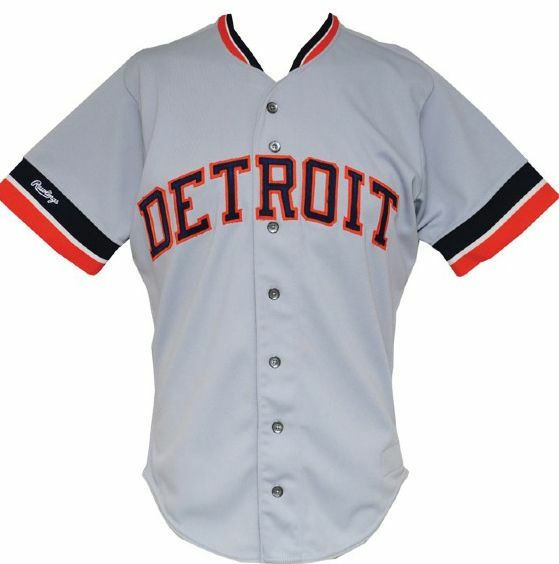 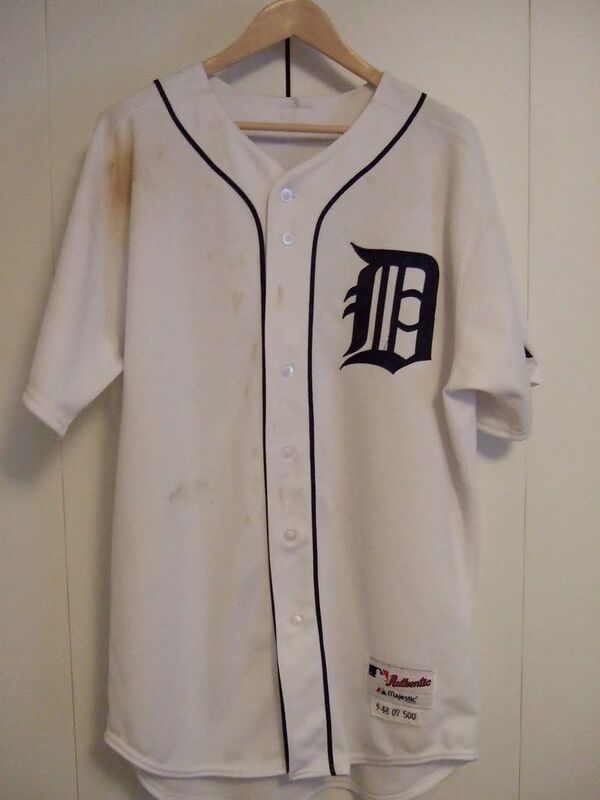 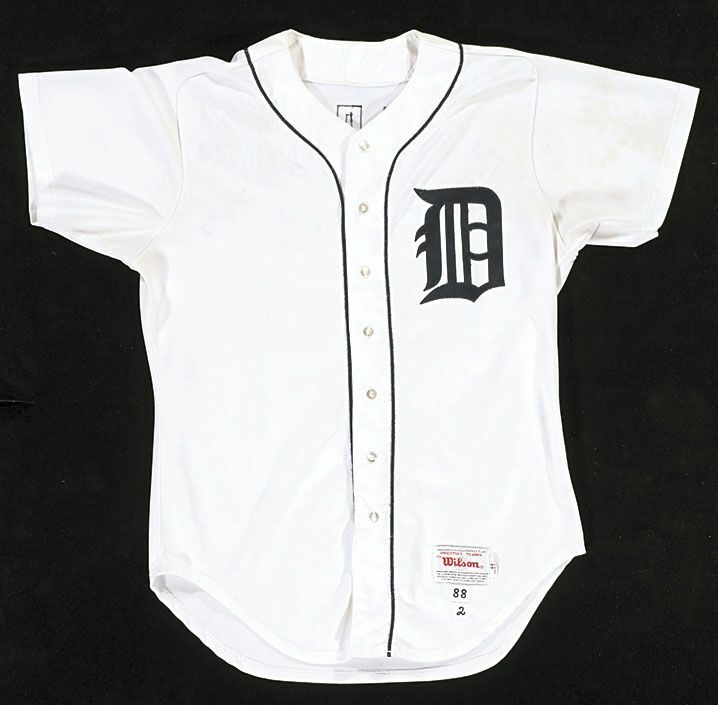 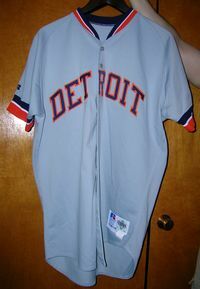 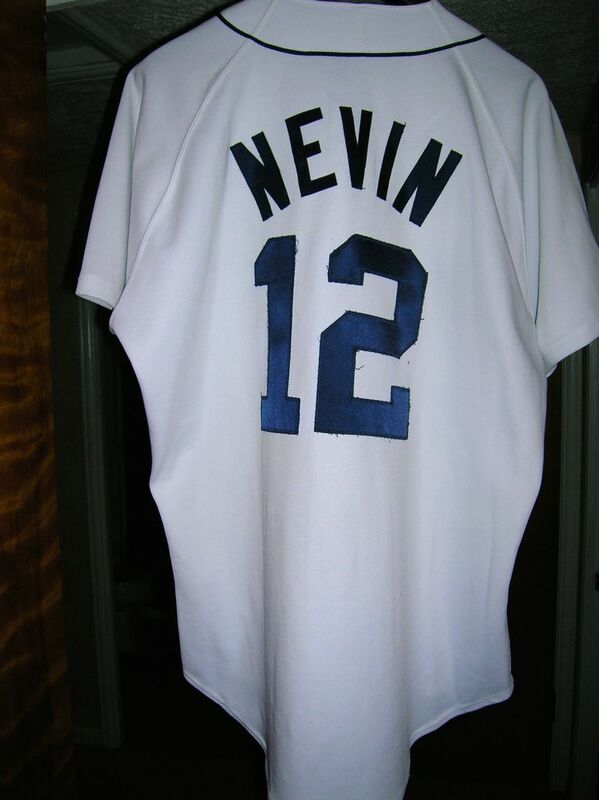 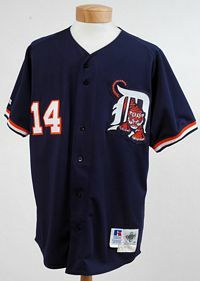 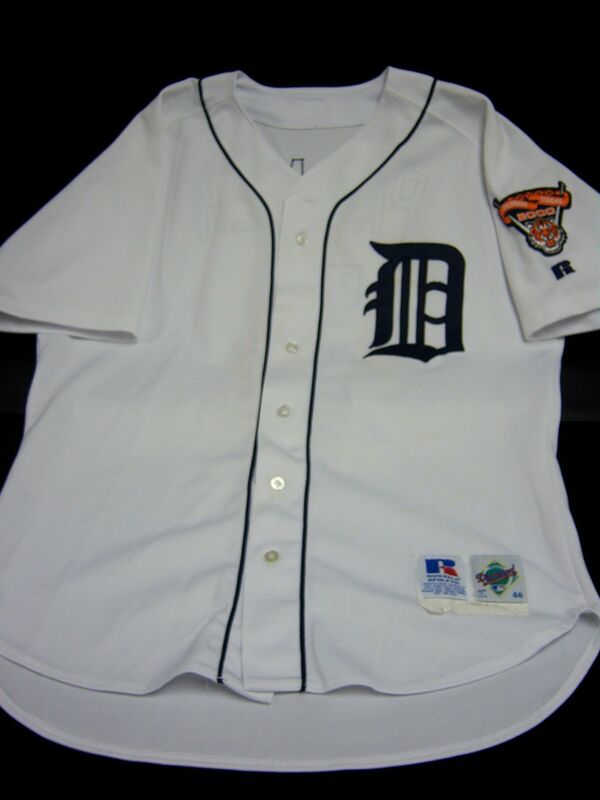 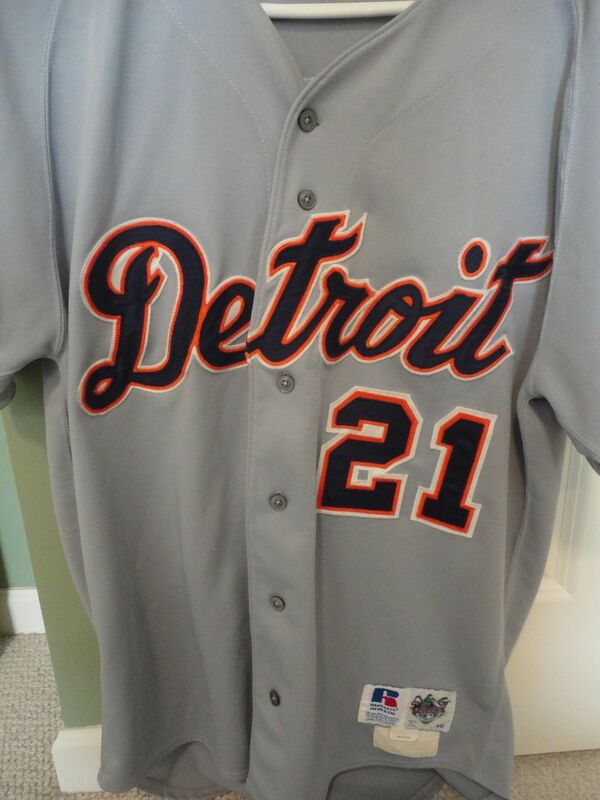 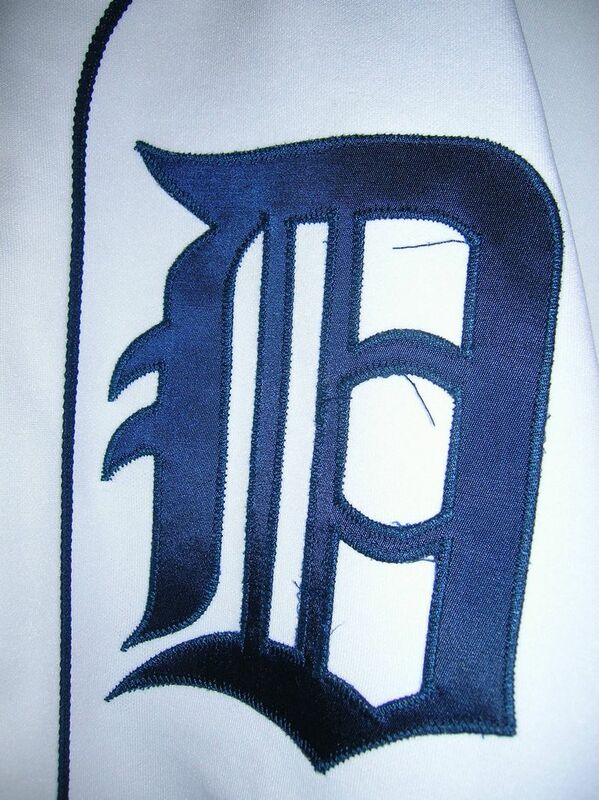 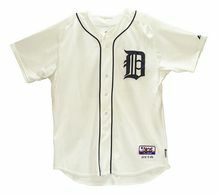 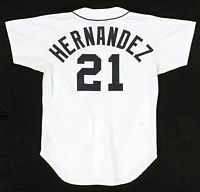 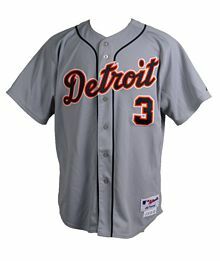 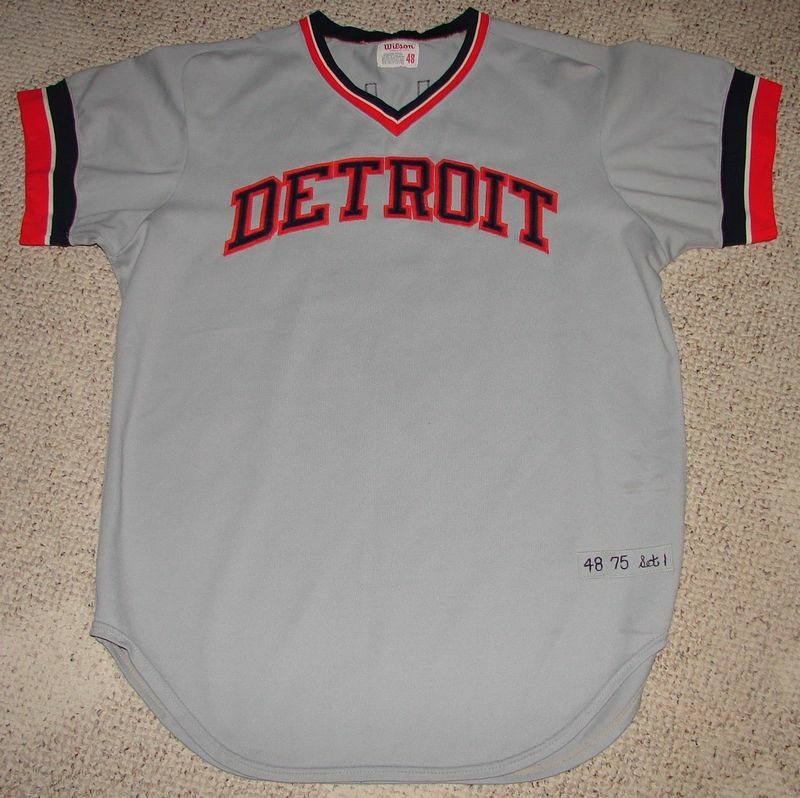 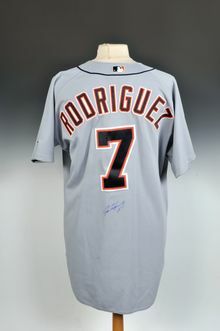 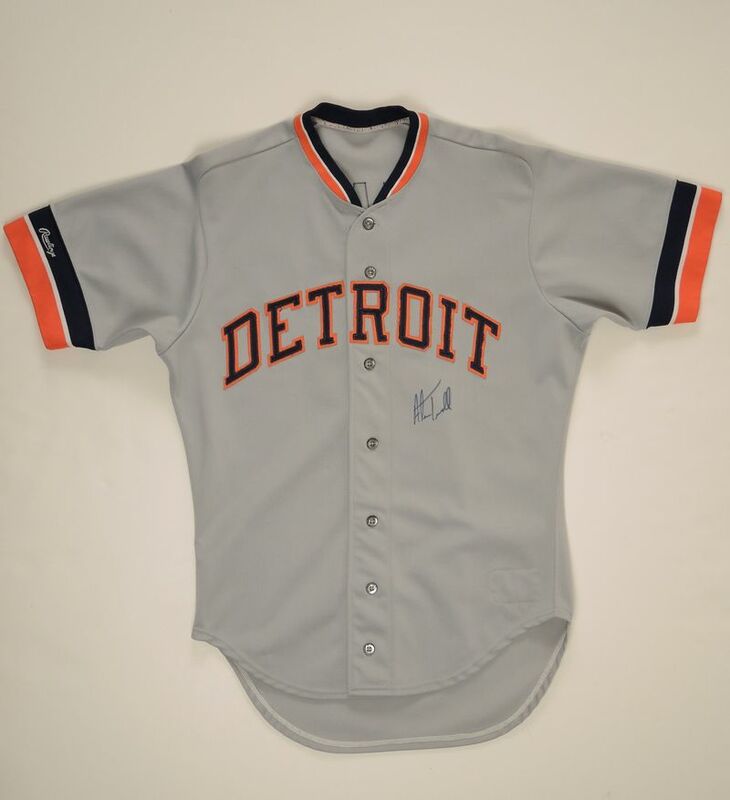 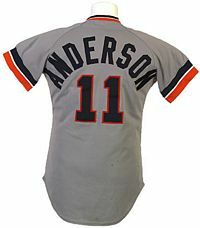 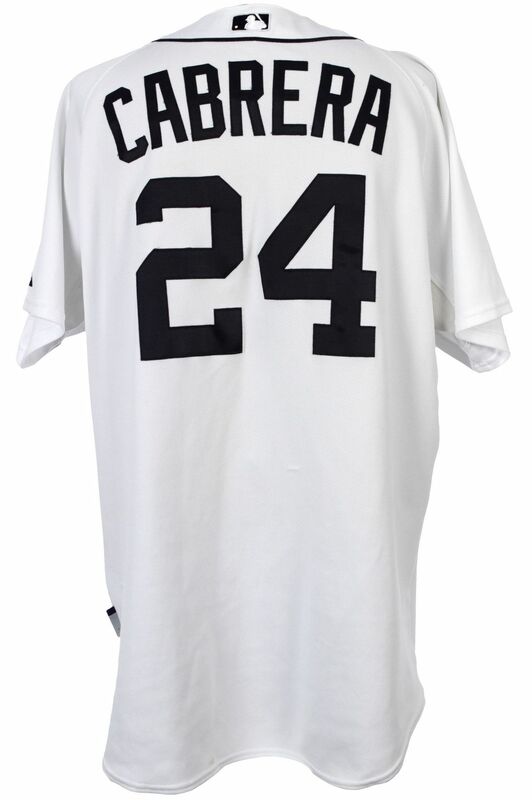 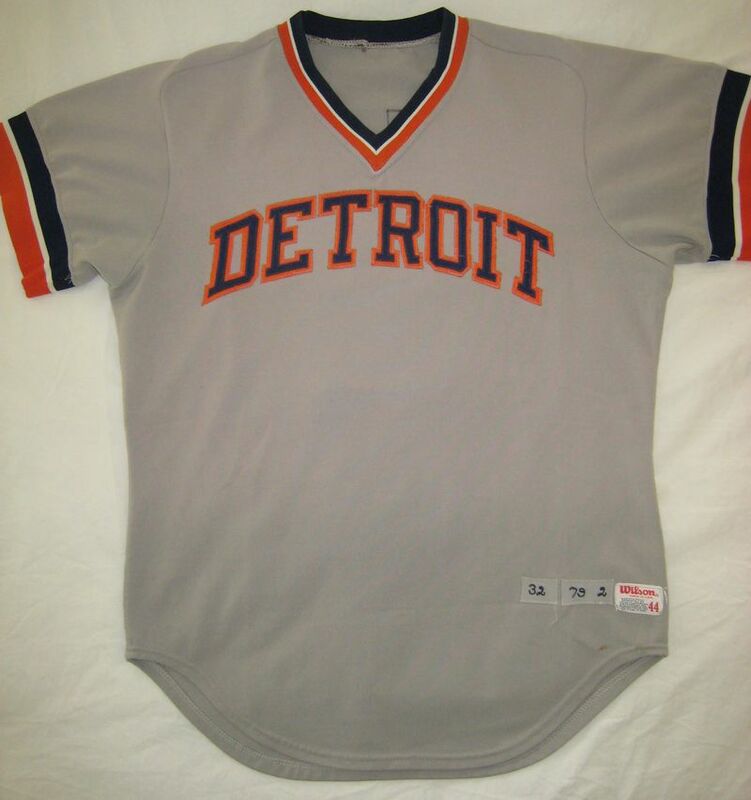 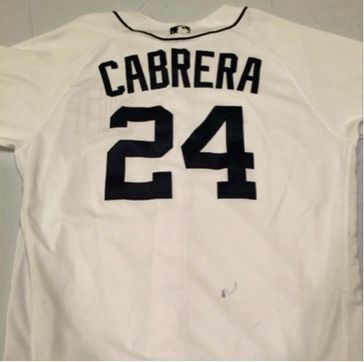 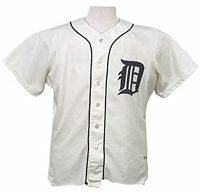 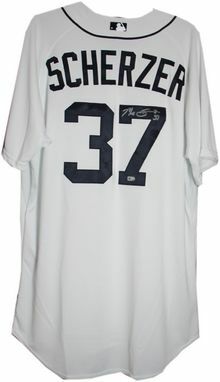 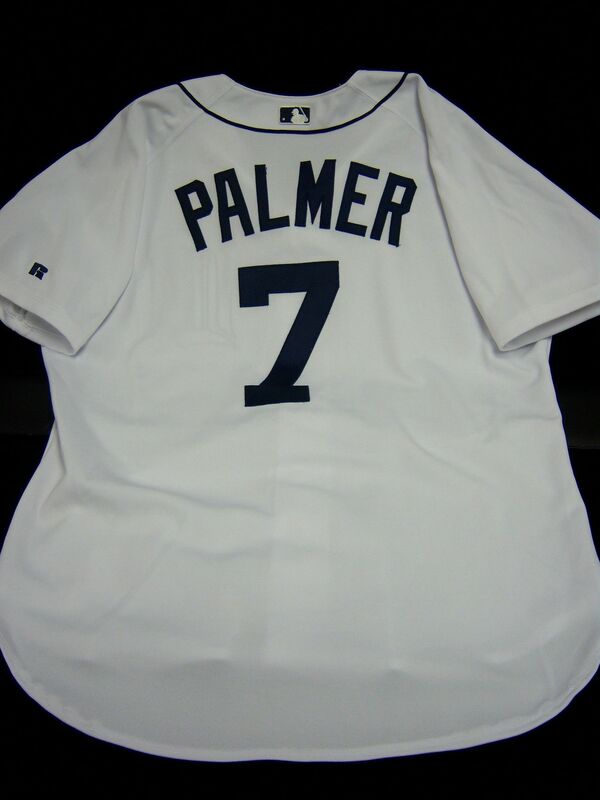 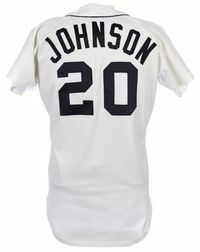 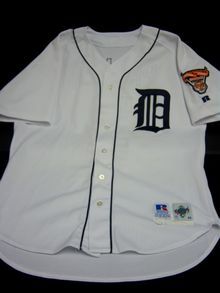 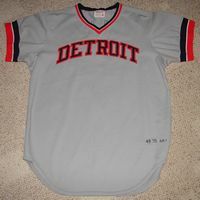 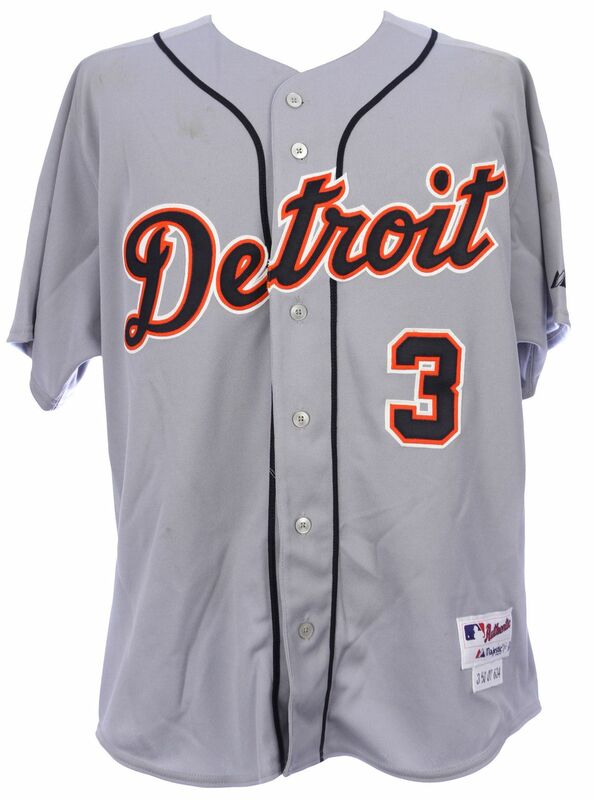 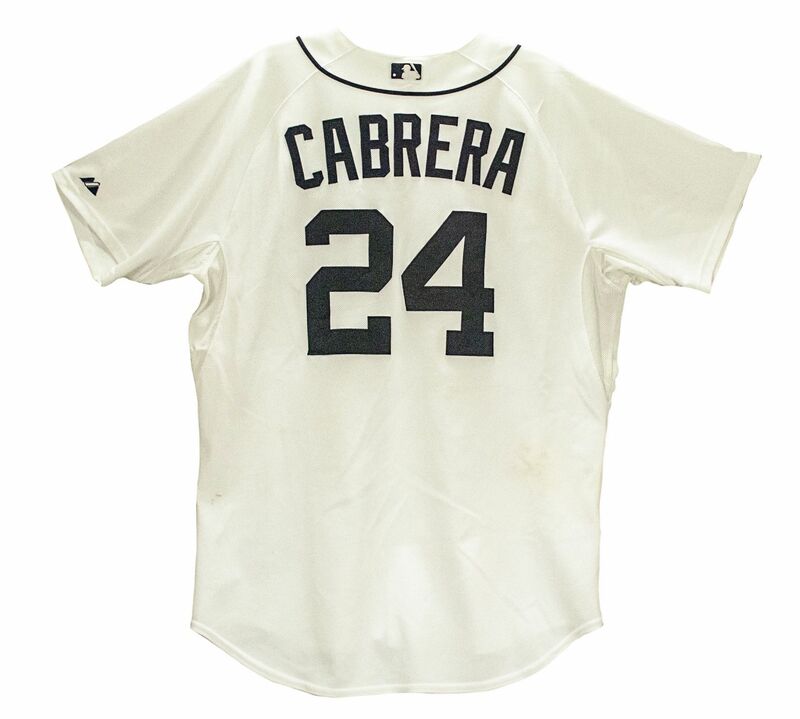 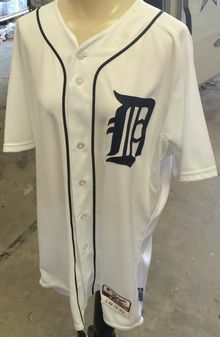 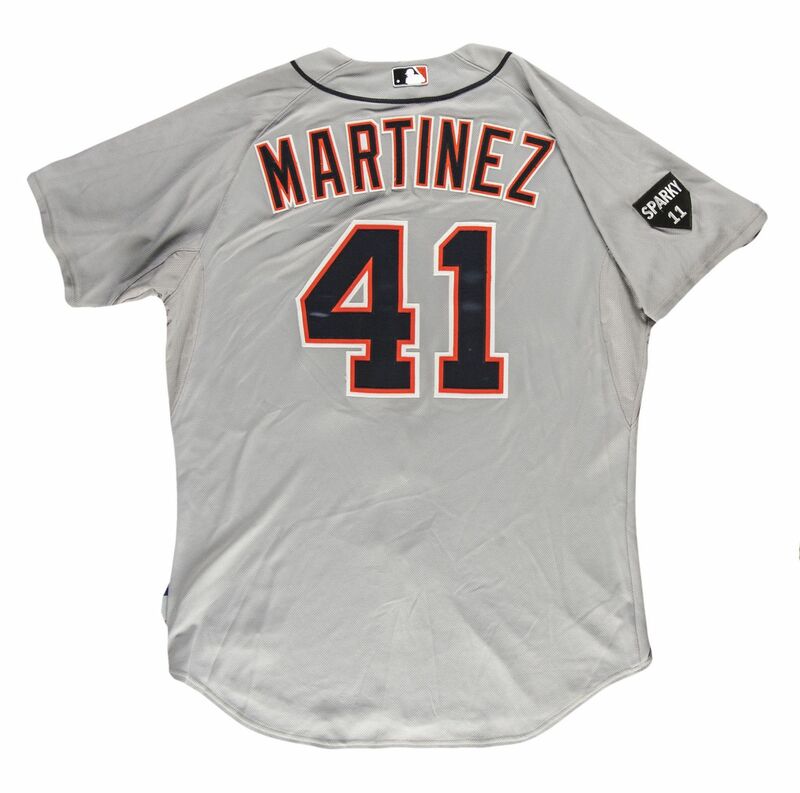 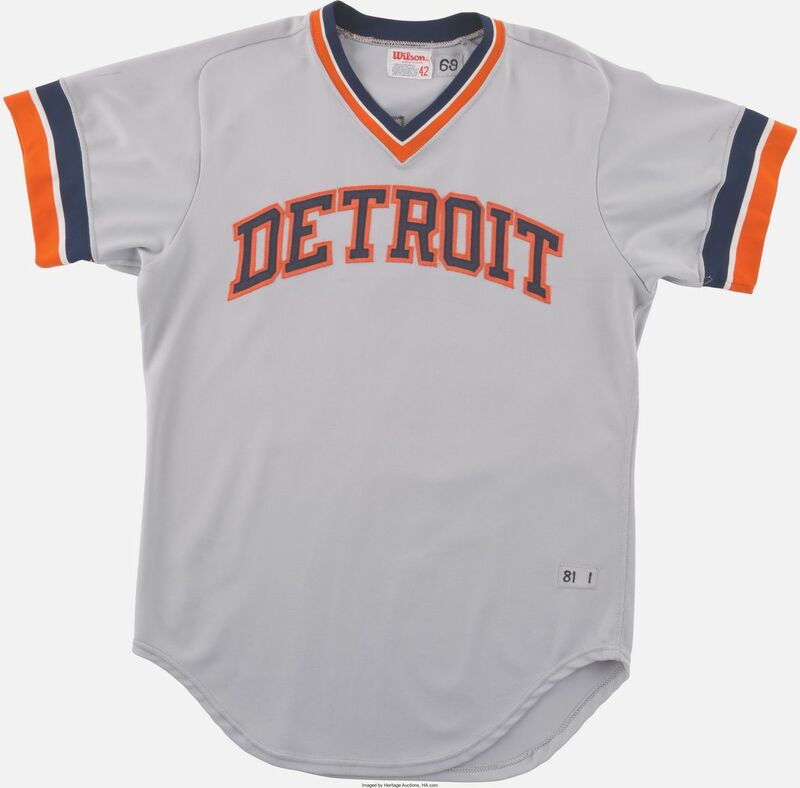 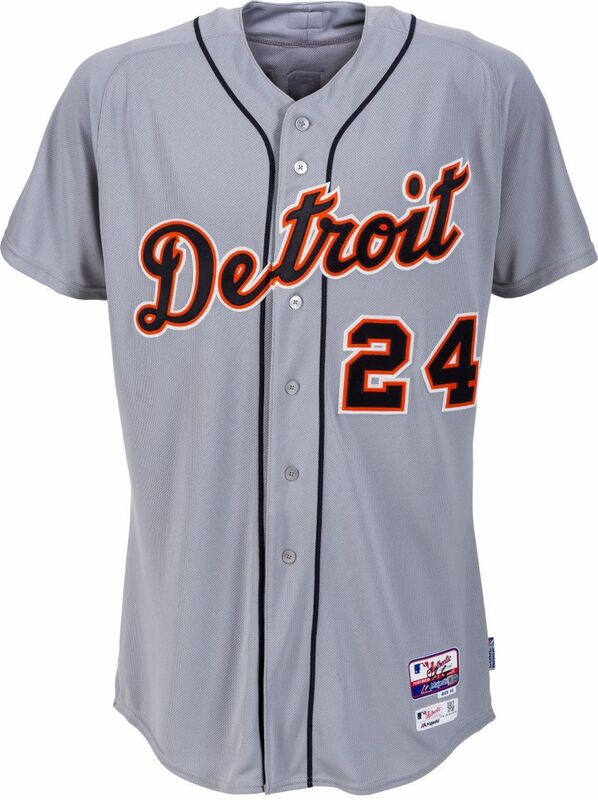 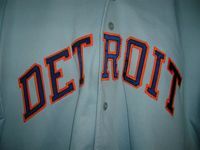 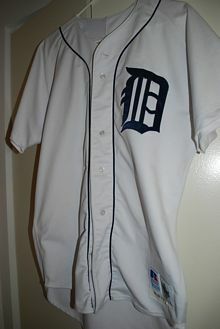 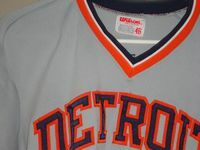 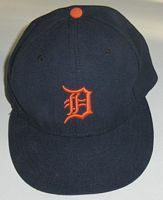 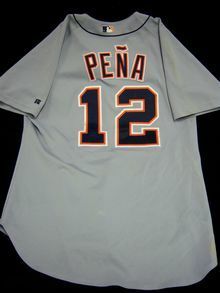 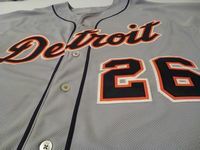 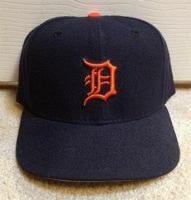 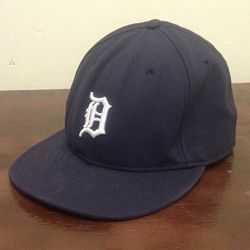 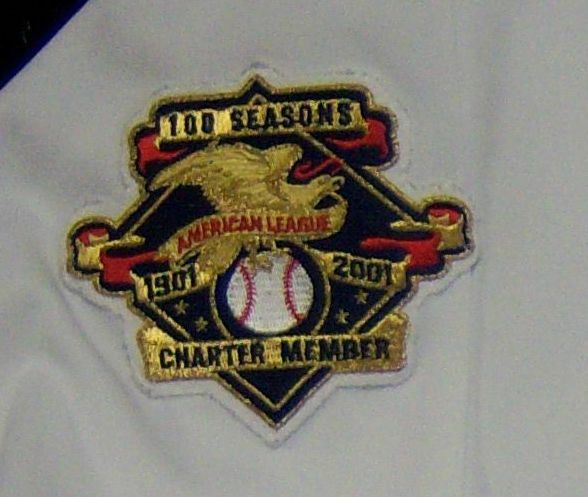 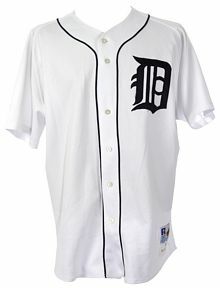 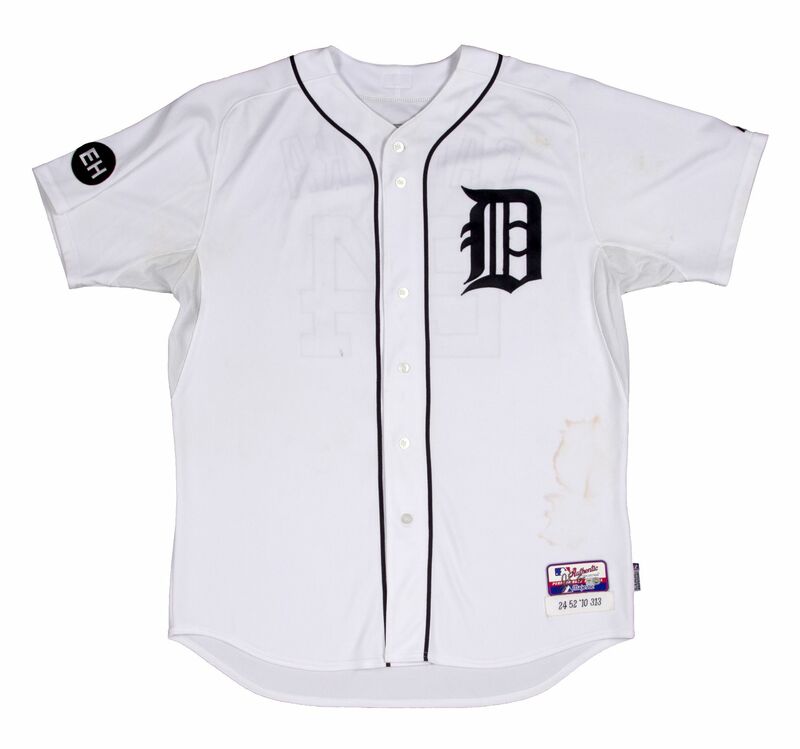 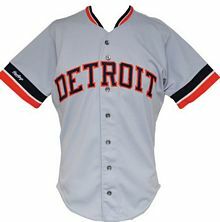 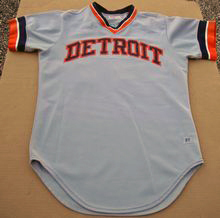 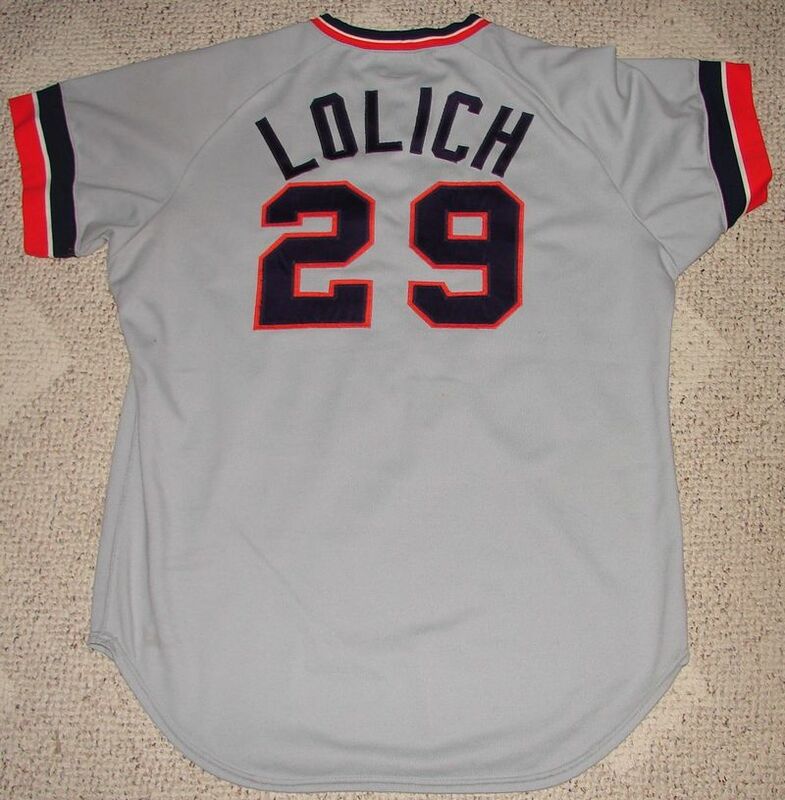 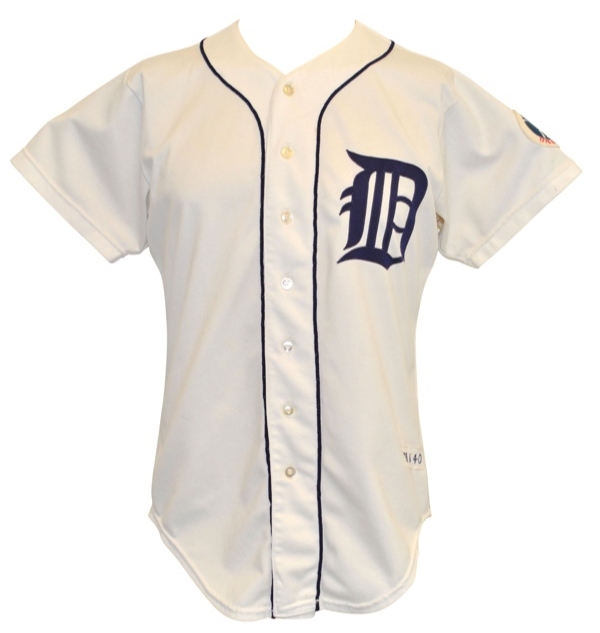 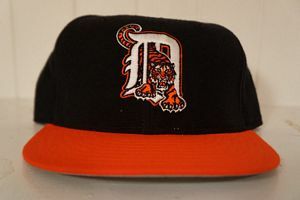 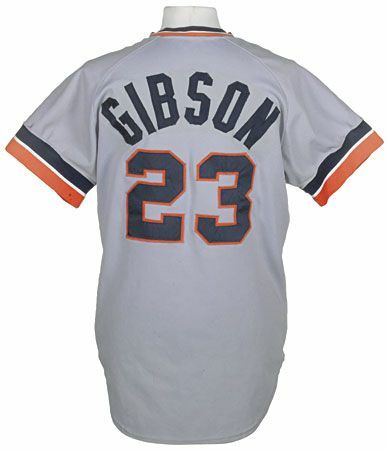 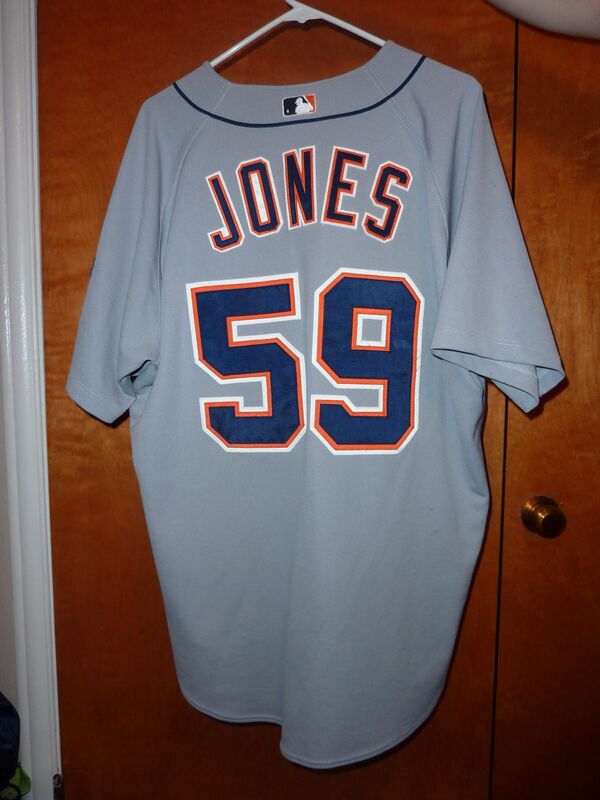 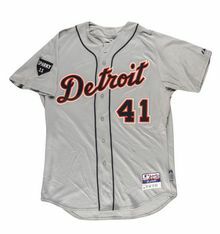 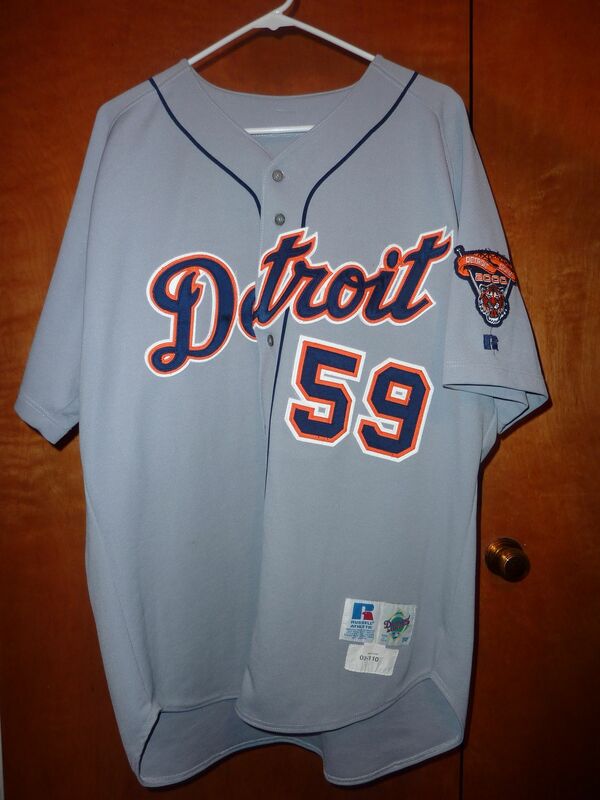 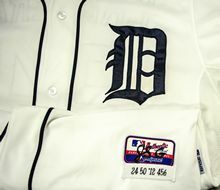 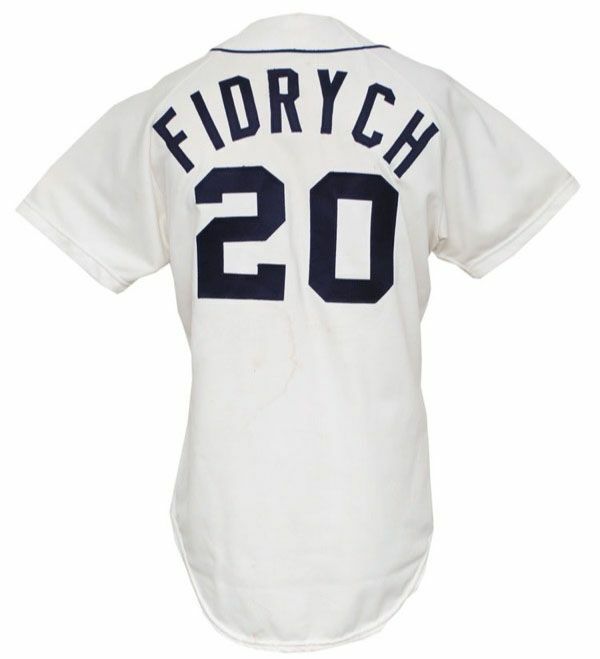 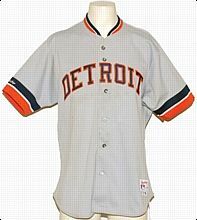 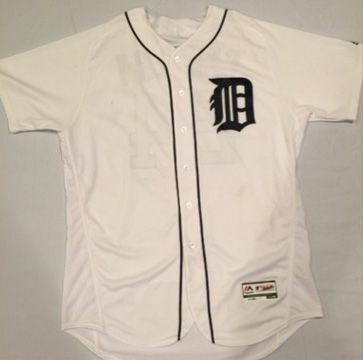 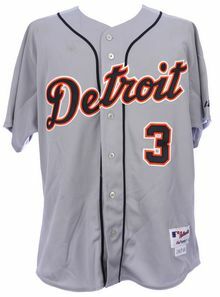 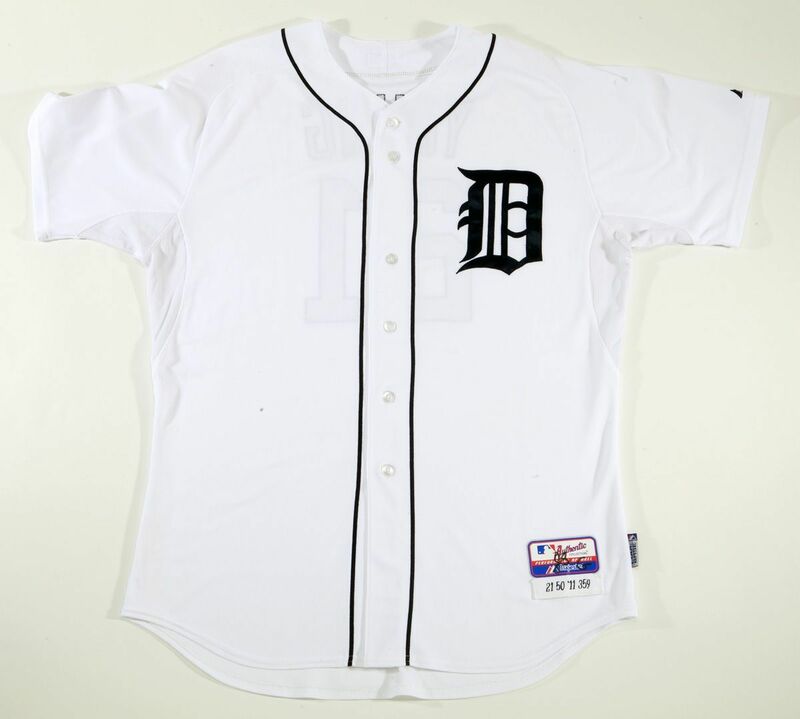 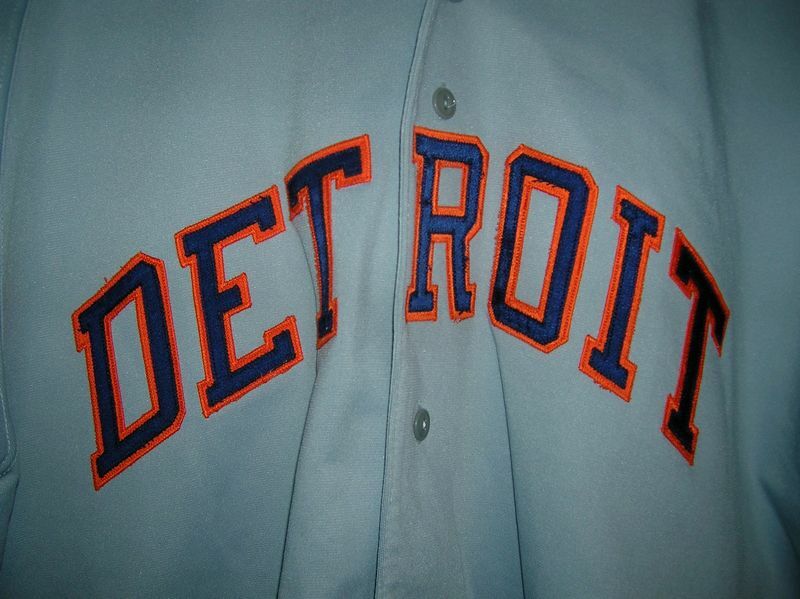 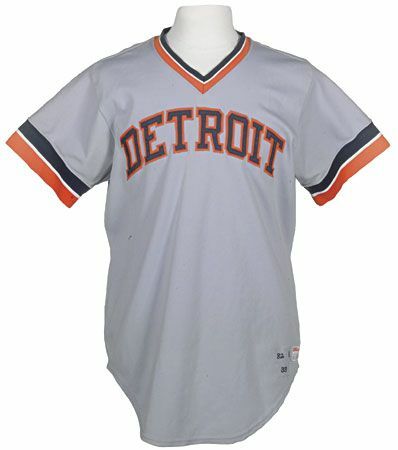 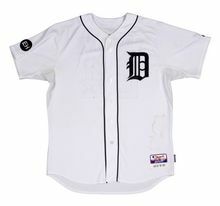 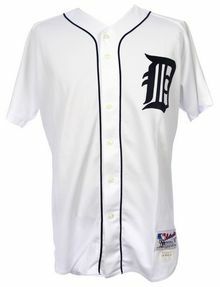 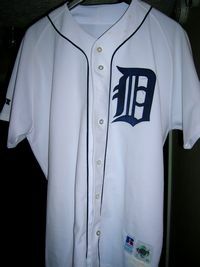 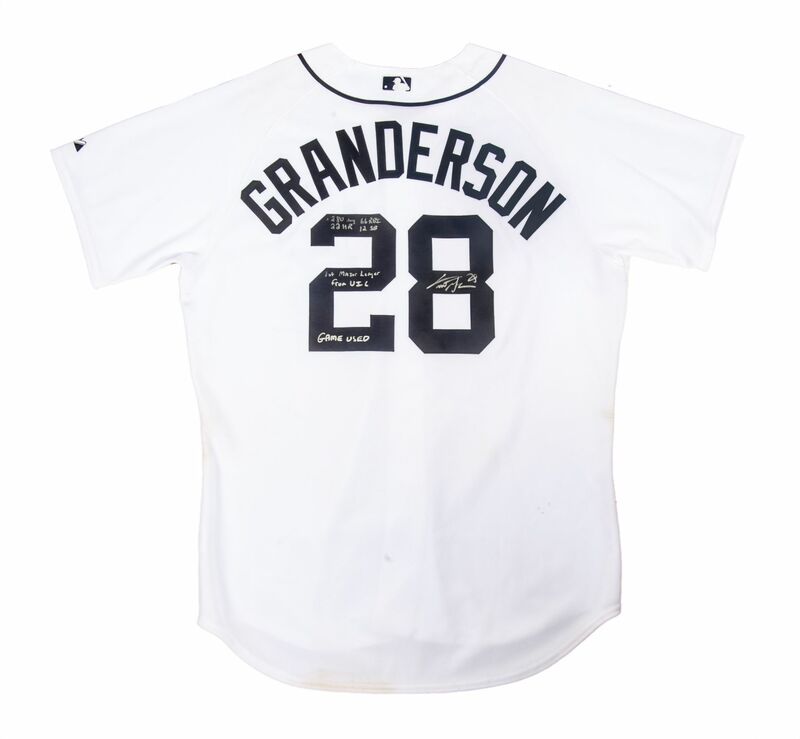 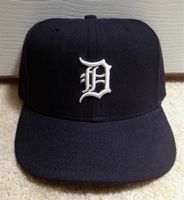 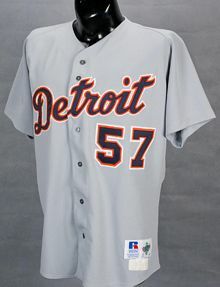 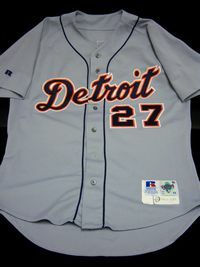 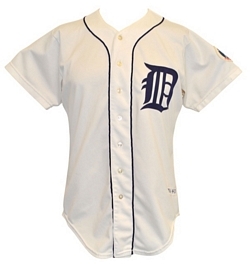 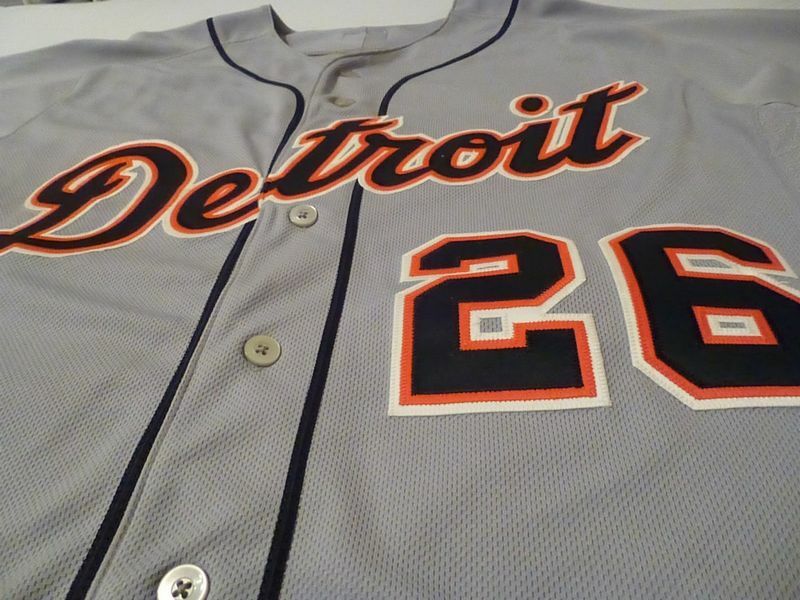 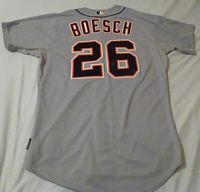 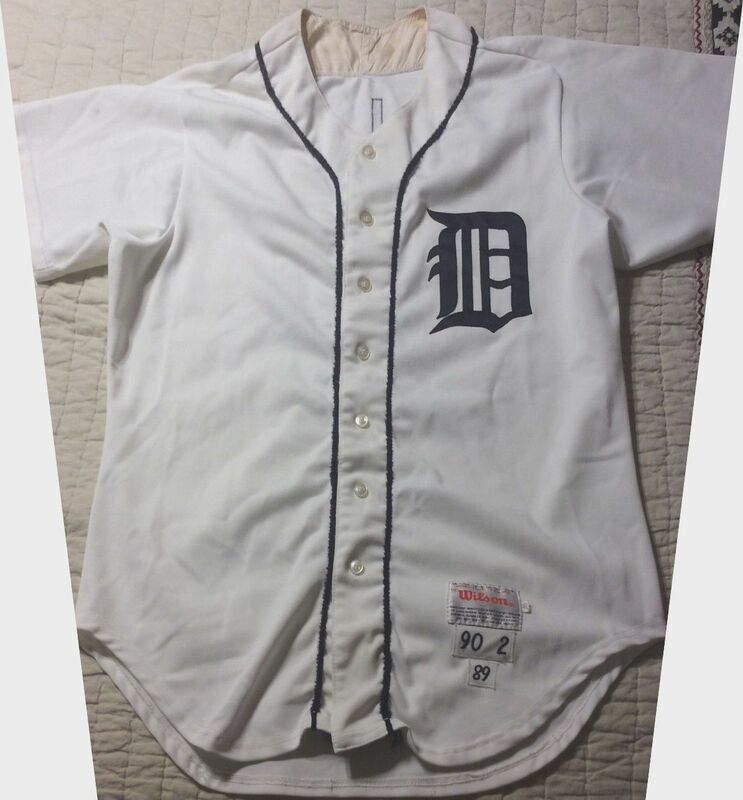 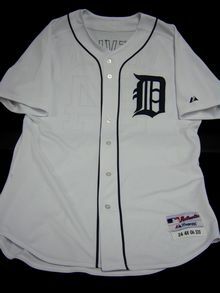 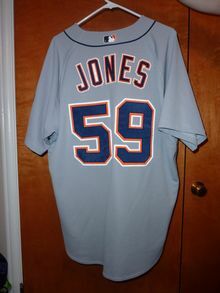 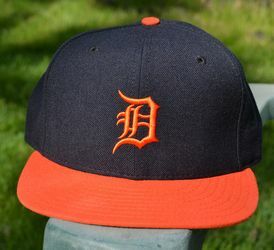 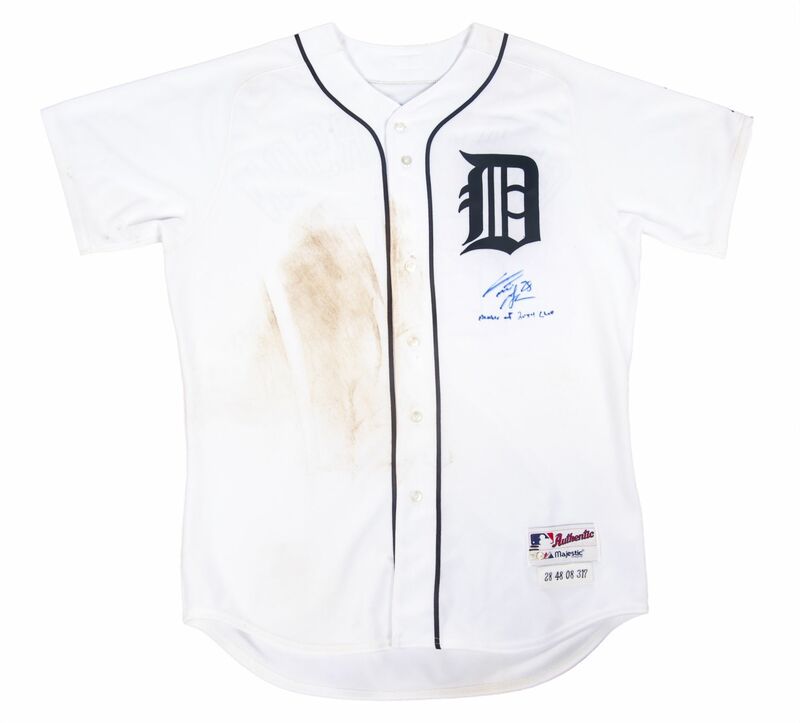 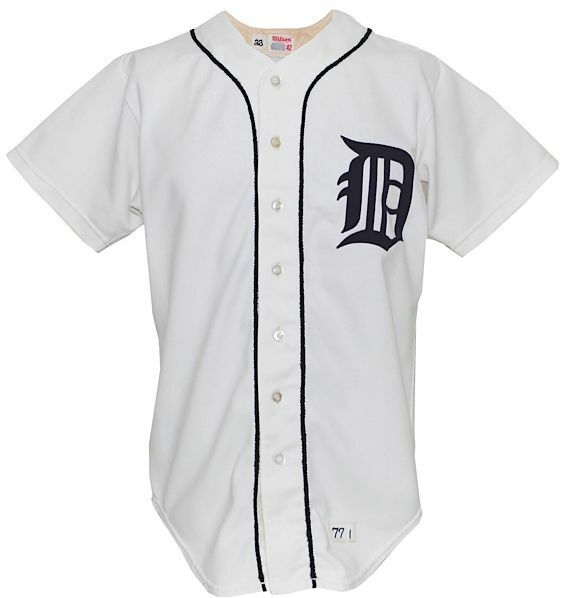 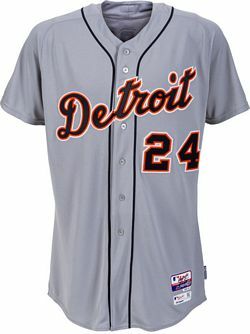 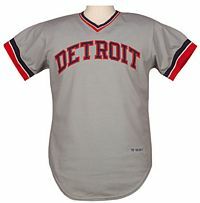 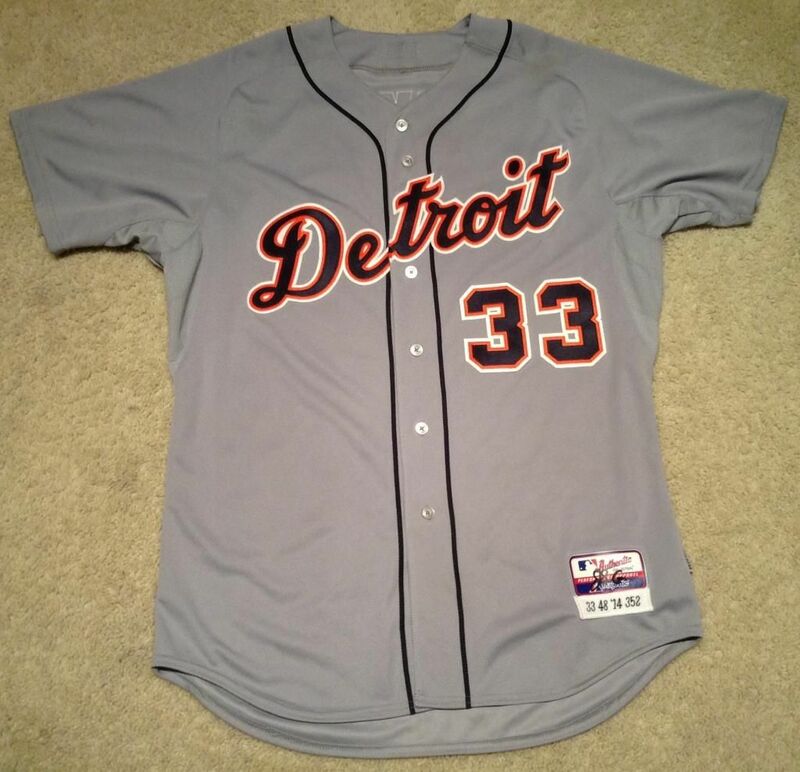 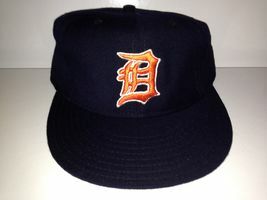 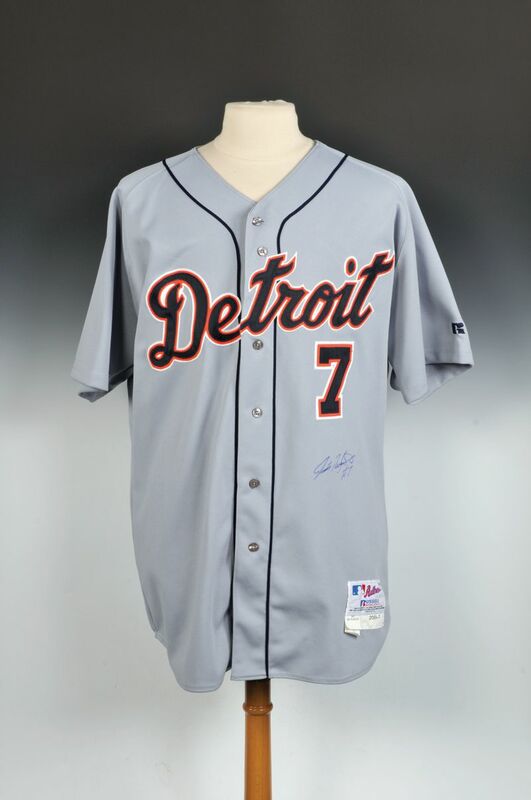 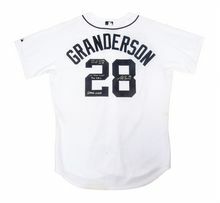 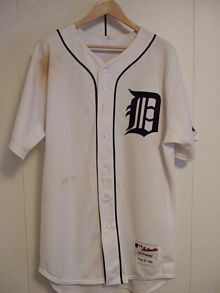 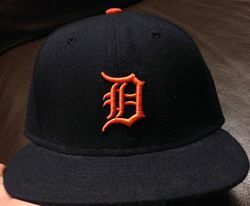 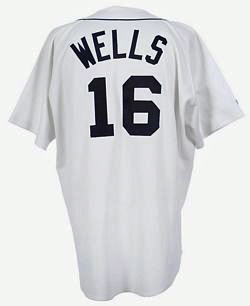 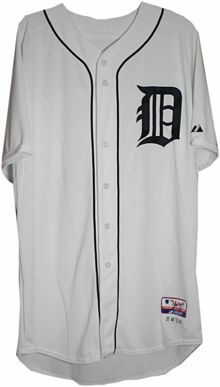 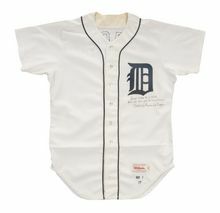 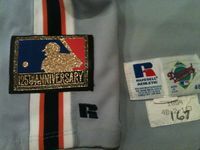 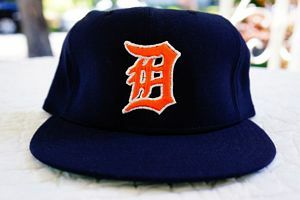 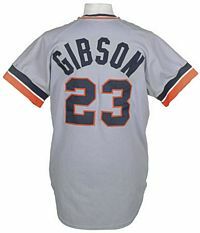 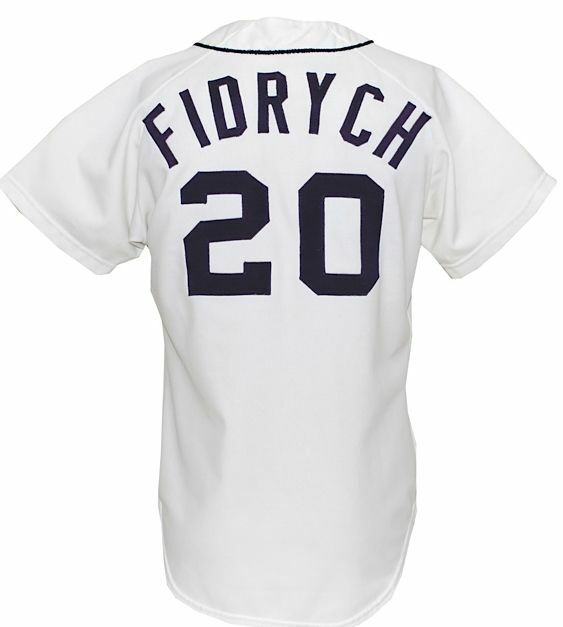 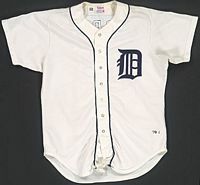 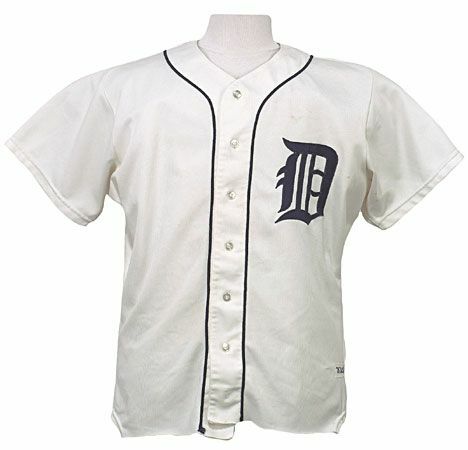 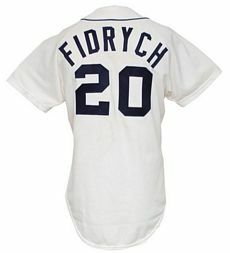 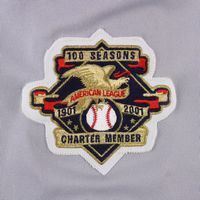 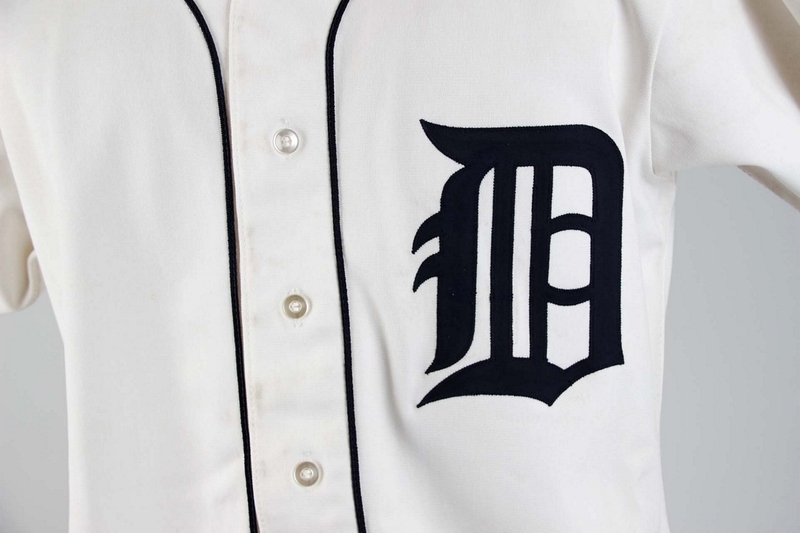 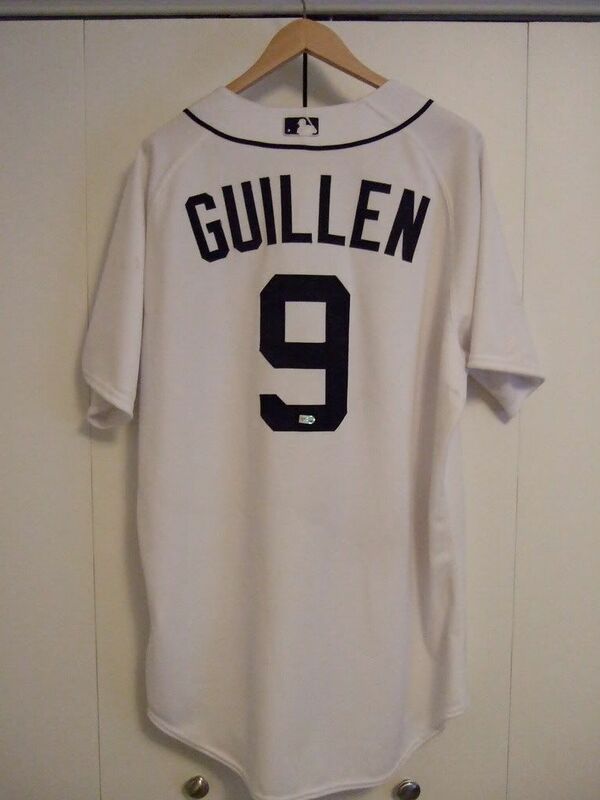 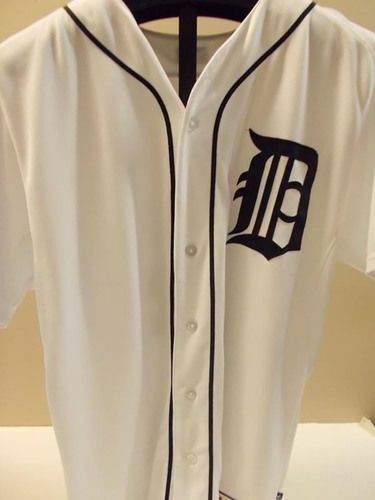 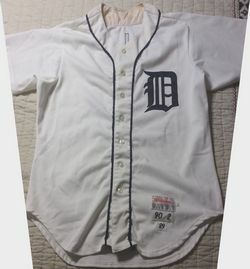 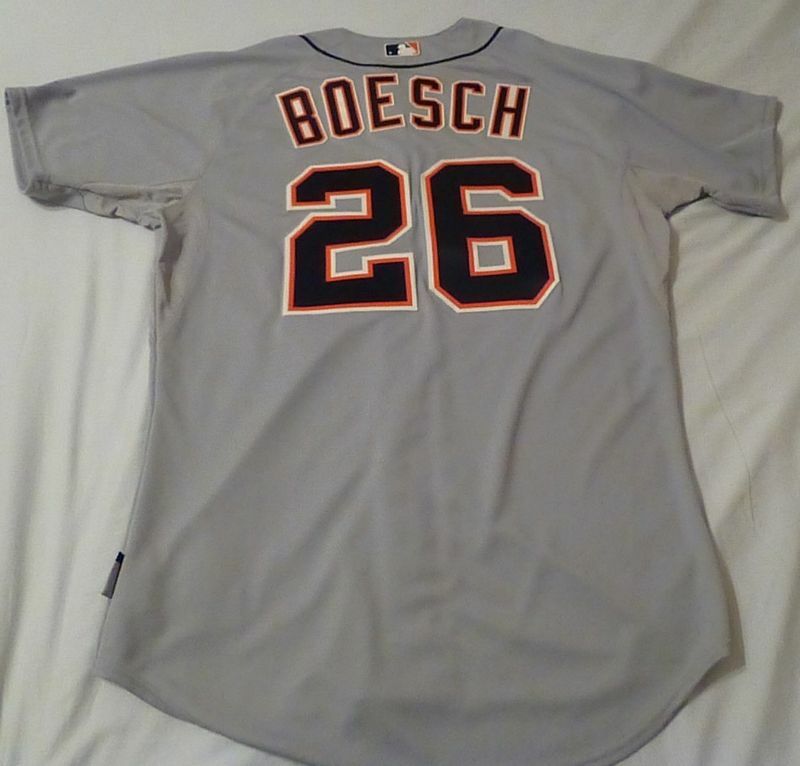 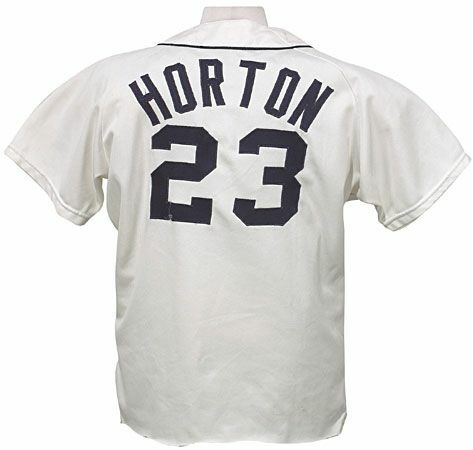 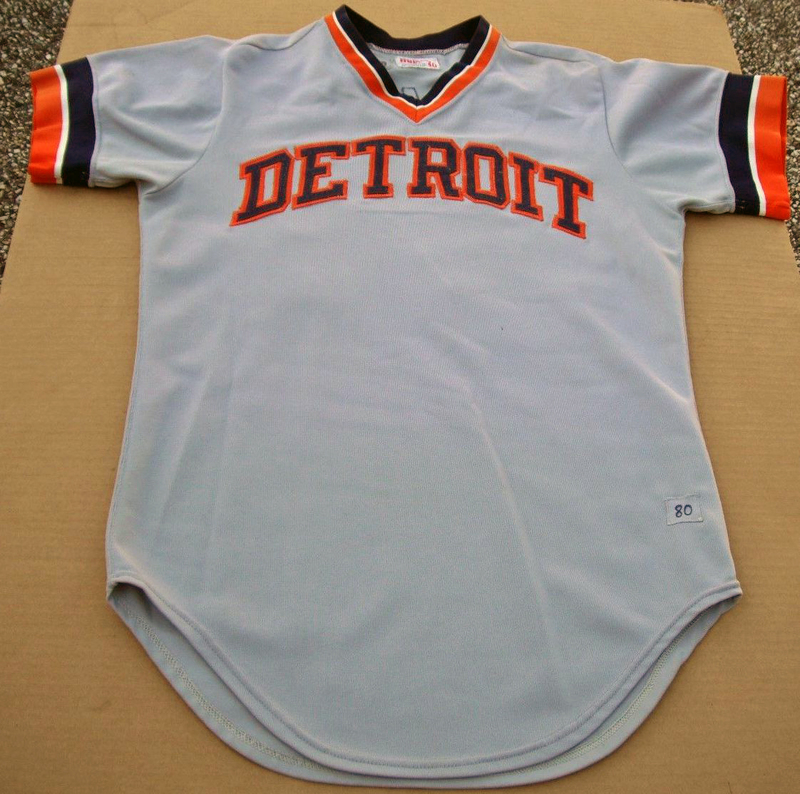 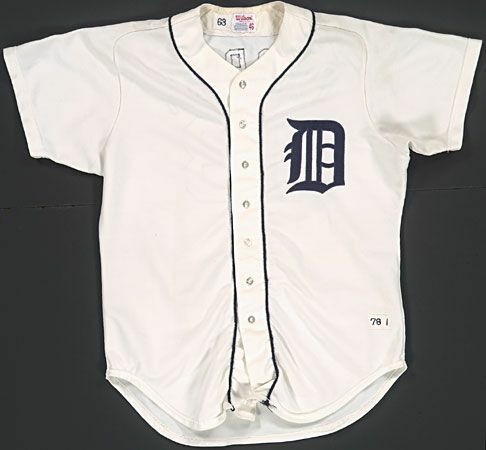 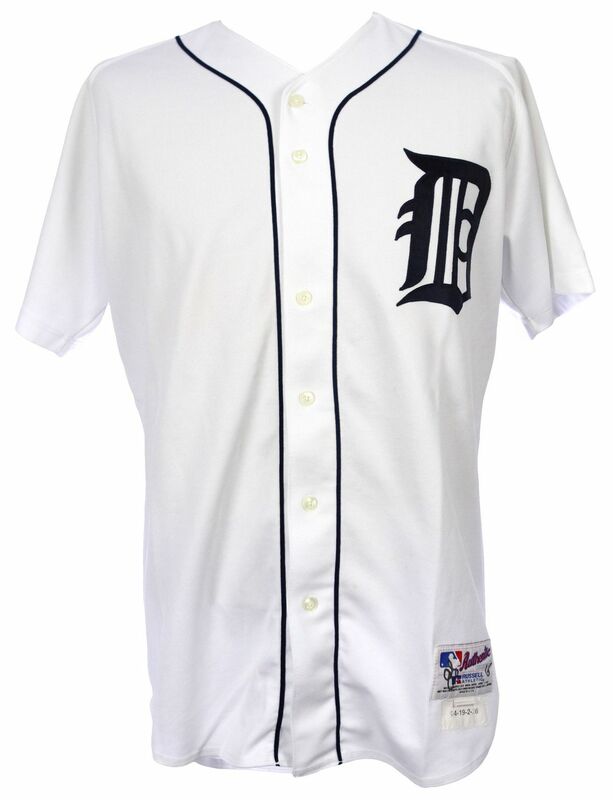 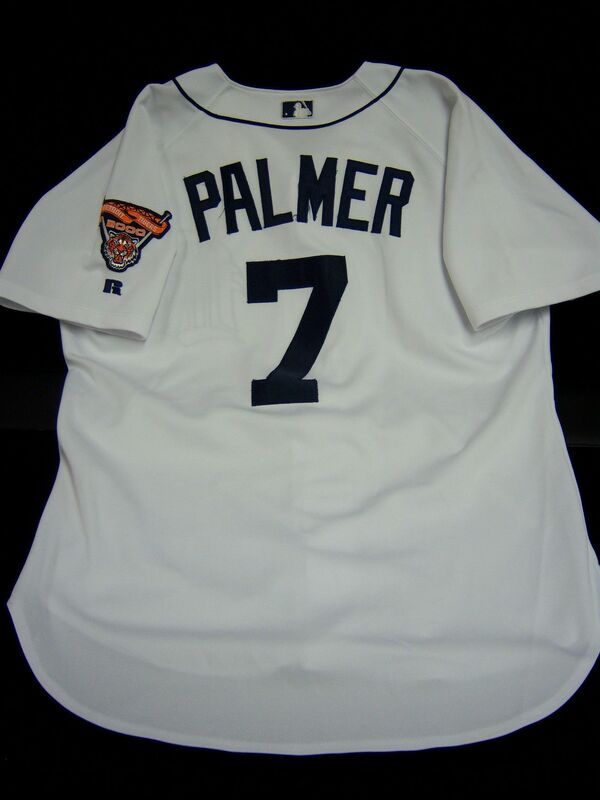 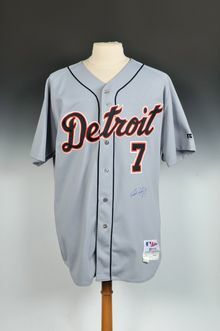 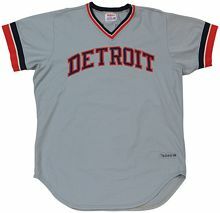 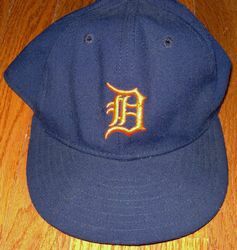 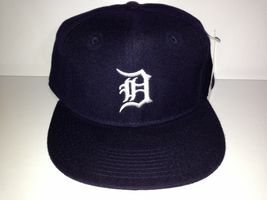 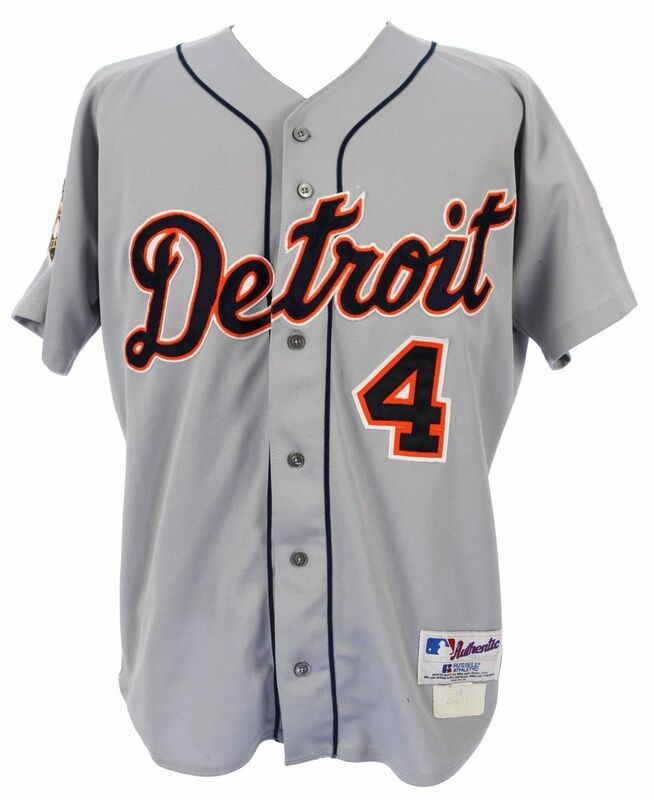 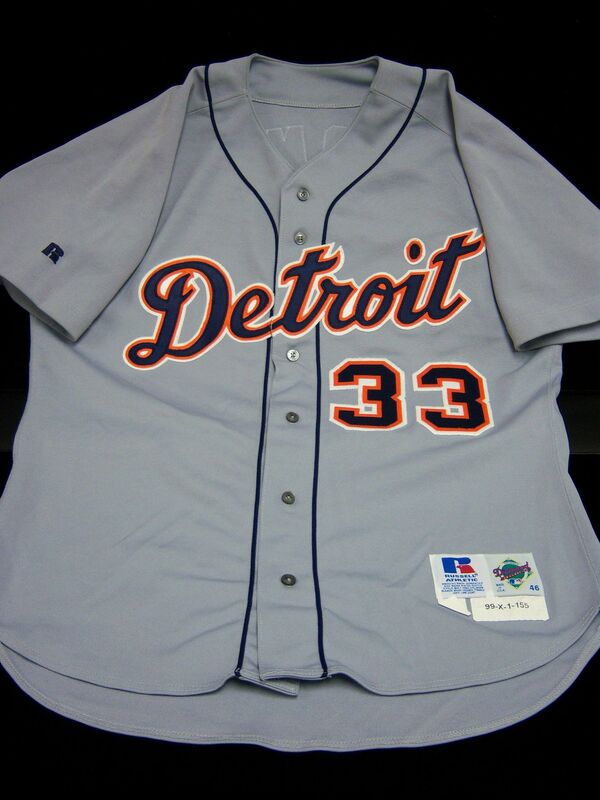 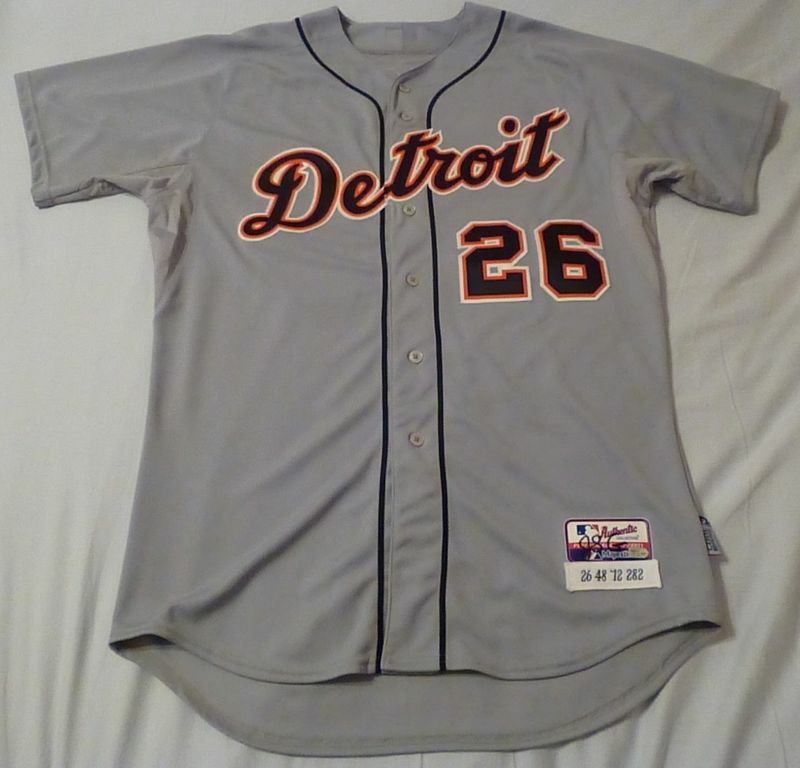 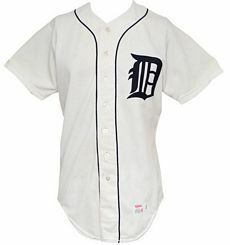 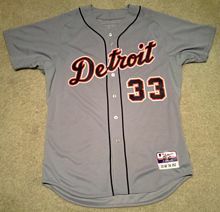 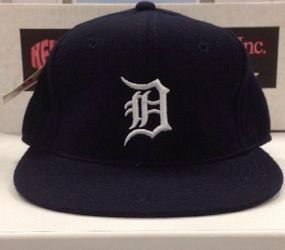 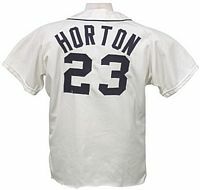 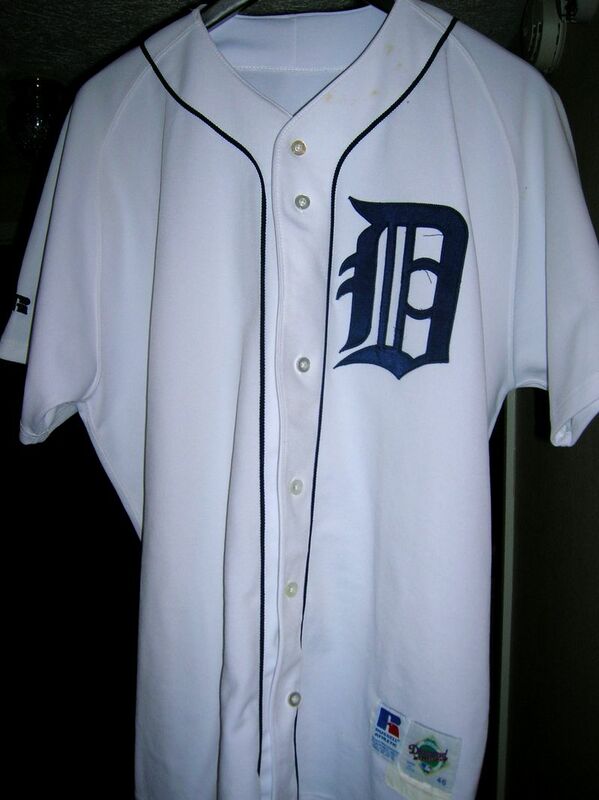 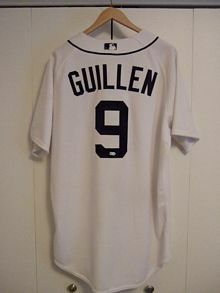 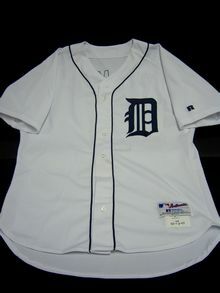 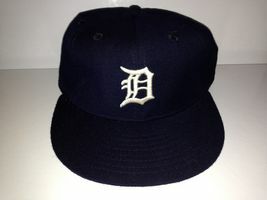 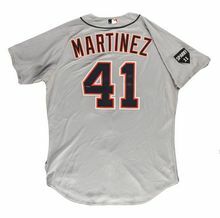 Detroit Tigers 2000 patch worn on home and road jerseys in 2000. 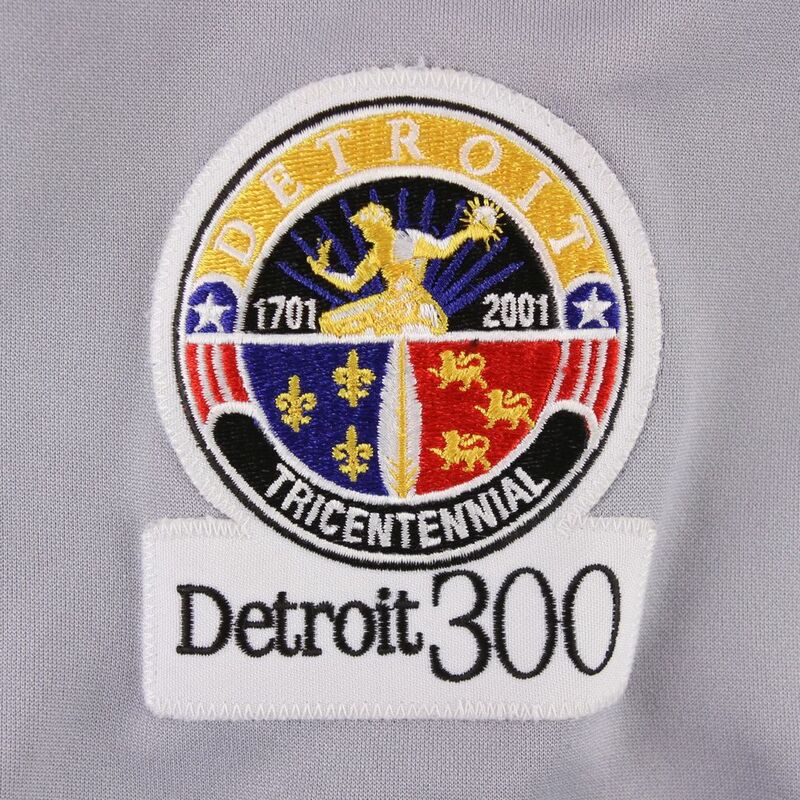 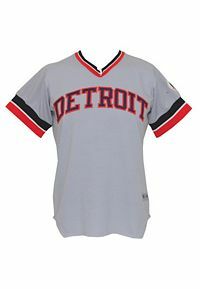 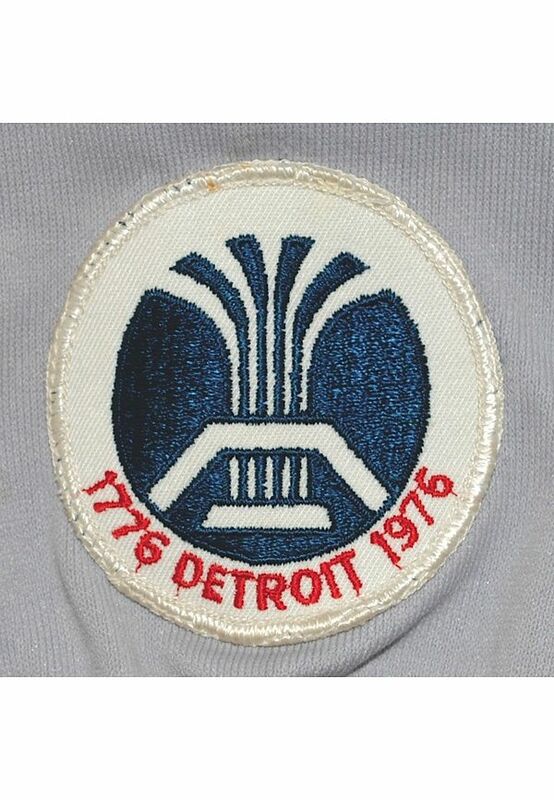 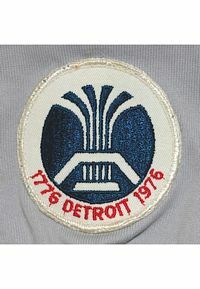 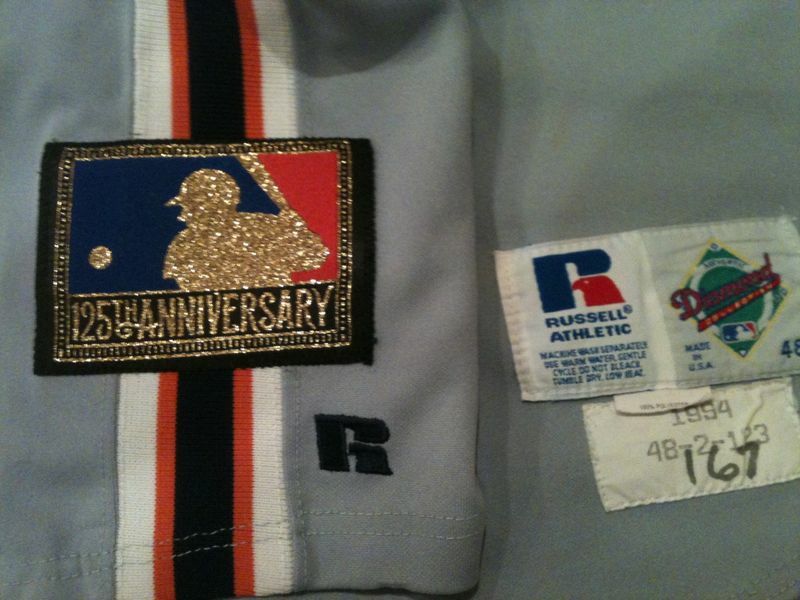 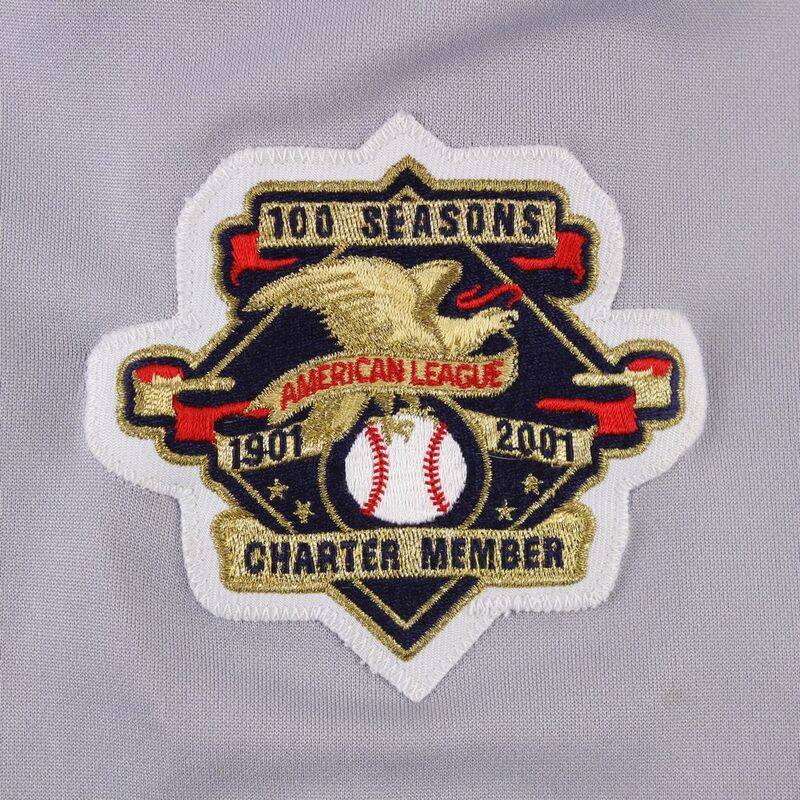 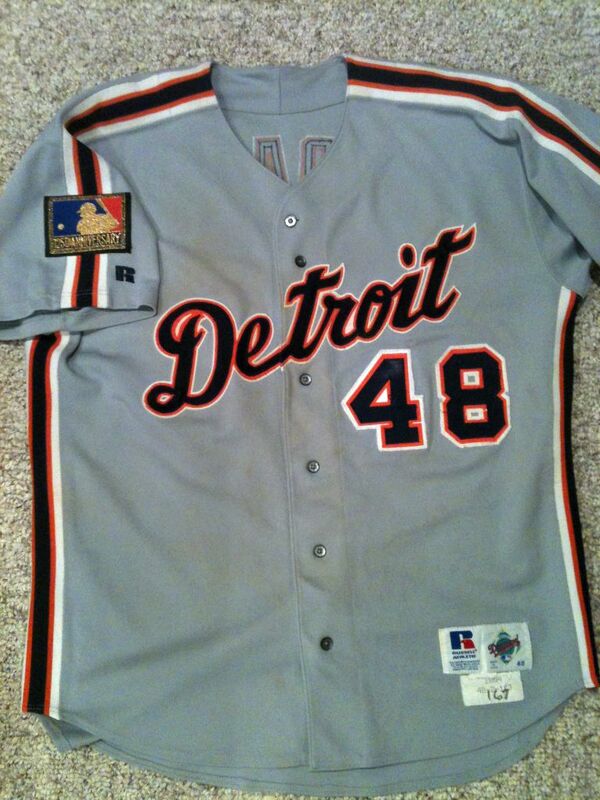 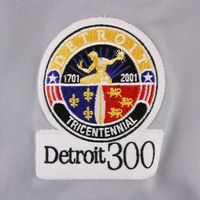 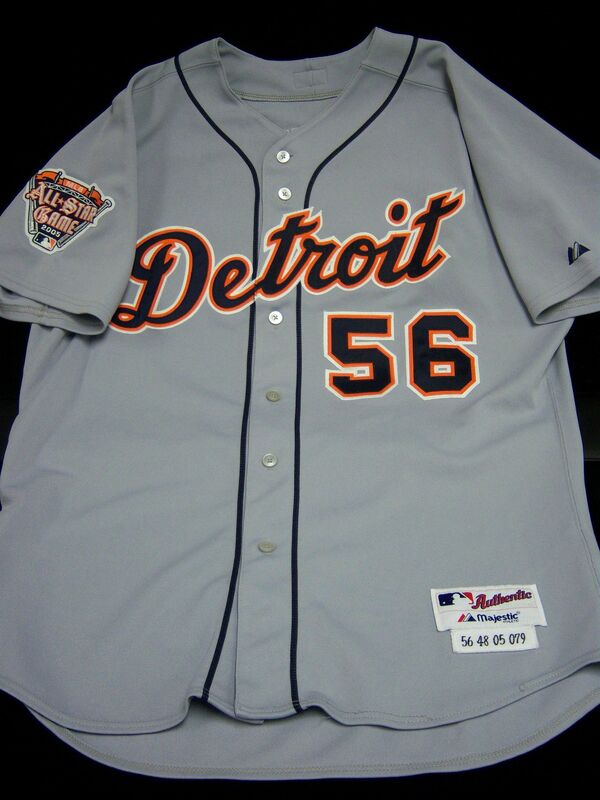 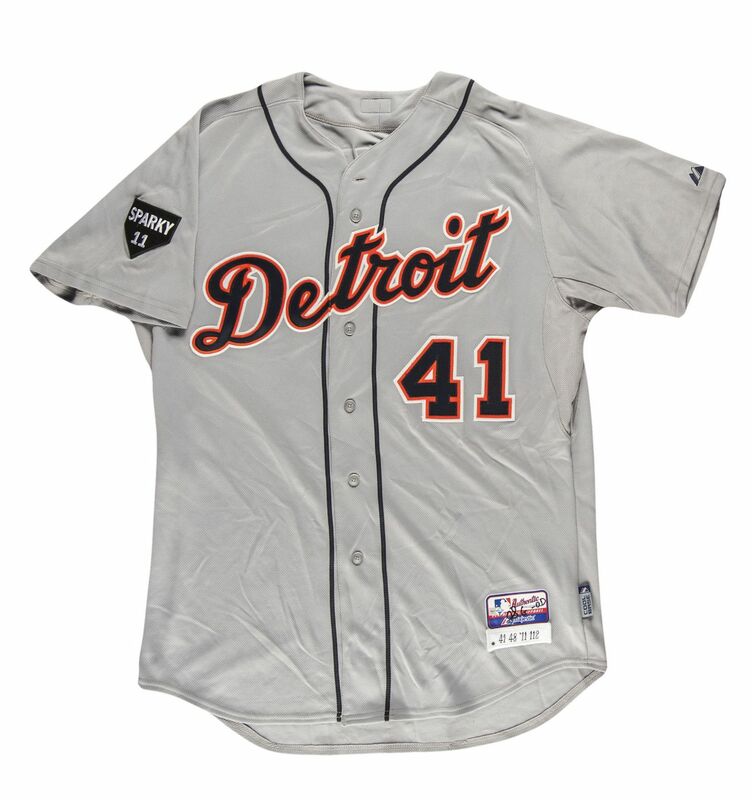 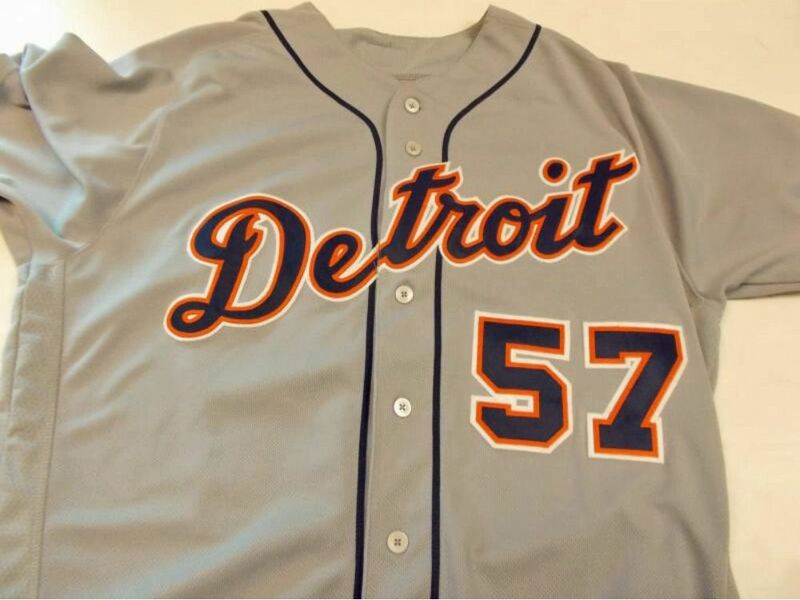 AL centennial patch worn home and road, plus Detroit 300th anniversary patch worn on road jersey in 2001. 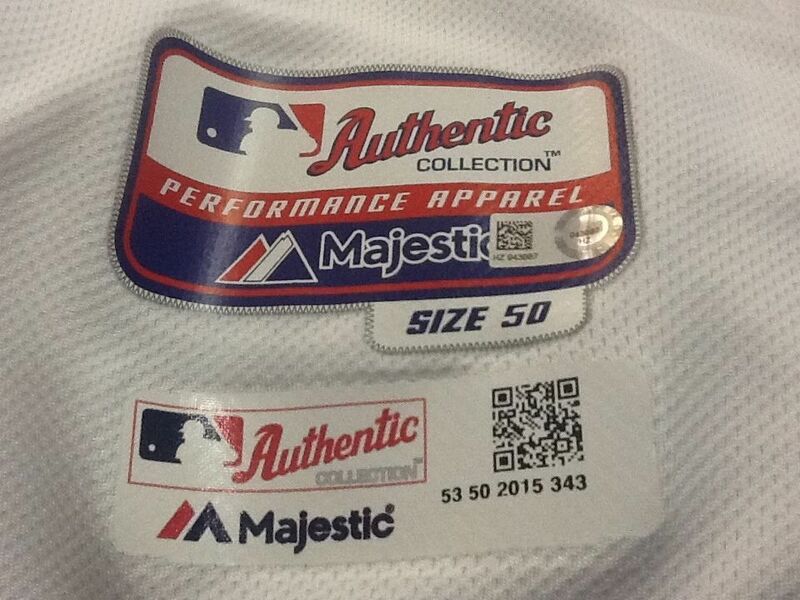 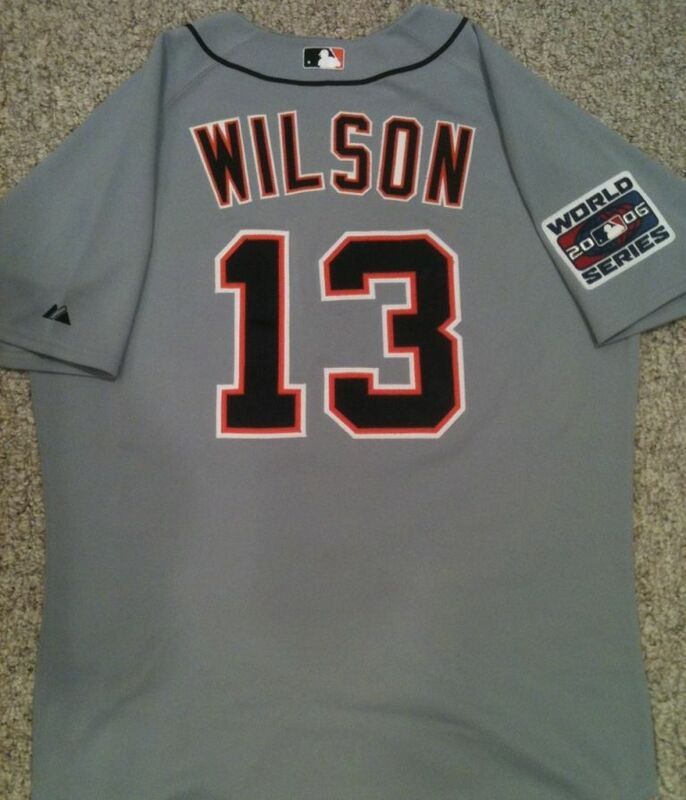 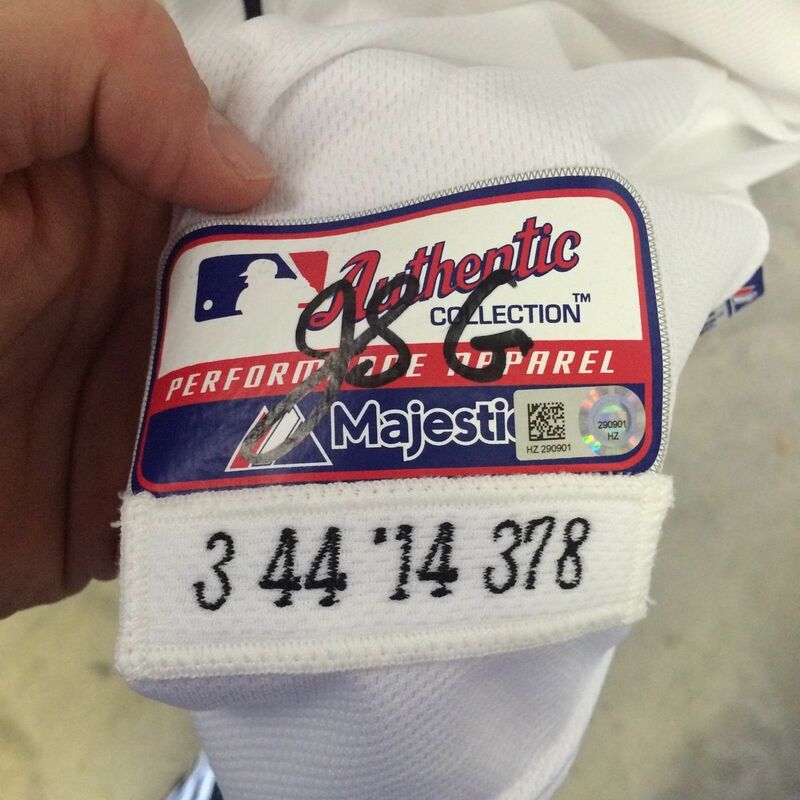 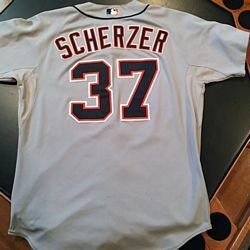 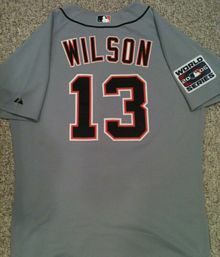 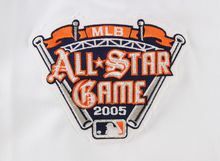 Worn at the All Star game. 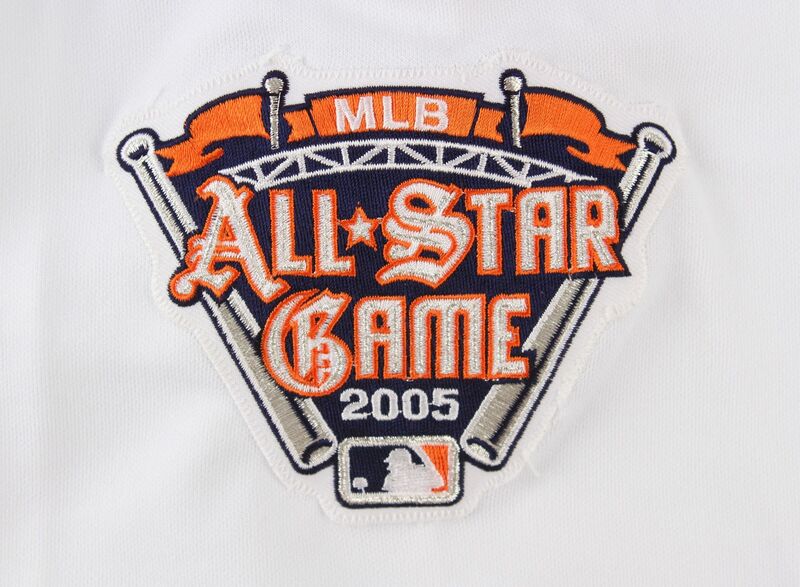 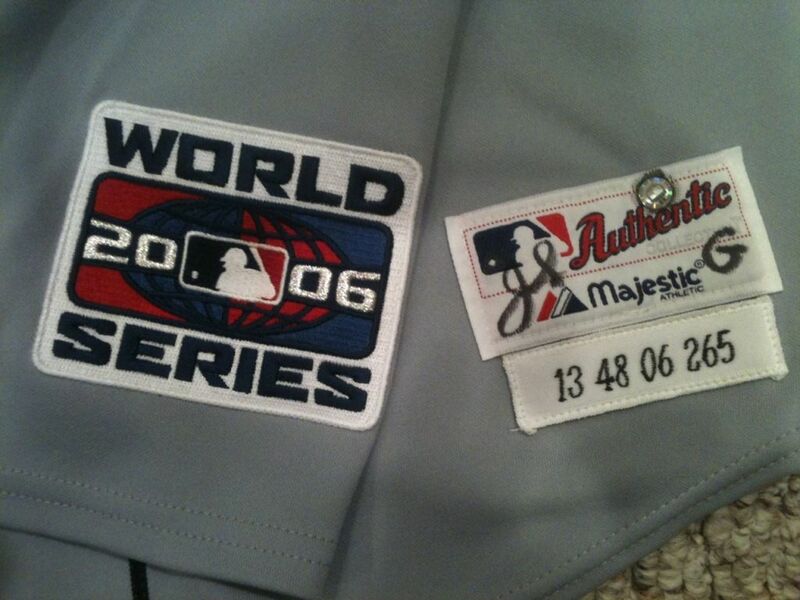 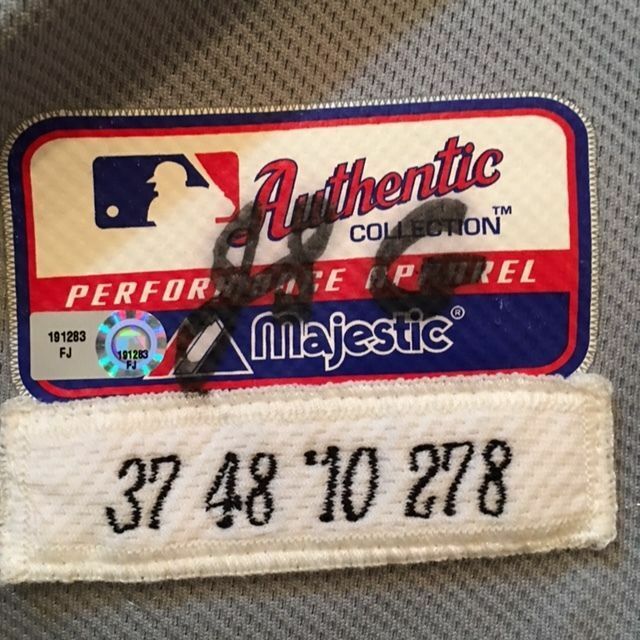 All Star game patch worn on both jerseys in 2005.